Make a decadent, aromatic, rich curry from scratch and even make your own spice mix. I’ve cooked this curry, and variations of it, loads recently, but think this version is the best. It does take a little longer, but you just can’t compare the flavours. I’ve given you options to make this a quick curry too, but I’d urge you to give the full version a try. You’re gonna love it!! Rogan Josh is a rich, classical style curry made with yoghurt as a sauce base, not onions. It was brought to Kashmir by the Mughal’s as they swept across North India. I’m captivated by Indian history and if you’re not a regular BHK reader, by way of background, I’m in love with India and have been there many times, travelling from the tip down south to the top, the Himalayas! I am yet to visit anywhere that is as enchanting and mesmering and the FOOD, lets just say it will take me this lifetime at least to explore such a vast and tantalising cuisine. 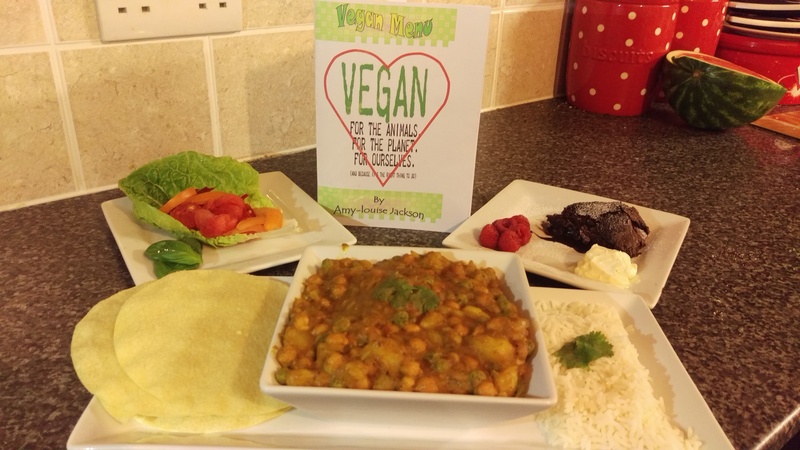 This curry is a good start, a staple and as ever, this is vegan food everyone one will love! How could you not? We get all the full flavours of roasted veg and mushrooms and treat it to a very special sauce. If you make this curry, please let me know, I’d be excited to hear about your spice adventures and how you found the flavour. Once you try this, you’ll never go back to shop bought or jars (unless you were in a real rush!) I love curries, but at this time of year, with it getting colder and darker, I think this style of warming, rich curry really comes into it’s own. 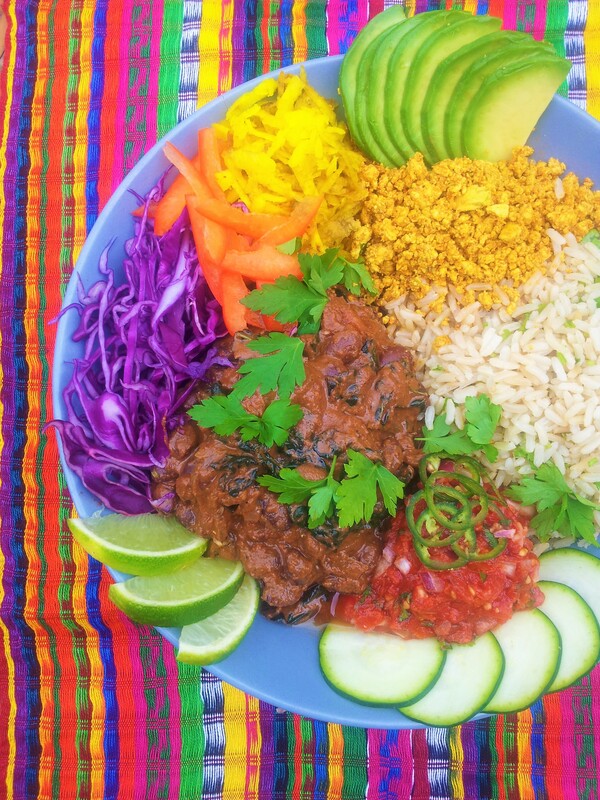 A radiant, colourful bowl of big flavours that’s perfectly suited as a winter/ autumn warmer. I get quite passionate when talking about Indian cooking. Does it show?! Spices! They bring everything to life. I’ve written so much about spices over the years, not to mention a hefty spice intro (with nutritional benefits) in Peace and Parsnips, our very own cookbook:) I talked a lot about spices in there, they’re so important to my cooking and dare I say, Indian is my favourite way of cooking. No, I don’t! It does depend on how the stars are aligned and what I fancy and all of that, but, we all know Indian food is utterly brilliant and this recipe does it justice I feel. I give you full instructions below about how to toast and grind your own spice mixes, this one is similar to a Garam Masala, a North India spice mix filled with warming spices like cinnamon and cloves, you can see the picture above and you can probably imagine the aroma when all that hits a warm pan. Out of this world!! Garam Masala – Hot Spice! Dry toasting spices like this in a pan adds complexity and brings out all the incredible aromas. There are many versions of Garam Masala (‘Garam’ – Hot, ‘Masala’ – Spice Mix). You could add Mace or nutmeg for example. But I think this is a good all rounder. If you don’t please let me know below. If you do, again, let’s talk in the comments. I love chatting about spices and learning new things. I’ve added smoked paprika and turmeric to this spice mix, they’re not classically ‘Garam Masala’, but I like them in this Rojan Gosh. You can also use shop bought spices here. See in the recipe below. Keep your spices in a sealed container and use well within the use by date on the packet. Smell them, if they don’t smell of much, they won’t add much to the curry. Most UK curries are different from those in India. Generally that is. In most of the Indian Restaurants in the UK, there is very tasty food, but it’s been modified to meet our Western palates. There are of course some incredible, authentic Indian restaurants in the UK, but the curries I find that most people enjoy and associate with Indian cooking, are not what I eat in India. We seem to prefer the big, rich flavours of Northern Indian cooking, much of which was influenced by the great Mughal Empire, who brought a lot of influences from Persia and surrounding areas. For me, that’s what curries represent, a melting pot in so many ways. I’m just not sure if there is the same approach with spices. 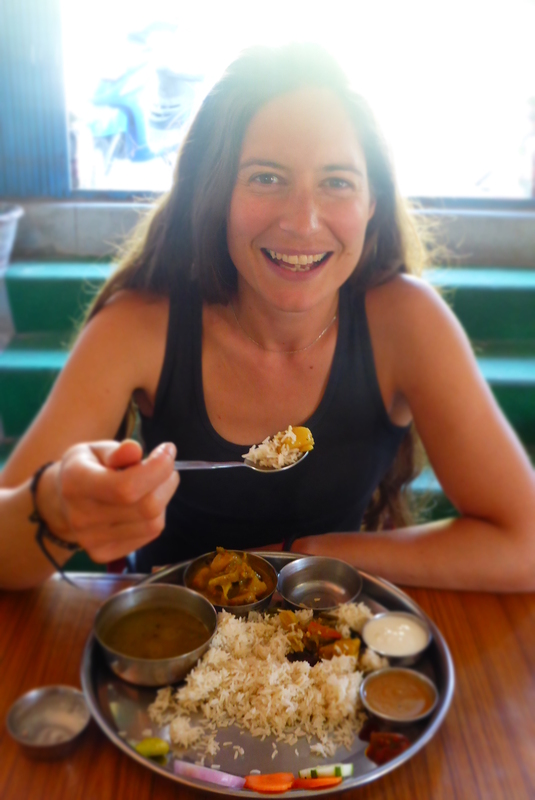 Many curries I eat in the UK seem to lack the vibrancy and fragrance of an curry in India. I must investigate this further. Where’s the magic gone? I was born in Leicester, a town with a rich Indian restaurant heritage, so I know where to get a mighty fine curry. But it’s not a standard. So we’ve three choices, go to Leicester, jump on a plane to Delhi, or make your own? Kashmir is a stunning region in the very North West of India, and a very good song of course (click here for Led Zep’s version of Kashmir). Apparently Robert Plant had never even been to Kashmir when he wrote it, just liked the sound of it. Maybe he just loved a good Rojan Gosh? Kashmir borders Pakistan and historically has seen many foreign invaders cross through it, down into the Gangetic Plain, from Alexander the Great to the Persians, although I don’t want this to sound like a history lesson, I’m just fascinated with a dish like Rogan Gosh (loosley translates as ‘Rojan’ – to stew, ‘Gosh’ – red). A delicious plateful of history. 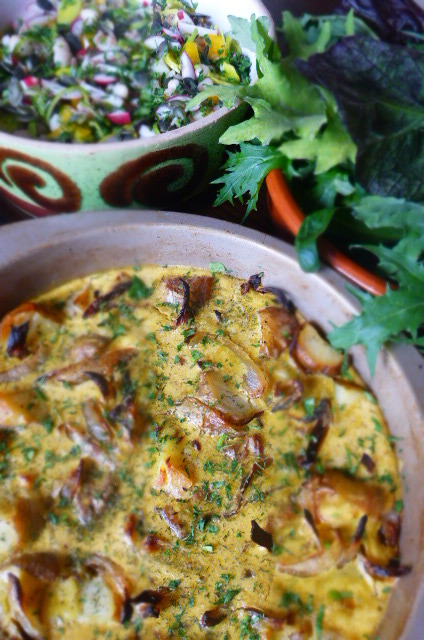 I’ve gone for mushrooms and squash here because they’re seasonal and I love them. But you can use similar vegetables, carrots, potatoes, peppers, whatever takes your fancy. The key here is the sauce. That’s where the magic is! I mentioned that this was traditional, that was a small, white lie. It is pretty traditional, but in Kashmir they may use something called Cockscomb Flower to give the curry a more reddish hue. But I’m happy with this colour. Kashmiri chillies are quite important here. You’ll find them in most supermarkets and especially Indian/ Asian food shops. They are milder than many chillies. We want lots of chillies in the Rojan Gosh masala, but not loads of heat. If you don’t have dried Kashmiri chillies, that’s cool, go for chilli powder or cayenne pepper, anything to add a little heat to the curry. Saffron can also be added here, but I think it just gets lost with the other spices and is basically a waste of our precious, and not inexpensive, saffron. Spices, you will have too much here for just one curry, but if you’re going to make your own spice, you may as well make a decent batch I say. Keep them in a sealed container or jar. Label them up, with a date, or give them away as a gift. In my experience, people love the gift of spice! Preheat a fan oven to 200oC. 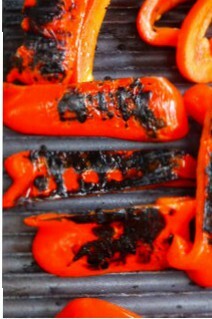 On a baking tray lined with parchment, place the red pepper and squash. Toss in a little salt and cooking oil. Roast in the oven for 25-30 minutes, until soft and slightly blackened in places. For the spices – Place a pan on a medium heat, add all the whole spices and toast for 4-8 minutes or more, tossing them and making sure they’re all toasted and smelling fragrant. They will take on a slightly darker colour and smell ‘toasty’. Be sure not to burn them, the best way to check this is the smell and the look. You don’t want any black bits at all. Some people prefer darker spices, some prefer lightly toasted. I’d start with lightly toasted. Add the ground turmeric and paprika a minute before you finish toasting the spices. Place all the spices in a small blender or spice grinder (coffee grinders are also good), and blitz until a powder forms. Use some in the curry and store the rest in an airtight container. Garam Masala is a versatile spice mix. For the curry paste – Place the roasted red pepper in a blender with the other curry paste ingredients and blend to a smooth paste. For the curry – In a large frying pan, warm 1 tbs cooking oil and fry your mushrooms for 5 minutes, until they’re soft. Add the curry paste, thinning out with water or soya milk (creamier) as needed. Once the curry paste is bubbling away, spoon in the yoghurt and check seasoning. Now add the roasted squash, chickpeas and greens. Warm through from 5-7 minutes, then serve scattered with freshly chopped coriander with naan, chutneys and rice. This would be delicious with our Mango and Papaya Chutney or Cashew and Green Pepper Pulao or even Quick Carrot and Ginger Pickle. Look at where we live! Nice innit. Snowdonia looking stunning in the autumn sunshine. Sometimes the mountains around here remind me of the Himalayas. Squash is bang in season at the minute, there are so many varities. 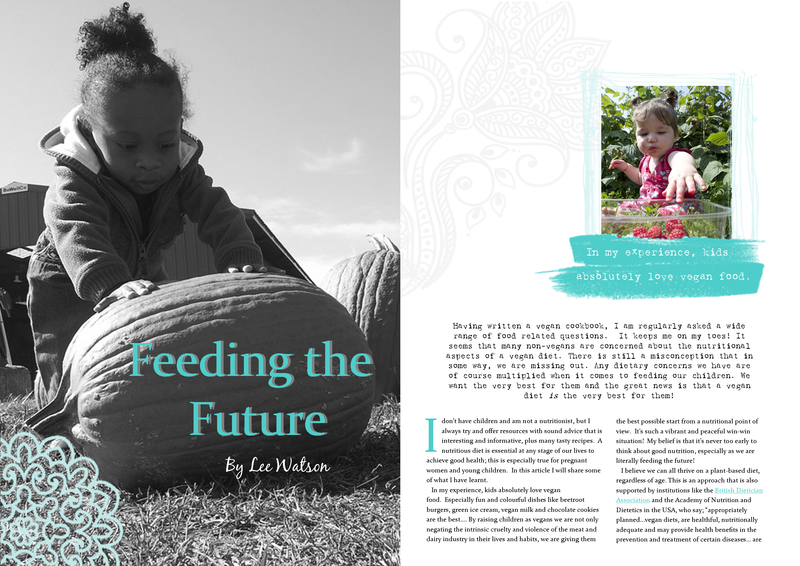 If you’re reading from the US, were of course talking Winter Squashes here. 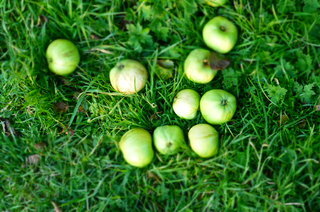 They are a rich source of vitamin C, A and plenty of fibre and minerals. Also remember the seeds, you can clean and dry them and they are amazing roasted in the oven for 10-12 minutes. Come and join us for cooking workshops and holidays soon, check out our EVENTS page HERE. Our new NEWSLETTER is out very soon, sign up HERE (it takes a few seconds). Lots more recipes, news and interviews from Jane and I. A classic meal that can be ready in minutes. 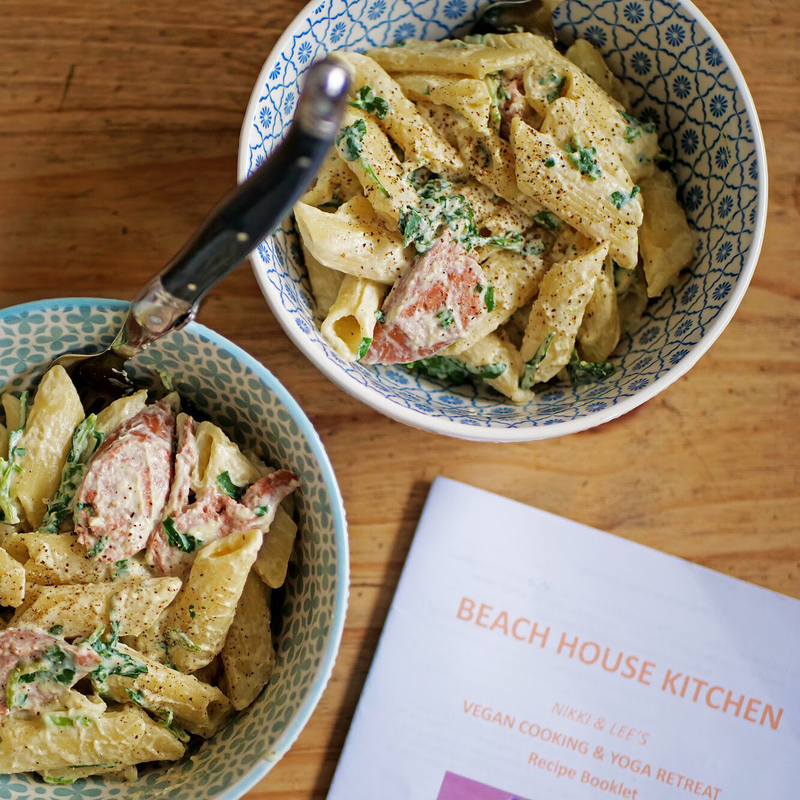 Vegan Carbonara can be made loads of ways, but here we make it with tofu, so it’s creamy and rich, but light at the same time. We all need staple recipes like this!? Something quick and satisfying that everyone enjoys. Some of you have been asking about this recipe for a while now, I used to cook it at Trigonos quite a bit, so I’m pleased to finally get around to it (with a little help from our friends;). 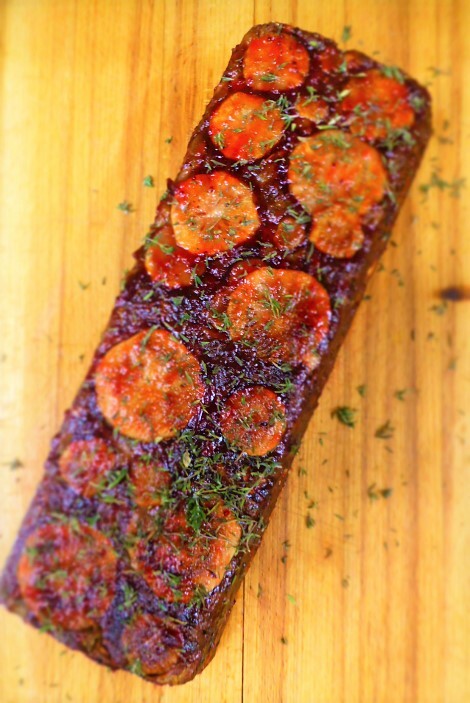 We’d like to thank Jen at Veganuary for sharing this recipe, this is Jen’s photo, over on Instagram. We’ve been massive fans of Veganuary for years now, so to see it blossom in such a way is incredible. We even saw Matthem being interviewed on the BBC! 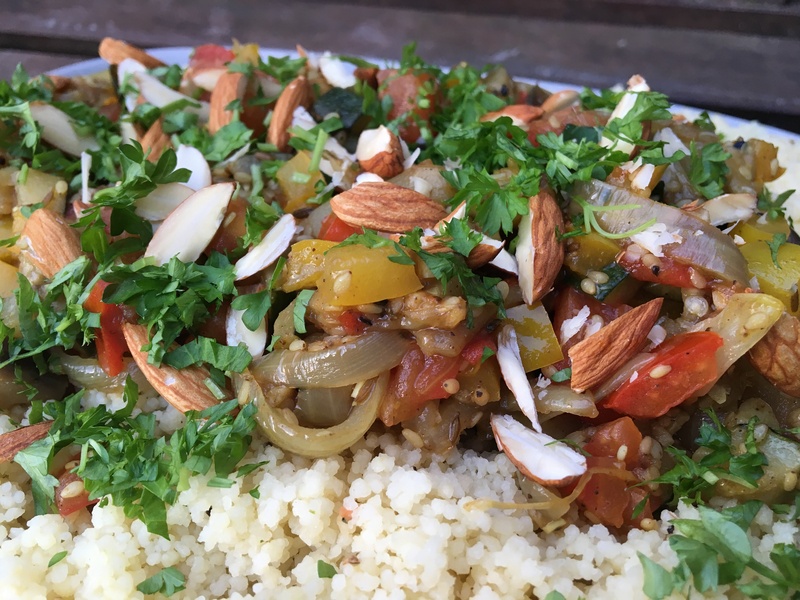 As you probably know, we cook all over the UK at events and this recipe was from a cooking and yoga weekend at Trigonos in December. It’s true, we are not Instagramers but maybe one day we’ll make it over there. What do you think? Shall we venture into Insta-land? It does looks awesome! Some incredible vegan cooks over there doing amazing things. 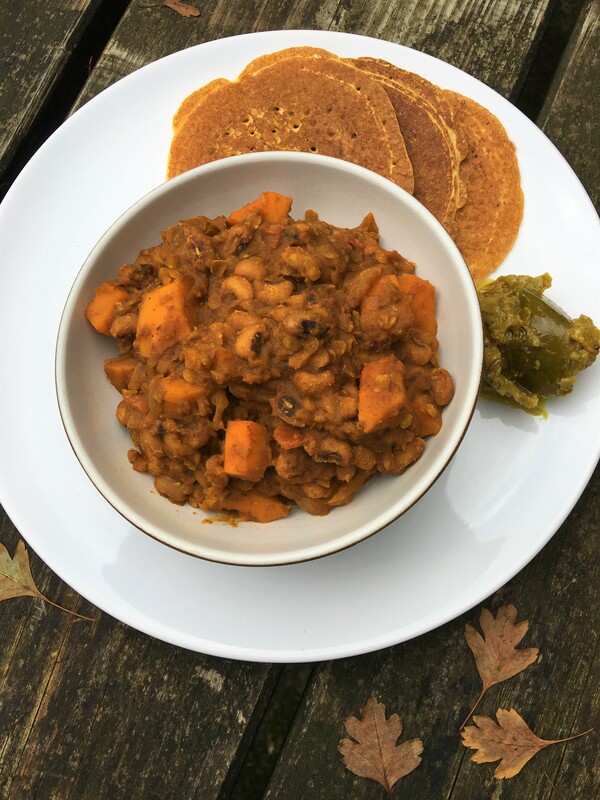 VEGANUARY 2018 – HOW DID IT GO? Did you try out Veganuary this year? How was your experience? You weren’t alone, over 150,000 people were joining you. We know a load of people who gave it a go and some have stayed full-time vegans and many are just eating loads more plant-based meals. Everyone we have talked to feels the benefit of a vegan diet, especially when tried out for a whole month, sometimes it can be hard at first with cravings for our favourites foods and the body adjusting, but then, PING! 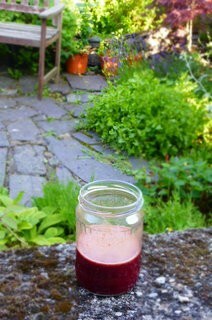 Plant power takes over and we feel lighter, more energy, better digestion, brighter eyes and skin and the list goes on. How cool is that/ this! This recipe is a real staple for us, we love to change up the pasta and make it with a full range, from wholewheat to pea, corn to buckwheat, there are so many choices out there now and many are really good quality. There was a time when gluten-free pasta would be quite soggy and have a dodgy texture. Not any more. This sauce can be taken in so many directions, but we like it as it is, a nice touch of garlic and the freshness of the parsley. We love to green it up too, because we put greens in everything! We just hit the 2000 mark over on our Facebook page, 2000 happy cooks with healthy outlooks, good vibe vegans, it’s quite a landmark for us. Thank you to you all for your amazing support over the years, feel free to share the BHK blog with all your friends, fans, followers and families. We couldn’t and wouldn’t do this without you. 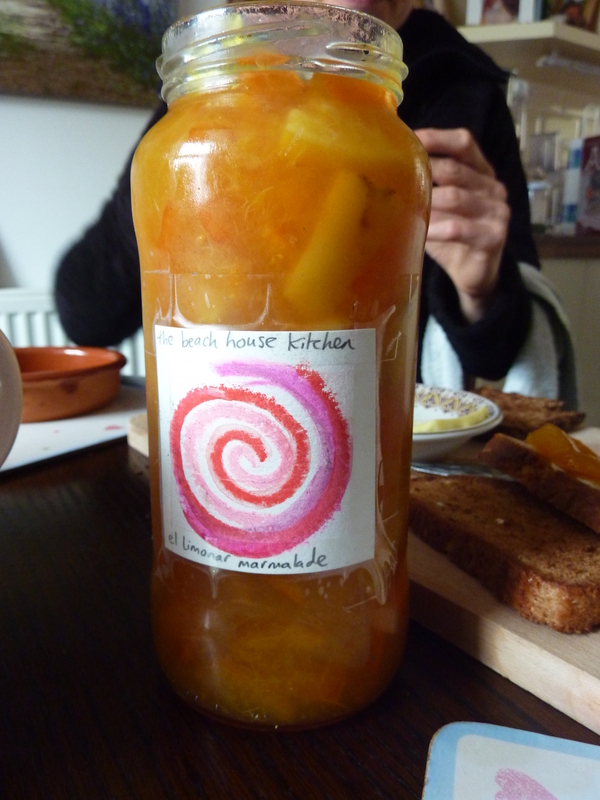 I’m in the BHK today, recipe testing and coming up with new things. More recipes coming soon right here, I’m really feeling quite Japanese at the minute…….but until then, carbonara! 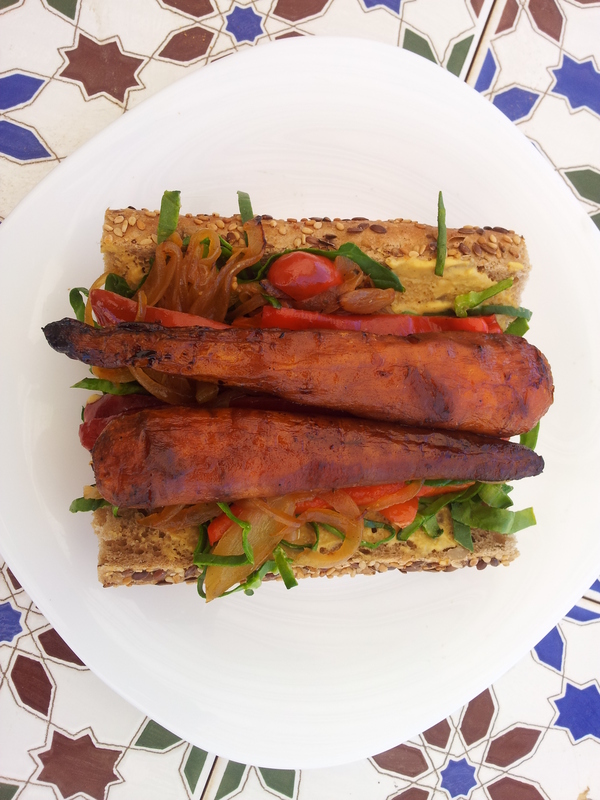 Jen used slices of vegan sausage in this picture and left out the greens. We love it with Mushroom Bacon. Yum! Our version coming soon. If you can’t find silken tofu, firm tofu also works just fine. 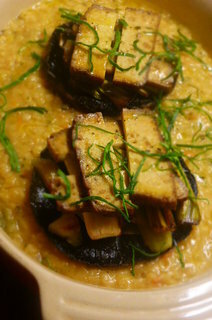 If you or the people you’re cooking for are still a little freaked out by tofu, this is a good dish to cook for them. Just don’t show them the nutritional yeast flakes just yet!! Maybe after dinner. We’ve all heard the stunning ‘looks like fish food’ jokes a zillion times before. But they taste awesome! Gluten-free option, just use gluten-free pasta. We are digging pea pasta at the minute. Great colour!! In a small frying pan, warm the olive oil on medium heat, add the garlic and gently fry for 1-2 minutes until nicely golden. Allow to cool a little. Place all the bits for the carbonara sauce, including the cooked garlic oil, into a blender. Blend until smooth. Taste, adjust salt. How creamy is that!!!? Cook your pasta, drain and stir in the carbonara sauce. Now stir in the watercress and leave with a lid on for a minute or so. If the carbonara gets thick or sticky, this might happen if you don’t serve it straight away, pour a splash of plant milk in and gently stir. Serve in shallow bowls, topped with sun dried tomatoes/ mushroom bacon and parsley. Best with black pepper, vegan parmesan and a nice crisp salad. Tofu is a real genius food for so many reasons. We can all get our hands on it really easy now in the UK, you’ll find it in most supermarkets. Not only is it a versatile ingredient, bringing a unique texture and flavour to dishes, its also completely packed with nutritional properties to make you shine. It’s full of protein to start with, also minerals like manganese, phosphorous and selenium. It even contains all of the amino acids and good levels of iron and calcium. 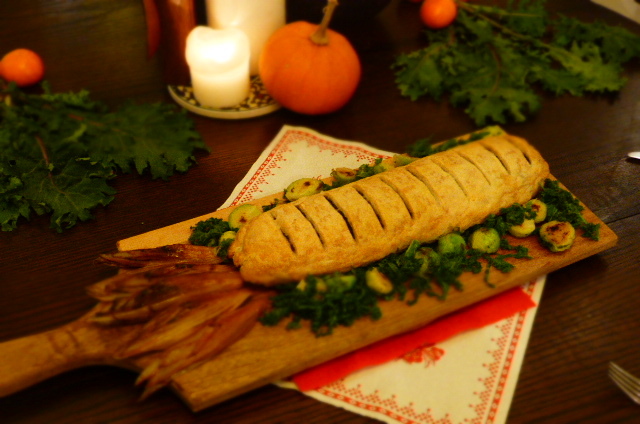 We all need a good nut roast up our festive sleeves!! This is a tasty centre piece with all the flavours of Christmas, that won’t take an age to cook. It is also remarkably healthy, but we won’t dwell on that, after all, it’s nearly Christmas, time to feast and be merry!! I’m sharing this one on the fly, its a busy time of year in the BHK! As I’m sure it is in your home. I took this picture whilst cooking for lovely group at the weekend, I haven’t had anytime for blogging of late, but this recipe is one we’re enjoying and lets face it, us vegans need a nut roast to lean on (then gobble) at this time of year! 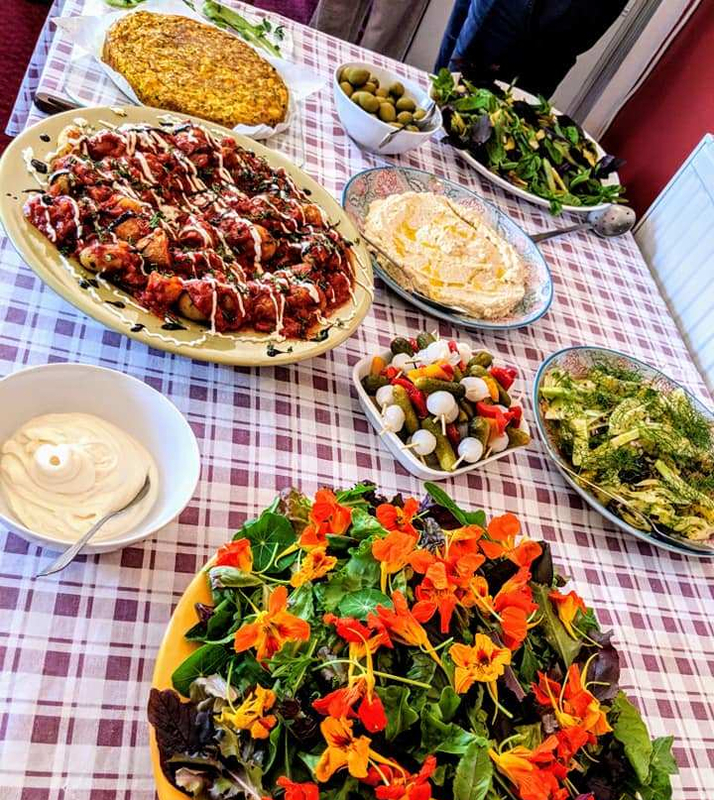 I did a little poll recently in the BHK Vegan Cooking Group, asking what was the stand out vegan dish for Christmas lunch and Nut Roast ruled. 1st by quite a bit. I was a little surprised, I love nut roasts, but many people have nightmare stories about bland, crumbly roasts, which is the last thing we want when we are mid Xmas feast. This is a substantial nut roast (aren’t they all!? 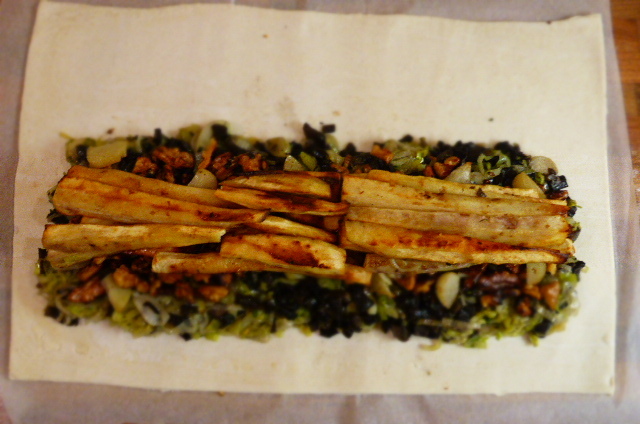 ), with a nice layer of roasted parsnips in the centre. It cuts nicely into slices and I like the idea of glazing things at this time of year. Makes it extra special and gives it an attractive finish. I served it with full trimmings at the weekend, roasted Parmesan sprouts, mash, proper gravy, roast squash and swede, a few types of kale and a little red onion and parnsip tart tatin thrown in. 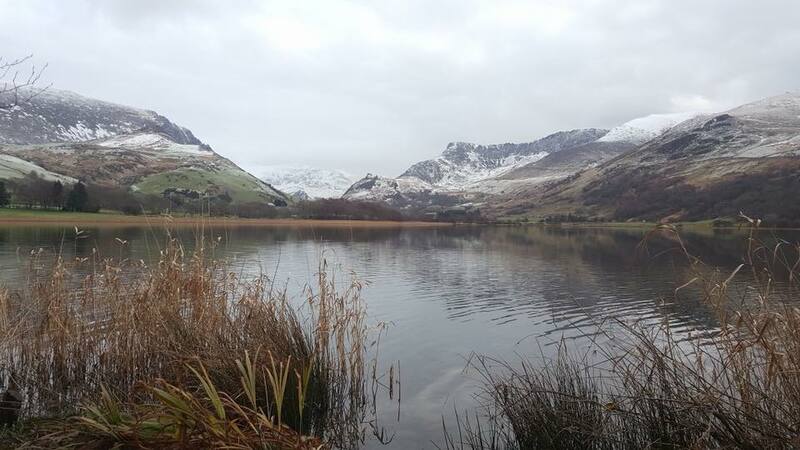 It was snowing outside and Snowdonia was looking like a winter wonderland. The perfect Christmas scene. If you have some leftover mix, this would make awesome burgers. Festive burger twist? Why not! This roast will freeze well and can be made in advance. In fact, its better when made the day before. Don’t dig parnsips. That’s cool, any root veg will be fine here, something like carrot or squash would be great. Nice colours too. 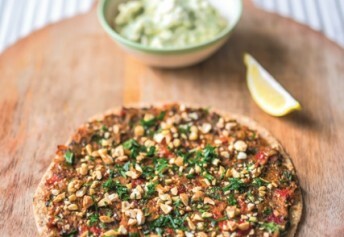 Walnuts are great in these dishes, they break down nicely, adding flavour and texture. You might prefer hazelnuts, which are also very delicious here. 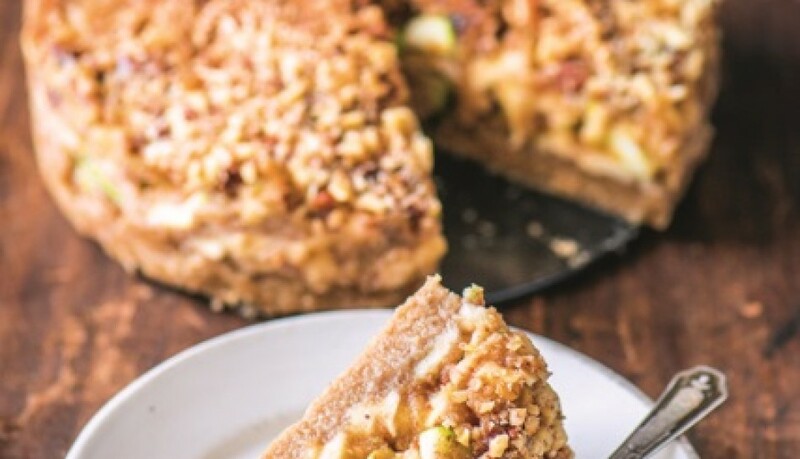 Just use gluten-free breadcrumbs to make this a GF treat. Slice the thick end of your parsnips into thin discs, with a few smaller discs from the thinner end. This will be used for decorating the top of our roast. Cut the rest into thin batons. Preheat an oven to 190oC. Trim the top of the garlic off to slightly expose the cloves. On a baking tray, toss the onion, garlic and parsnip batons (set aside the thin slices) in oil and a little salt. Bake in the oven for 25-30 minutes, until all is soft and caramelised nicely. The onion may need a little longer to go nice and soft. Leave to cool and pop the roasted garlic cloves from their skins. Remove any skin and roughly chop the onion into small chunks, keep enough parsnip batons for a decent layer in the middle of your roast, chop the rest up. Pulse the chestnuts and walnuts into a rough crumb in a food processor. Place in a bowl and mix in the roasted onions, chopped parsnips and garlic, herbs, breadcrumbs, mustard, cinnamon, cranberry sauce, flax egg, salt and pepper. Mash together well and taste to check seasoning. Remember that flavours will develop when cooked. If it’s a little lumpy, that’s fine! 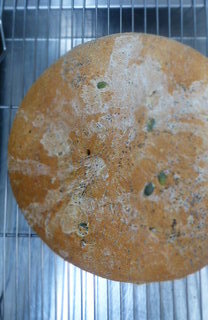 Line and oil a 900g/ large loaf tin with baking parchment, lay out your parsnip discs until they cover the base of your tin. 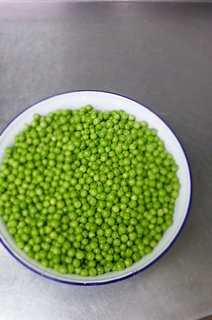 Arrange them nicely, this will be the top of your roast. Spoon in half the chestnut mix, press down snuggly and level out with the back of a spoon. Arrange a layer of parsnips batons, press down a little until snug and spoon over the rest of your chestnut mix. Smooth and press down evenly to make a nice neat finish. Cover with foil or baking parchment and bake for 45 minutes, then take off the foil and bake for a further 15 minutes. There should be a nice brown crust. Leave to cool for 15 minutes in tin before turning gently out onto a serving plate and again, leave for 10 minutes before slicing. Makes it easier and slices stay together. In a small pan, mix together the cranberry sauce and whiskey, bring to a boil and simmer for 1 minutes. Keep warm. Glaze the top of your roast with the cranberry sauce and sprinkle with fresh thyme leaves. The loaf mix can be made the day before and left in the fridge until needed. Looking for a quick and easy Christmas dessert? 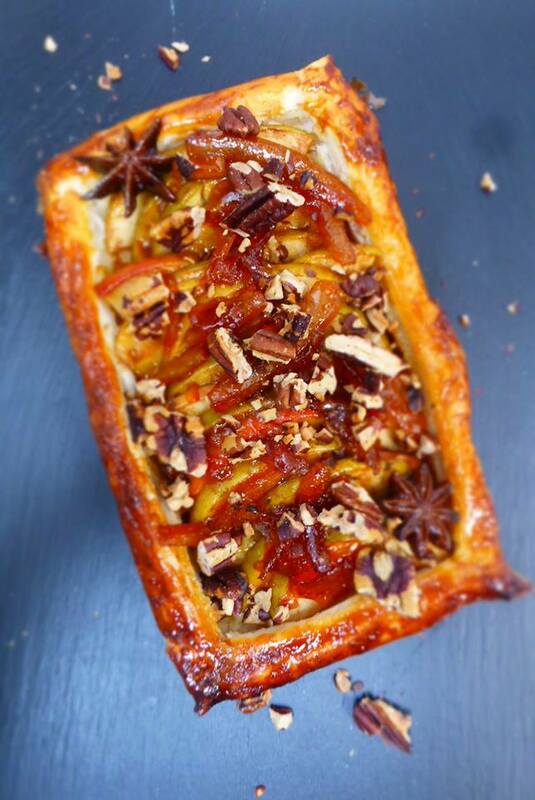 Why not try this Spiced Apple & Pecan Tart. Follow the Apple Tart recipe in Peace & Parsnips, adding some spices to the marmalade, cloves, star anise, cinnamon and maybe a few shots of whiskey/ brandy. Top it all off with chopped roasted pecans. We had this for breakfast! Might not be everyones bowl of morning happiness but Jane and I love curry for brekkie, a pleasant habit we picked up at train stations and little bus stops in India. We wanted the all-time classic ‘Chana Masala’, but we didn’t have chickpeas!? What’s going on there?!! I feel like I have failed our household. Still, it lead to this creation which I was so pleased with, I felt the urge to share and write and celebrate the beauty of a simple curry. We were getting tired of the smoothies and bowls of nuts and fruits and things routine, we wanted some SPICE in our early, sleepy eyed life! 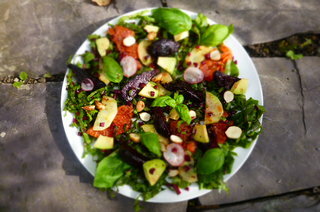 When the grey tickles us, as it can at this time of year, we need to put some rainbow flavours and magic into our food. Spices are magic dust right?! Does any food have as much pizazz and down right tastiness as a deep and potent curry? It can enliven the senses. The sheer complexity of flavours mingling and merging, having a massive party all over your taste buds? This curry doesn’t have to be eaten for brekkie, but do let us know if you try. Ditch the fry up this Sunday AM and get spicy!! I’ve been to India many times, it has become my second home. I love living a life of contrasts, living on a hill in middle of nowhere, slightly mossy, Wales, straight to the honking depths of down town Delhi, thats my kind of contrast. Mix things up. Keep things vibrant and interesting. 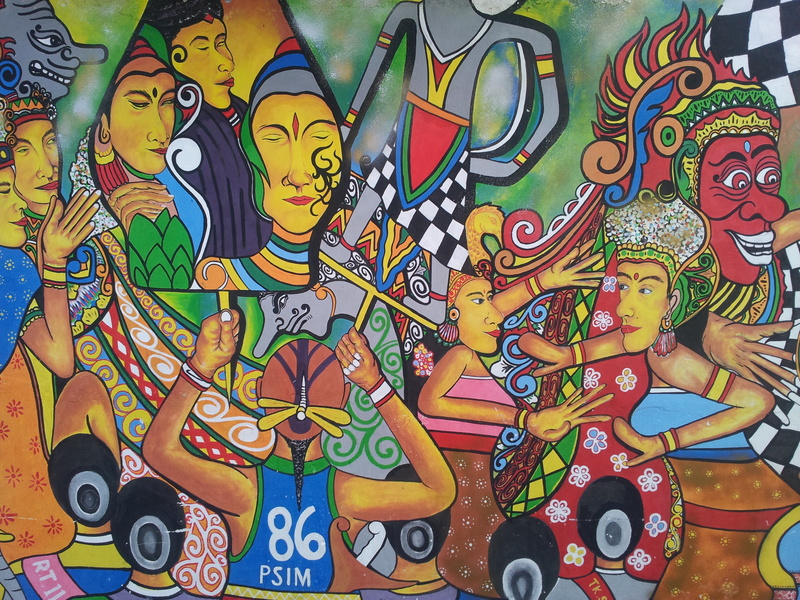 For me, India is the country with everything going on within its borders, travel there is rich. I know I go on about the food all the time, but, it is incredible. Consistently. Mind boggling in variety. Like I’ve died and gone to a Dhaba. Intensely orange – Pumpkin this time of year they be. If you’re looking for the best spices and Indian/ Pakistani/ Bangladeshi/ Nepalese etc ingredients, I recommend a regular visit to your local Asian shop/ supermarket. It’s where all the best ingredients will be hiding and normally for very reasonable prices. I find them a perfect location for spice worship. Eastern cooking treasure troves, designed for real food lovers to disappear into for days, reappearing with carfull’s of fantastic ingredients, pickles and inspiration. I say, take the afternoon off and have a good luck around, ask for help and guidance. For me they’re like a flavour library for a cook, sifting through the ingredients and always finding something new and interesting to take home and play with in the kitchen. The curry powder we used here was recommended to us by an Indian man in one of my favourite Asian supermarkets in Newcastle. He wasn’t wrong, its brilliant, fiery and fragrant. Curry powder has a bit of a bad name, but its just the same as any spice mix like bharat, ras el hanout etc. If you buy a decent one, it works well. Of course, making your own is the holy grail of any spice enthusiast. But having the time and means to do that can be a challenge. This is a quick dish, so lets keep it simple. This is no traditional curry, but its not far off. 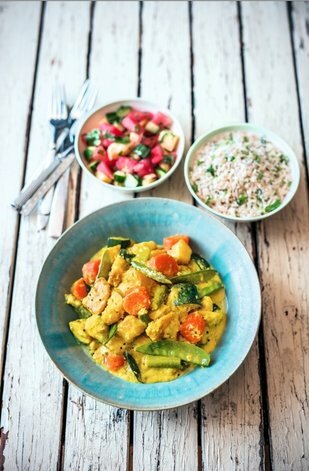 I’ve made this curry super easy for you, I’d love you to cook and enjoy it! With only two spice mixes, garam masala and curry powder, which most of you will have knocking about in your cupboards and a quick cooking time. If you don’t have the spice mixes, just try making your own up using things like turmeric, cumin and coriander for the curry mix, adding a little cinnamon, cloves, and cardamom for the garam masala. Could be a very nice experiment! I add red lentils to thicken the sauce up and make things hearty and substantial. I used pumpkin, because its their ultra orange time of year, but use any vegetables you like here and a nice idea is stirring some greens in just before serving, a couple of handfuls of spinach leaves is cool. In Nirvana, this is breakfast! I like the curry quite thin, more a thick daal than a chunky curry. Better for dipping warm chappatis into! The lentils will just keep sucking up the water, so just keep some warm water handy when cooking, preferably a recently boiled kettle (easier) and top up the water as you fancy. Mash it up!! Your garlic and ginger and chilli as best you can, blending them or whacking them in a pestle and mortar is best. Releasing all their vibrant potential. Leaving the curry to cool slighty, let it sit for 10 minutes with a lid on, will help the flavours to mix and mingle, get deep and meaningful. I’ve gone easy on the chillies because Jane is anti-chilli, but you go wild if you like! The chickpea chapatis in the photos are made by whisking some gram flour, water and salt together, until a double cream texture forms, and frying in a little oil. 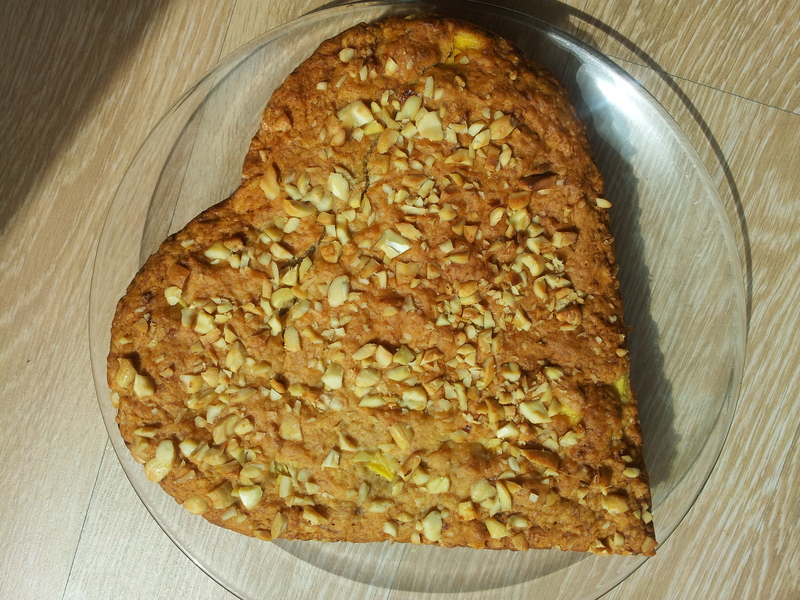 Simple, gluten-free, healthy, tasty……. 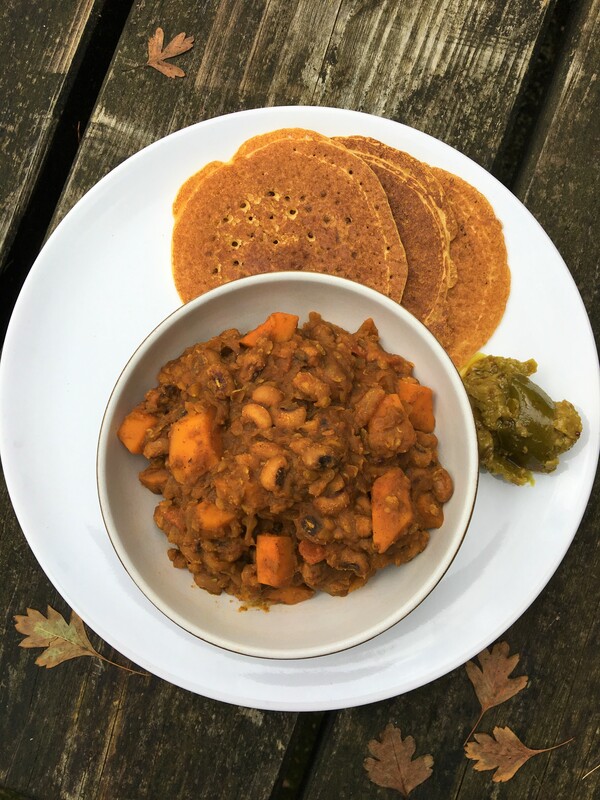 Simple Black Bean & Pumpkin Curry Serving suggestion – eat outside, in a garden. In a large sauce pan, fry the onions until they are texture like sun (golden brown), then stir in your garlic, ginger and chilli, stir and fry for a minute and then add the lentils, beans, tomatoes, tomato puree, curry powder, squash, water and stir together. Bring to a boil. Cook on a fast simmer for 10 minutes with a lid on, stirring occasionally to stop the lentils sticking to the bottom. Add your garam masala and cook for 5 minutes more. Stir in a little more water if its getting too thick. Once the squash is nice and soft, stir in the lemon juice, check seasoning and serve. If you like coriander, sprinkle some chopped coriander over the dish. 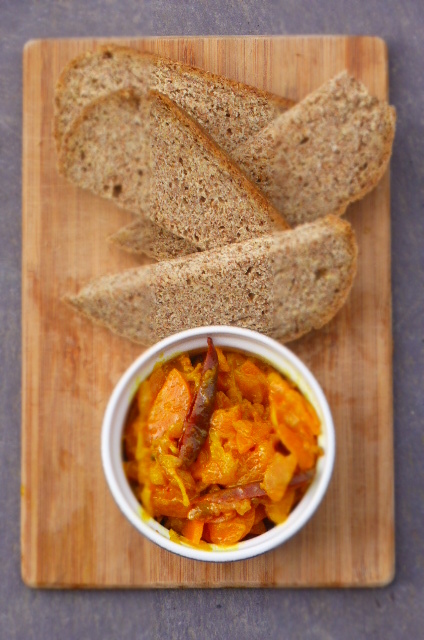 I like it with warm chapatis or chickpea chapatis, dip them in and enjoy! 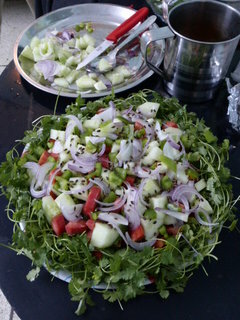 I also served it with some green mango pickle. One of my favs. Pumpkin is full, full of good things. Especially this time of year when they’re bang on seasonal and hopefully quite local. Very orange, means goodness. 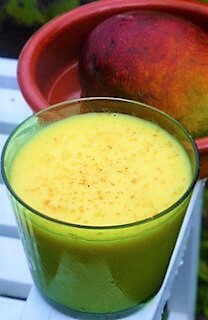 Lots of vitamin A, one cup contains 200% of your daily need. You’ll be seeing in the dark in no time. It’s got loads of fibre and pumpkin is also said to keep our skin shining. Bananas are famous potassium sources, but pumpkin actually has considerably higher levels of potassium than bananas. Vitamin C, also in the mix somewhere, they’re just one of the best things we can eat at this time of year and throughout winter. Superstars!! PS – Please don’t throw away the seeds, clean them off and roast them for a while in an oven. You will not regret the slightly time consuming picking orange gloop off them. 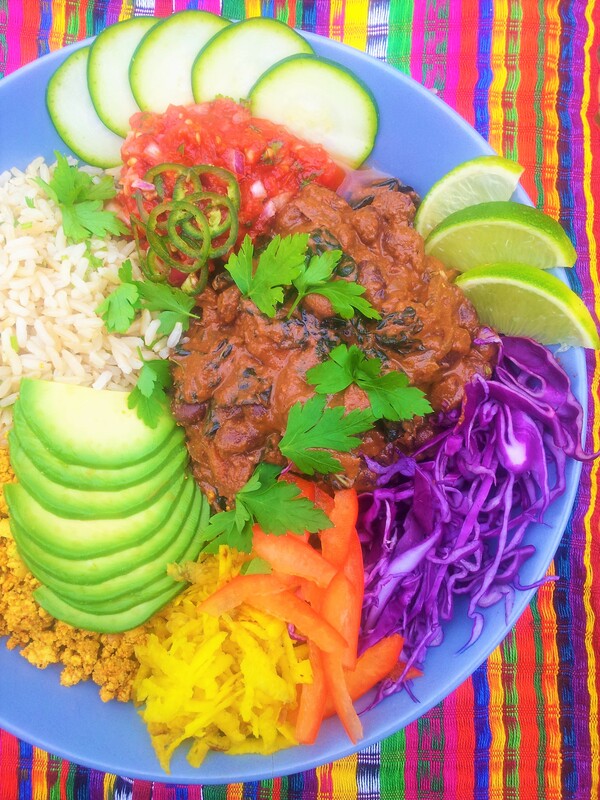 Mole sauce is such a Mexican classic! 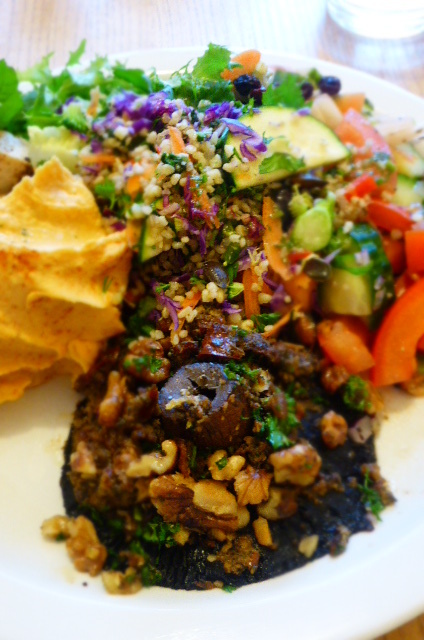 A full-on fiesta of flavours; spices, chilli, smoky chipotle, creamy black beans, chocolate and here I’ve added some cashew butter instead of the traditional peanuts. These beans are quite a mouthful! Spicy, chilli, creamy with a tickle of lime at the end and when served with smoky tofu bacon and all your favourite Mexican condiments; salsa, avocado/ guac etc you’ve got a Mexican feast. 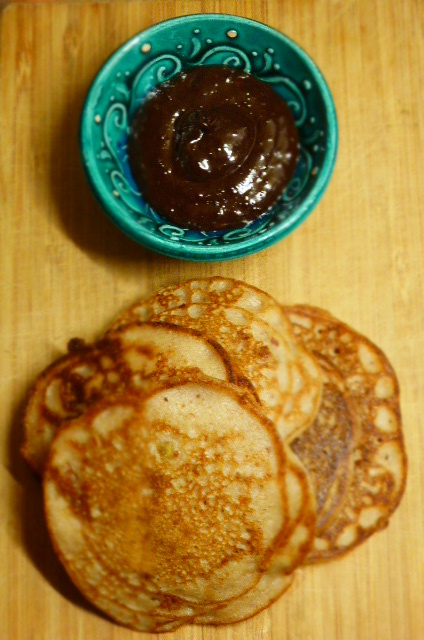 There is a black bean & cacao recipe in Peace & Parsnips, this is a new twist on that really. I was lucky to travel from the North to the South of Mexico by car a good few years ago. Zig zagging down Mexico I did munch the odd taco and was blown away by Mole! I’d never heard of it before and was mesmerised by the complexity of it, the stories of how it takes days to make (something to do with grinding and roasting all the ingredients). It seemed like such a legend! It is. Normally served as a treat during a massive, joyful party, which are common in Mexico, so much so that ‘Ir a un mole’ (Go to a mole) is used to say ‘Go to a wedding’. Mole comes in all shades in Mexico, of which Mole Poblano is probably the most famous, the flavours of which, if not the techniques of cooking, my mole beans take after. 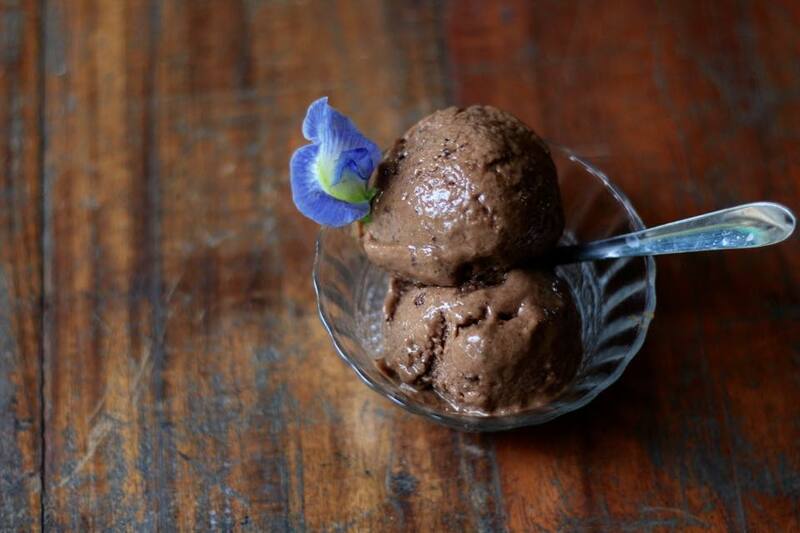 How many savoury dishes are enhanced and inspired by chocolate so effortlessly and deliciously? I have used Willie’s 100% Chulucanas Peruvian Cacao, bought by the block, you will find it in supermarkets and of course, on line. This is the best cacao I’ve ever tasted in the UK. Grated into this dish, it will be sublime! Adding richness and depth to the dish. However, other cacao and cocoas will be more than fine also. I’m thinking about experimenting with a cacao gravy for Christmas dinner. I’ll let you know how that goes. I’ve streamlined the traditional recipe here big time, it’s normally quite involved and uses a whole cupboard of ingredients, spices and a whole gaggle of Mexican style chillies, which are totally awesome, but not always that easy to get hold of. Chipotle paste is a decent go to, I made my own Chipotle en Adobo recently, which is well worth it if you’re a Mexican food fan or just mad about things chilli and smoky. The best black beans yet! Straight from Mexico City. 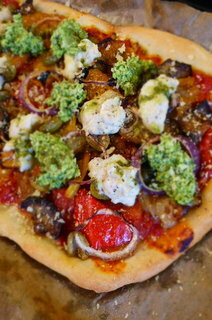 The real inspiration for this dish was Helga, a good friend of my sis’s, Laura. 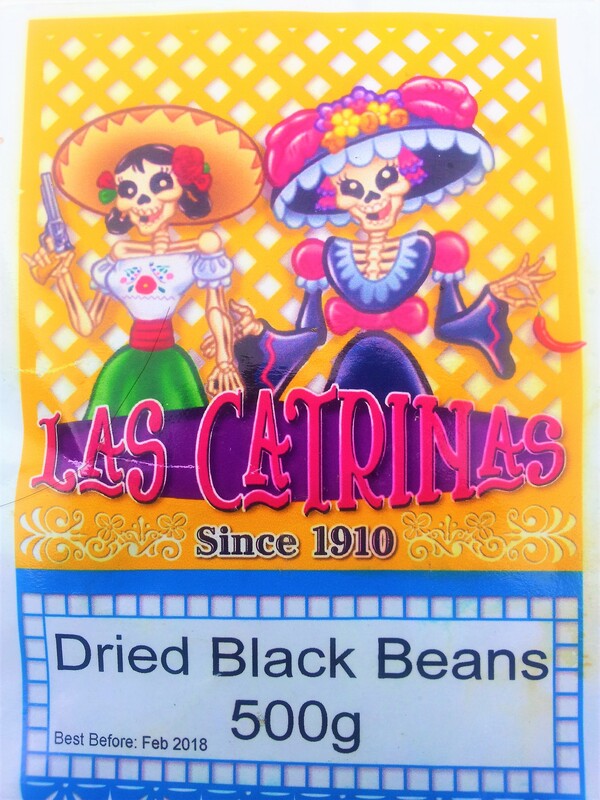 Helga is Mexican and sent these beans from Mexico City to be used especially for just such a dish. 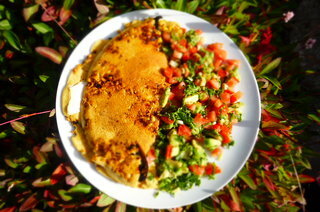 I’d also like to thank the cooks of the B.H.K Vegan Cooking Group on Facebook, who voted for a savoury dish this week. The delicious thing about this type of dark mole is that it skirts between sweet and savoury, with the addition of raisins here and a good amount of cocoa/ cacao. I must admit, I was a bit surprised when the savoury vote came in, I was sure it would be sweet all the way! I’d even got a recipe lined up and everything!! 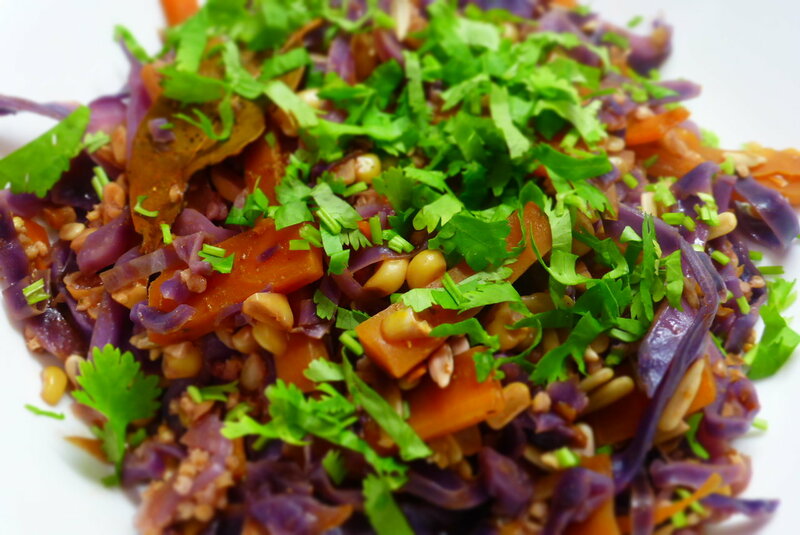 I’ve added grated golden beetroot, red cabbage and red pepper to the plate, for crunch and colour. These kind of ingredients, along with carrots, cauliflower, savoy cabbage etc can all add the same crunch and colour to any dish. Brightens things up no end! I’ve added some simple tomato salsa to the dish and sliced avocado. Lime, essential on, or in, most things Mexican and of course a god tickle of chilli! I also like serving this dish with some warm tacos/ tortillas. These beans and bacon make the most perfect leftovers, especially when wrapped up in a warm tortilla (I like the corn ones). When I say tortilla, I mean the soft ones, not the big nacho style ones that look like napkin holders. The black kale/ cavolo nero, adds great texture to the beans. Savoy Cabbage or Spring Greens will also be delicious. Chipotle paste?! No probs. Head down a supermarket and ask someone. It’s there. I used the crumble method of cooking the tofu bacon in the pics. Both methods are really nice. If you plan on keeping the mole, don’t stir in the lime juice until you are about to serve it. Tastes amazing that way. In a large saucepan, warm the oil on medium heat, fry the onion for 12 minutes until caramelised and golden, add the garlic and cook for 2 minutes more. Add the cinnamon stick, all spice, chipotle sauce, coriander, raisins, tomatoes and tomato puree and stir. Cook for 5 minutes until the tomatoes are soft, add the beans and water. Put a lid on it and cook on a low heat for 20 minutes. 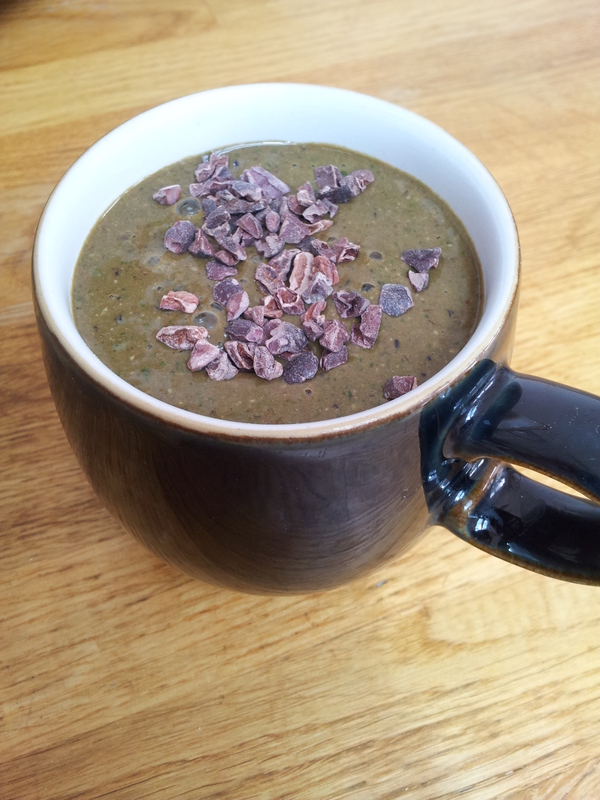 Stir in the cashew butter, kale and cacao, cook for a further 10 minutes. The beans should be breaking down and going a little creamy. Now stir in the lime juice, season with salt and a good amount of pepper and serve straight away. 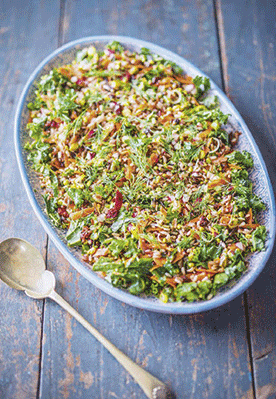 Serving ideas – Ideal with a crumble of tofu bacon, sour cream/ yoghurt and coriander. It makes a nice dip too. Take the cinnamon sticks out and pulse it s few times in a blender. Serve with nachos and guacamole. Mix marinade ingredients together in a bowl. Marinate in a fridge for a couple of hours or overnight is good. Preheat a fan oven to 200oC and place tofu onto a lightly oiled baking tray. Cook in the oven for 25 minutes. Until nice and crisp. Serve straight away but is also very nice served cold. Use the leftover marinade to dip the tofu in or as a base for a dressing or even add to a stew/ soup to add a little flavour kick. For the tofu bacon crumble – I mashed up the tofu, then marinated. Drained excess marinade and fried in a large frying pan on medium/ high heat with 2 tbs cooking oil until caramelised and crispy, roughly 8-10 minutes. 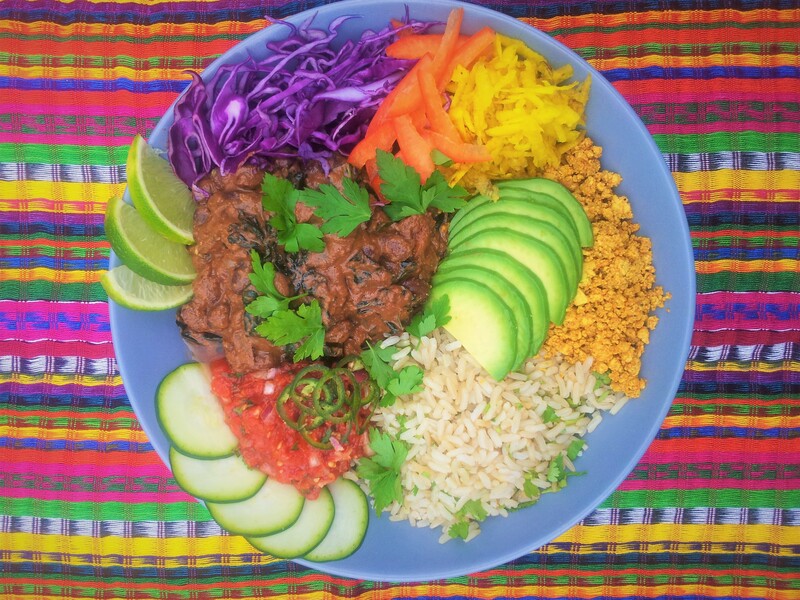 Vegan Black Bean Mole with all the gorgeous flavours of chocolate, chilli, spices and even cashew butter for extra richness. Black beans are one of the best sources of protein out there. They are also one of the best sources of things called phytonutrients (basically, compounds in plants that do us loads of good). They’re a good source of iron, copper and plenty of fibre. They will help us to take care of our bones and heart, they even contain selenium, which is not found in many places in a plant-based diet. Overall, they are a very healthy and super tasty star! I couldn’t write about Mexico without sending my love and best wishes to all effected by the recent earthquake in and around Mexico City. If you’d like to help, here are details of an amazing charity, A Hand for Mexico, based in Mexico City and helping the people affected, as well as helping to re-build the city, focusing on shelters, schools and hospitals. 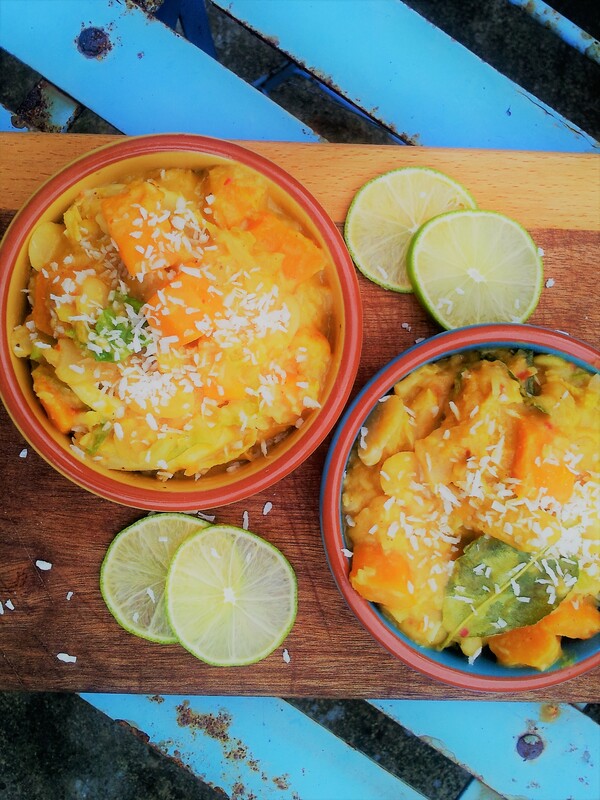 This is an ideal, quick and easy, curry at this time of year, using seasonal squash (one of my favs) plus British grown fava beans from Hodmedods and all the beautiful flavours of Thailand in a creamy and rich coconut sauce. It’s one of those dishes that most vegetables will love and mingle into, add whatever combos you love, I kept it simple here. 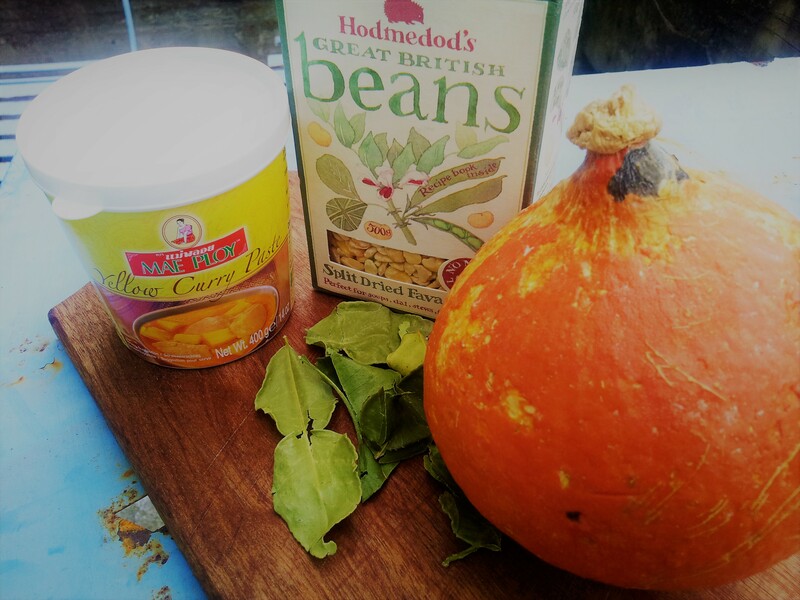 There are so many squashes around at this time of year, the one I used here was a Hokkaido Squash which is a great all-rounder for roasting, stew/ curries and grating or slicing into a salad. 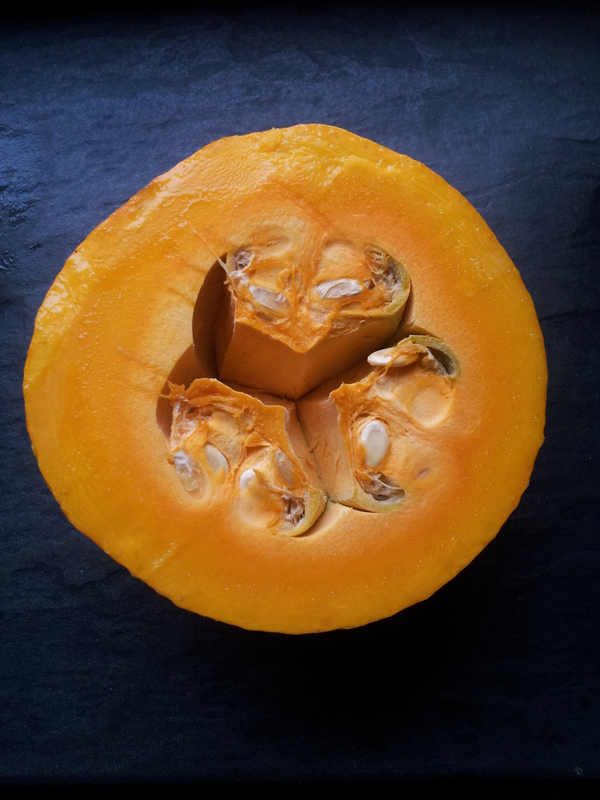 Hokkaido is lovely and sweet with a brilliant orange colour and is normally quite small, making it ideal stuffing size. You’ll also find loads of Acorns, Kabocha, Crown Prince (I love that one) and if you’re lucky, a Spaghetti Squash, which is well worth seeking out. When roasted and fluffed with a fork, it forms a spaghetti like texture. A lot of people I meet don’t like squash, strange as that may sound to some of you. It’s normally down to the fact that pumpkin is so popular, the variety we carve strange faces into at Halloween (although we always used a giant swede – the vegetable that is). That type of pumpkin is a little watery and lacking in flavour, not great eatin’, I’d recommend any of the winter squashes way ahead of old scary pumpkin head. This recipe is based on one of our favourite places to eat in Bangkok, Lemon Farm Organic Restaurant near, well, it’s kind of popped in the middle of a mass of sprawling Bangkok-ness (Chatuchak). It’s an out of the way place if you’re a tourist, a mainly residential area where we had the pleasure of staying with the awesome Kessi for a few weeks. There was really very little to do, so Jane and I did a lot of cooking (using only a rice cooker and kettle) and made a little home on the 13th floor of a tower overlooking the sprawling, buzzing city of Bangkok. This dish is modelled on something cooked for us by the amazing Buppha, head chef/ manager at Lemon Farm, which was a sweet, rich and coconut-y lentil dish from her hometown of Phuket in the South. I had never tried Thai lentils before and it really inspired me. She made it with red lentils and always shared her recipes generously, but I was normally trying to write them down in a little notebook whilst holding a plate of food and being jostled by crowd of hungry Lemon Tree punters. It got packed at office lunch time you see. So I free styled this recipe and used the best of what was to hand, but the taste is similar, reminders of good times for sure. Phuket is a foodie centre, which can be said for all parts of Thailand I’ve found, and the dishes there are distinctly chilli-fied! Pow!! Buppha used to wake up at 4am with her team of chefs to prepare the days array of dishes and was very passionate about all things cooking, many of the recipes had been handed down to her by her mother/ grandmother. The food was served buffet style, with a little noodle soup spot in the corner of an organic food shop. It was cheap, very varied, plentiful and many dishes were vegan friendly, using some tofu and lots of interesting veggies. Buppha just loved cooking with vegetables and they even had their own little vegetarian festival. A week of vegetarian cooking that falls between September and October most years, most Thai’s go veggie at that time. This years festival ended yesterday! This one’s full of the flavours of Thailand! Thailand is of course a Buddhist country, but meat is very common in dishes, to the point that eating without planning in Bangkok and all over Thailand can be a challenge. 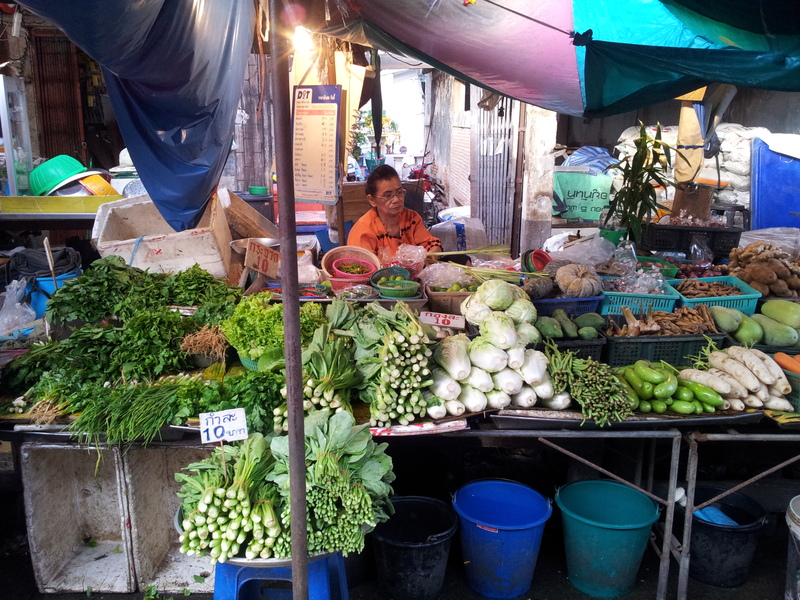 This is just one of those things, the veg markets in Thailand are some of my favourite in the world. In fact the veg market in a little fishing town called Prachuap Kiri Khan is probably my favourite in the world (not to mention they have a vegan restaurant and a couple of vegetarian restaurants, plus an outdoor food market every night). 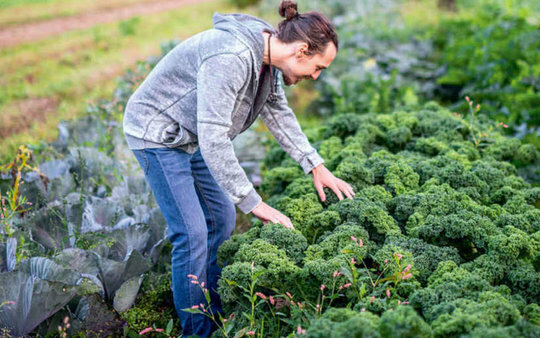 These veggies just don’t seem to surface on restaurant menus though, but this is a gripe of mine all over the world (one you’ve probably heard before). It seems that most veggies are used in the home and meat is a ‘treat’ when people go out to eat. Having said that, Thai’s seem to eat out all the time, everyday, such is the abundance of street eats to be found. No country is like it, most streets have carts, wagons and tables vending all kinds of local delicacies. It’s almost impossible to keep up with what is going on and taste bud overload can occur. 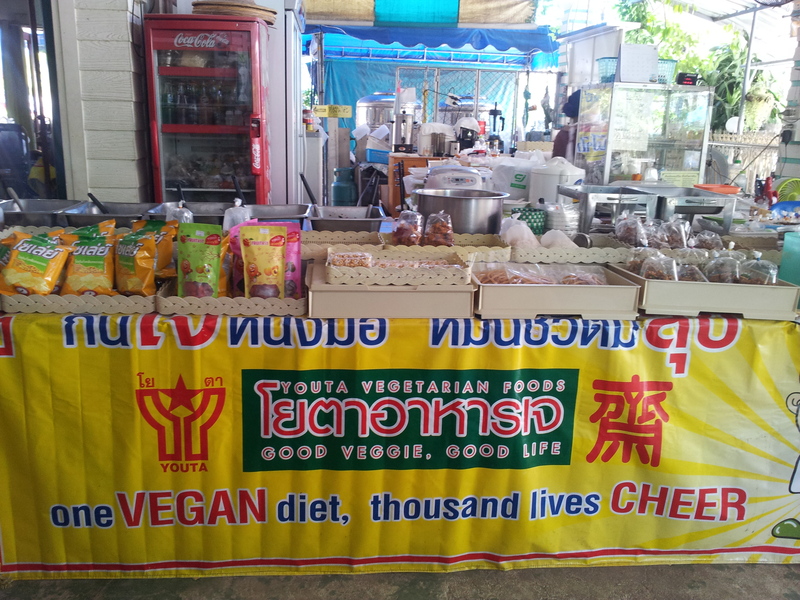 Prachuap Kiri Khan is a small town, on the coast south of Bangkok, but we managed to stumble upon a vegan festival there! Thailand is not the easiest country to travel around as a vegan, especially when you get off the tourist trail. English is not spoken generally and like I said, vegan options need to be sniffed out and the outrageous abundance of Thai street food is pretty much off the menu. Still, when you do find vegan hot spots, like the tourist friendly Chang Mai or one of the main tourist islands like Koh Samui, you’ve hit Thai food heaven. Thai food is very diverse, much more interesting than I imagined on my first visit. I was ignorant to the geographical differences in ingredients and flavours, styles and approaches. I should have known better really, as this is nothing new in the world of food, most countries have a similarly rich tapestry of dishes and produce as you wander around. Nowadays, when I return, that first Green Curry or Pad Thai Noodles is always a very special moment. There is such a buzz to eating in Bangkok, eating out really means that, outside, huddled over a table near a main road, or near one of the hundreds of canals (think watery thoroughfare). Theres a bustle and energy to it all, loads of skill and panache in preparing and serving food and you can spend all night walking around, eating tiny delicious portions of things and just keep going until the early hours. It’s one of the highest forms of grazing, snacking at its best, Thai style! Just for being awesome really!! They have such an amazing array of British grown pulses and seeds, so many interesting things (to me), like Blue Peas, Carelina Seeds, Black Badger Peas, Fava Umami Paste, loads of ingredients that get me excited about cooking, trying new things. If you’re interested, they even do a Big Vegan Box! Hodmedods were kind enough to send us some of their pulses and bits to cook with at our recent retreats and I think their fava beans are a cut above. 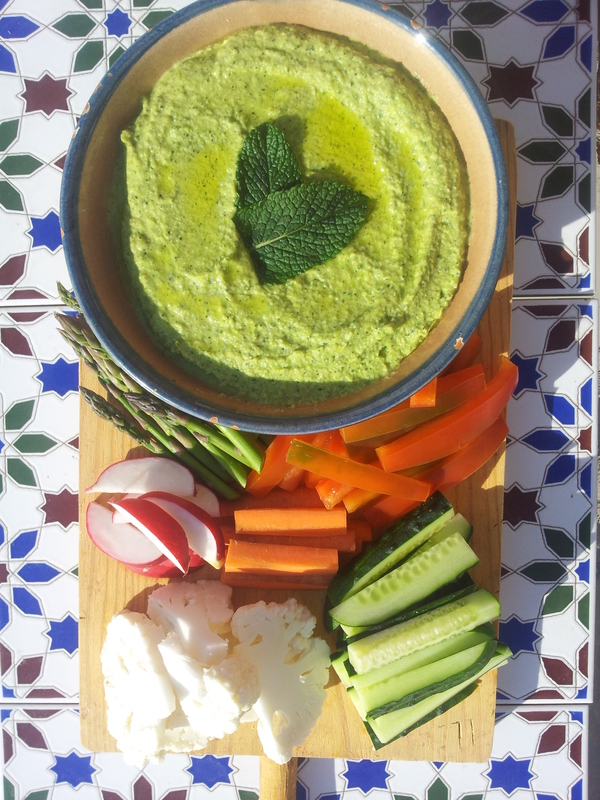 Filled with amazing flavour, I love making Fave E Cicoria, a really simple Puglian bean dip. 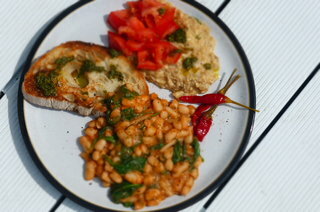 Making it with Hodmedods beans makes a huge difference to the flavour. The dish is simply made with cooked fava beans, garlic and a little olive oil. Doesn’t sound like much admittedly, but with those beans, it’s dynamite!! PS – Well done on winning the 2017 Best Food Producer at the BBC Food Awards. To celebrate they’re offering 15% discount on orders. You can use any lentils you like, red lentils will take considerably less time to cook. Green/ brown lentils, dark green/ puy lentils will all work nicely. Mung beans are also very ace. Not all coconut milk is equal. Check the cans, we’re looking for plenty of coconut content, if it’s around 50%, its going to be quite weak. Still nice, but not as creamy. We’ve been talking about the differences between Coconut Milk and Coconut Cream over on Facebook in the BHK Vegan Cooking Group. I like this dish really rich and really creamy. 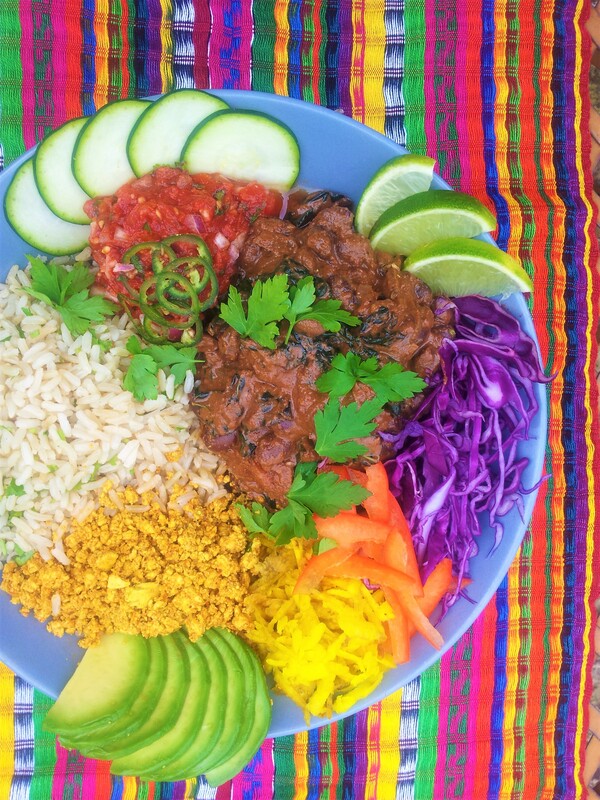 Check that your Yellow Thai Curry Paste is vegan. It normally is. The Green and Red Thai Curry pastes in most UK shops are not vegan. Shop bought Thai curry paste can be high in salt, this effects our seasoning. I didn’t have any coriander or fresh chilli, but that would have been the perfect addition to the topping of this dish. Wash and drain the fava beans. Cover with cold water in a large saucepan, bring to a boil, then simmer for 30-40 minutes, until soft. Add more hot water if needed. While that’s going on, in a large frying pan, add the coconut oil, warm on medium high heat and add the onion and fry for 7 minutes until golden, then add the garlic and ginger, fry for 2 minutes. Add the coconut milk, chilli, desiccated coconut, lime leaves, squash and cabbage, bring to a boil and simmer for 10-15 minutes until the squash is soft. Stir in the yellow Thai paste, sugar and cooked fava beans (including cooking broth), warm through for a few minutes, adding a little hot water if needed. Check seasoning. 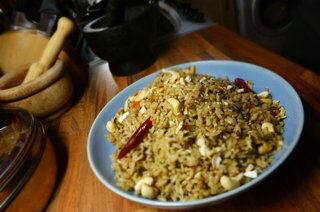 Serve with warm rice, more toasted coconut, lime wedges and sliced red chillies if you like it hot. You all probably know that I love my beans! But favas…..they’re almost a different league. PACKED with flavour and so, so good for us. Fava beans were dried and ground down to make bread traditionally in the UK, it was one of our major crops before we went wild for wheat and potatoes. There is a rich history of fava/ broad bean growing in the UK, but growing up, they always seems a little exotic, something from the Middle East maybe, not the Midlands. 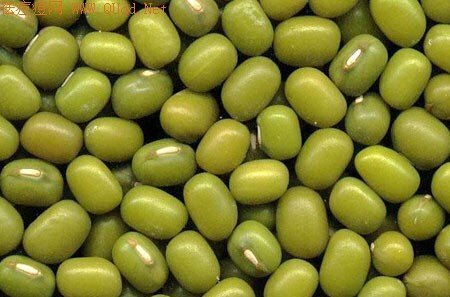 Fava/ Broad Beans are rich in shiny things like Vitamin K, Thaimin, zinc, potassium and loads of other minerals. They are full of protein and have no saturated fat or cholesterol. They also contain good amounts of iron and folate (one of the vitamin B bunch), plus loads of fibre. I’m cooking this tonight, a really attractive summery pasta dish. I was reminded of it when it popped up on the Blue Zones website. I cook dishes like this often, especially when I’m over in Spain, where the artichokes and almonds are just out of this world!! Plus the lemons…..you cannot quite recreate the flavour of a lemon freshly picked from the tree which has enjoyed all that sparkling Med sunshine. But let’s try! If you cook this dish, wherever you are, half close you eyes and imagine that the bright sunshine is everywhere, the blue, blue ocean waves are crashing somewhere close by and there are trees filled with lemons just outside your window. Ahhhhh. That’s the right vibe for this one! The Mediterranean diet is famous for being healthy, but its not just all the sea, sand and lemons. A healthy lifestyle is a little more complex than that it seems. 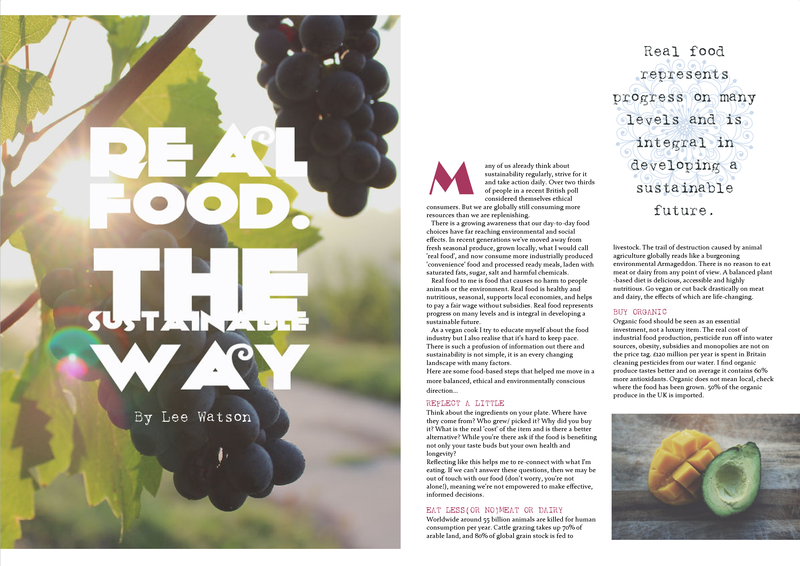 I’m very interested in the idea that the way we live, not just the way we eat and drink, has a bearing on our health and wellbeing. For me, diet is one of the foundations to a healthy and happy body and mind, but there is much more to consider and appreciate. Blue zones refer to the communities around the world who live for the longest. There has been a lot of interest in the lifestyles of these people, why do they live so long? 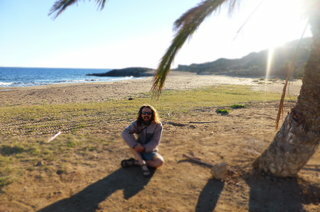 It seems that being social, staying active and from what I can see, maintaining a connection with nature, leads to longevity. There seems to be a strong sense of community in most of the ‘blue zones’ around the world, from Japan to Italy, and over to Costa Rica, people living more natural lives with good connections with each other, live longest. Sounds like a recipe for a good life to me. I’ve always like the Irish proverb, ‘a light heart lives long.’ I can’t see stress doing us any good in the long run. When I see the people interviewed in these ‘Blue Zone’ cultures, they are generally chilled out. Most of this is common sense to many of us, but its the putting it into practice that can be the hard part. Takes a bit of discipline. I’m always positive about change, our lifestyles will adapt depending on our priorities and convictions. 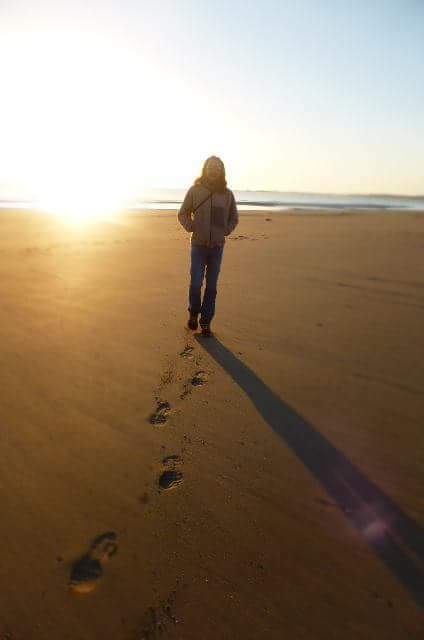 The option for a peaceful and content life is always there, it may be hard, may seem impossible, but with little shifts and changes to the way we approach life, the things we prioritise on a daily basis, big changes can come. I know this, because it happened in my life. 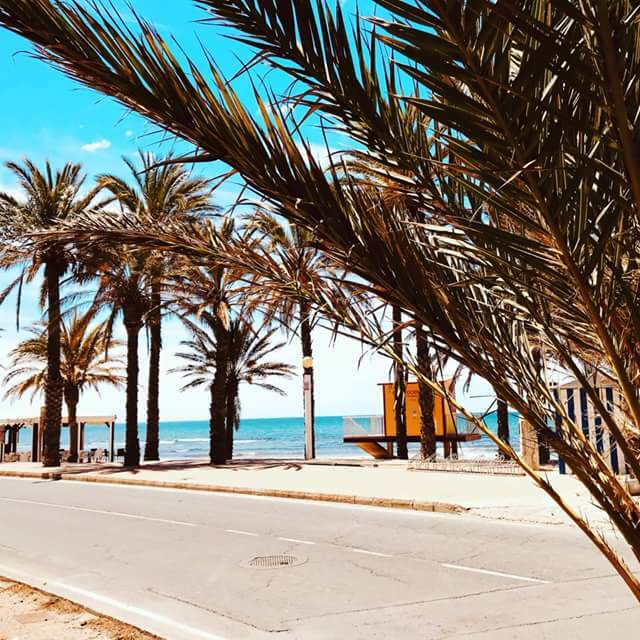 I went from quite a stressed life managing restaurants in London to helping to build a little beach bar in Spain, then took the real plunge and went for a very long walk in the Himalayas. My world view and perceptions changed considerably. A healthy approach is of course not just based around what we eat, but the way we think and feel. I recently watched this little cartoon about mindfulness, which is an excellent technique for developing a more conscious and connected approach to life that has been effective for millions of people. Mindfulness and meditation are two key practices that Jane and I use to maintain balance and harmony within ourselves and therefore within our relationship with each other and the world at large. Mindfulness is like an anchor in a chaotic world, when our life seems to be out of control, it’s a safe place we can find empowerment and inspiration, peace and genuine relaxation. 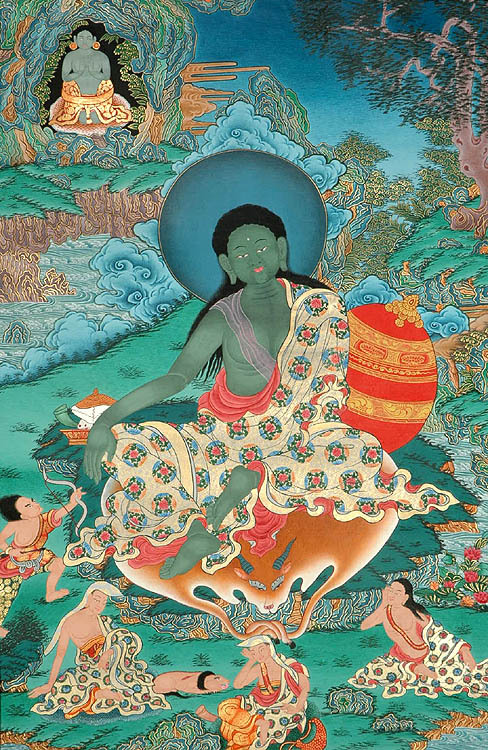 After all, a short period of mindfulness and meditation can have the restorative and re-energising effects of many hours sleeping. A relaxed mind is an effective mind and an effective mind allows us to navigate our way through life in an assured, calm and empowered manner. I’d like to thank the Blue Zone site for sharing the recipe and reminding me about some of the aspects of my own lifestyle that were being neglected. I’m off for a long walk and then, dinner! Peace and Parsnips was released in the USA recently, so you’ll notice the US style weights and measures below. The recipe contains a few ingredients, but is easy to put together and I like the artichoke and almond combo in the sauce, something a bit different. 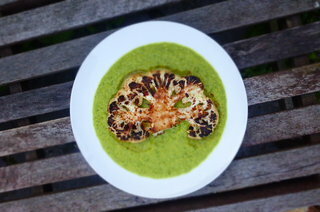 I think this is perfect for a treat summer meal and the last recipe I posted, Simple Seared Mushrooms with Pea Puree & Crushed Minty Peas would make a very nice starter. I love these kinds of dishes, simply prepared, just let the lovely produce at this time of year give their flavour and do the talking. Have you tried salsify? Its a delicious, if a little obscure, ingredient. You can use salsify in this dish instead of the white asparagus, which is normally found jarred. I first made this dish in Spain, where there is no shortage of white asparagus. I like its subtle flavour and texture. Pappardelle is one of my favourite pastas, great for a thick, creamy sauce that sticks to it nicely. You can of course use tagliatelle or something similar. Heat 1 tablespoon of oil in a frying pan and add the almonds. Sauté for 1 minute, then add the garlic and continue cooking for 2 minutes more. Add the watercress leaves, cover the pan, remove from the heat and allow to cool. Place the contents of the frying pan in a food processor with the artichokes, lemon juice and 4 tablespoons of olive oil, and blend to a smooth purée. The sauce should be thick and shiny. Add water to thin it out if necessary. Heat 2 teaspoons of olive oil in a large heavy-bottomed frying pan on medium and add the asparagus. Panfry for 6–8 minutes, until nicely caramelized. Add a glug of white wine, and when the liquid has evaporated, season and cover. Leave to sit. Bring a big pan of salted water to a boil and cook your pasta for roughly 8 minutes, until al dente. Add the kale halfway through the cooking time. Drain well, keeping aside a little of the pasta water. Add the drained pasta and kale to the artichoke sauce and toss together, adding some of the pasta water if it is looking a bit dry. 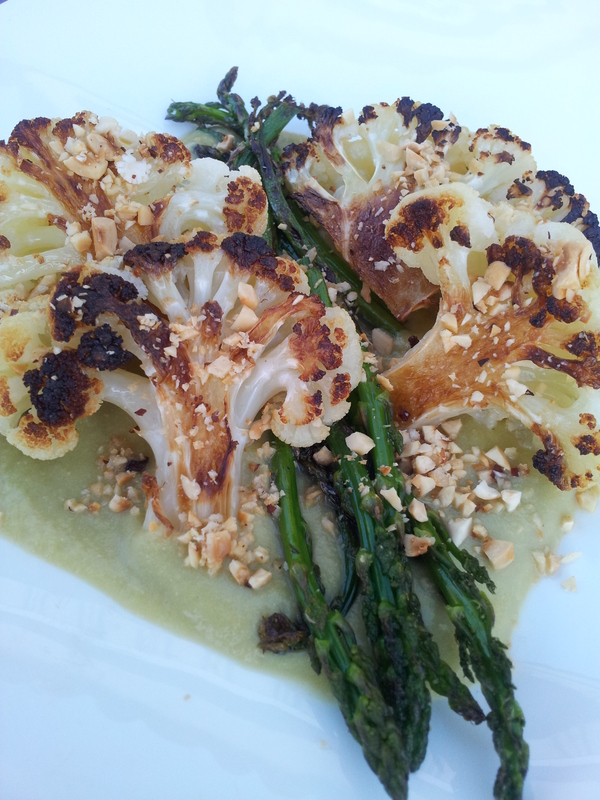 Spoon into warm shallow bowls and top with crisscrossed asparagus and a sprinkling of toasted almonds and parsley. Garnish with the watercress and season with sea salt and black pepper. 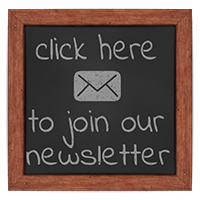 Sign up for our new newsletter and receive recipes, special offers and all our up coming events and news. Just landed back in the UK and am chuffed to be back in the kitchen playing with pots, pans and potatoes. 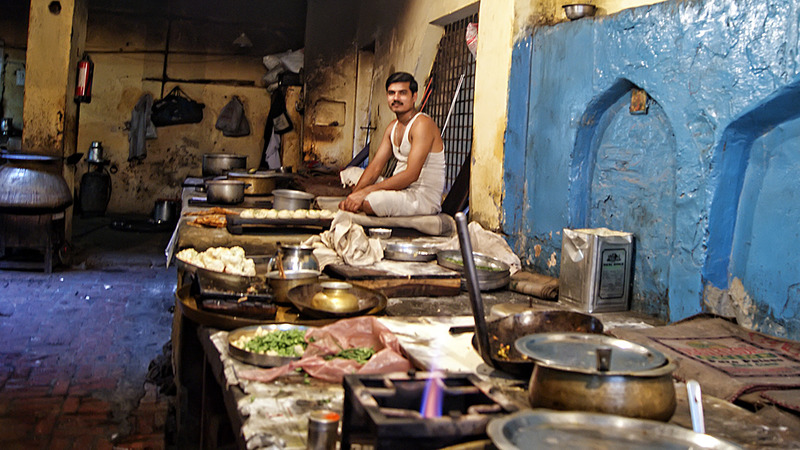 I love travelling but finding a good kitchen to cook in can be a challenge. It’s probably the only thing I really miss. I’ve been munching my way around the world for a while now and am ready to recreate a huge chunk of global tastiness this summer on the BHK. I hadn’t had cous cous for an age and really enjoyed it recently in Beirut. Although not exactly traditional Lebanese (more of that to come) I thought it would be a nice way to get the BHK recipes rolling again. This is a quick, easy and delicious summer dish, I love these flavours; a little spice, apricots, crunchy almonds. YUM! Plus a creamy tahini sauce. It takes no time at all to get together and when served with a salad or two, maybe even some warm flatbread, you’ve got a meal every one will enjoy. So we’re just getting settled into the British vibe again, I must admit that it’s still quite a shock not waking up in India! 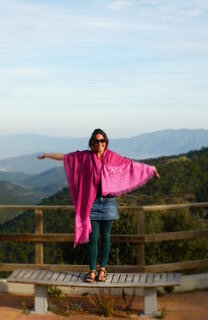 It was one of the hottest days of the year yesterday and I wore a big fleece and scarf. I’ll get used to it!! 2017 has been an incredible year so far, Nepal, India, Lebanon and even a little taste of Ethiopia, but we can’t wait to tour around the UK for all the events, festivals and retreats we have planned. Maybe see you there!! We’ll be all over the place this year and have more plans in the oven. As you know, the BHK has always been a nice little hobby for us, but in 2017 we plan on doing more than ever. To keep up to date with stuff, check out our events page. Jane is also working on our new newsletter and we are always posting things on the BHK FB page and I’m even tweeting. If you get the chance to try this, or any of our recipes out, let us know in the comments. We love to hear about your kitchen adventures. All Spice is best used sparingly, if you don’t have any, go for a spice mix like garam masala or Ras El Hanout and use 1 teas more. I really like millet and it makes a great sub for cous cous. It’s healthy and gluten free. You might like to roast your almonds in an oven for 10 minutes to bring out the amazing flavours. In a large frying pan on medium high heat, warm the oil and add the cumin and sesame seeds. Stir and fry for 1/2 minute and then add the onions and cook for a few minutes. Now add salt, pepper, all spice, aubergine, courgette and peppers. Gently stir and fry for 5-7 minutes, until all is soft. Add the tomatoes and apricots, take off the heat and pop a lid on. Set aside. The tomatoes will be just soft and not overcooked. Cook your cous cous, follow the pack instructions. Using veg stock adds more flavour and a few twists of black pepper is nice. In a bowl, mix the tahini sauce bits together with a fork, adding water gradually until you have a thin sauce. Serve warm or cold. 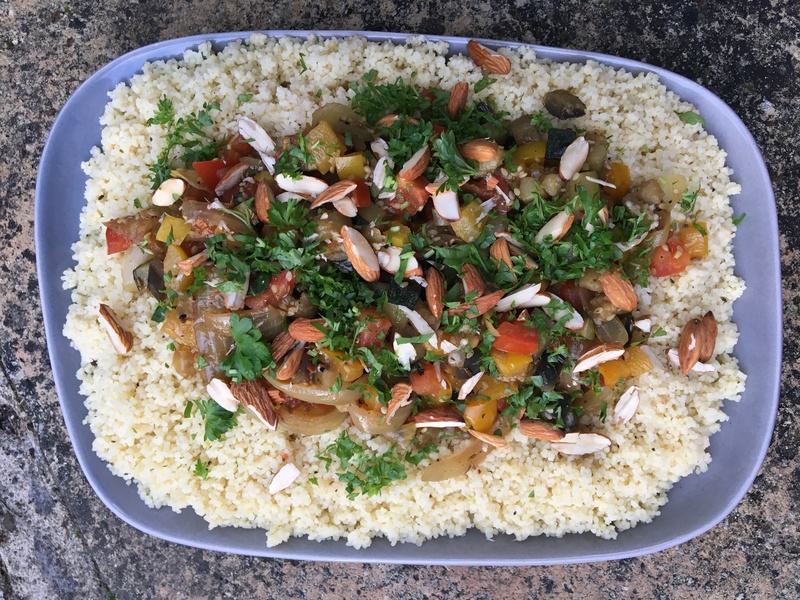 Arrange the cous cous on a large plate, pile the veg in the middle and top with parsley and almonds. Drizzle with tahini sauce as you like. 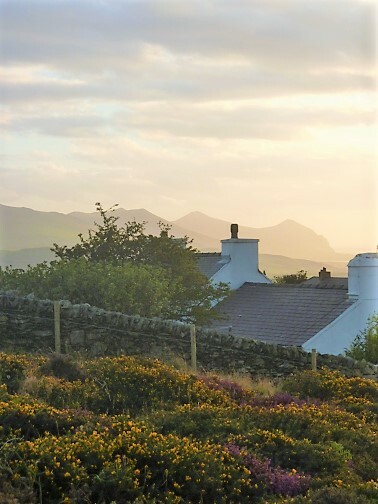 We’re sharing our time between beautiful Wales and Durham this year. Almonds are packed with healthy fats and minerals, it’s been shown that nuts can actually help you lose weight. We eat the sweet almonds, but bitter almonds are used to flavour things like amaretto and almond extract. Many people I speak to don’t realise what a good source of antioxidants nuts are and are put off because of high fat contents. The fat’s in most nuts are healthy and they come with so many more benefits. Plus, they taste incredible. 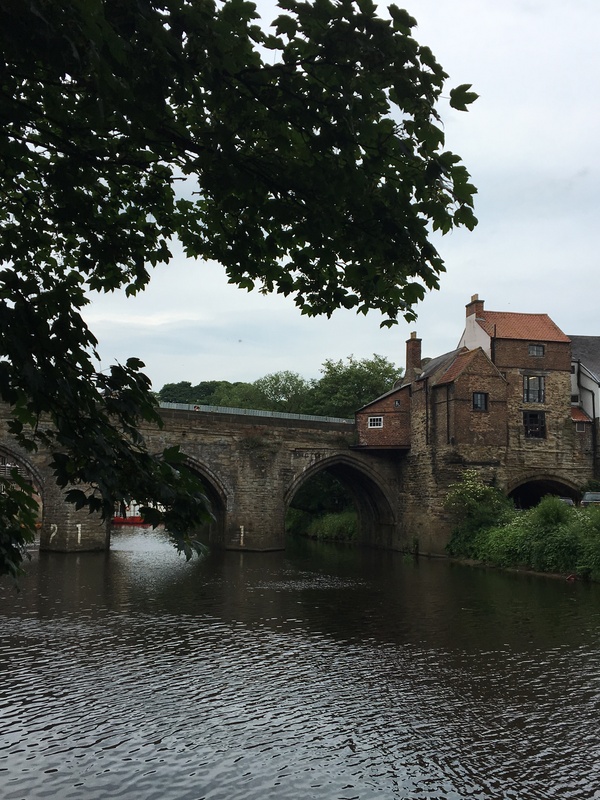 Lovely walk in Durham yesterday along the river Wear, seems a long way from the Ganges!! I know this may sound complicated, but it ain’t! A light and simple summer time lunch which is a bit of a looker and won’t have you hanging out in the kitchen or shops for too long. The method is so easy and there are only a handful of ingredients. 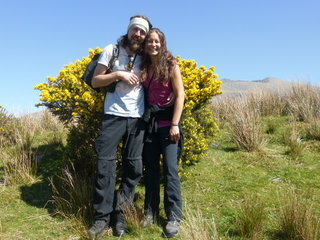 You want to be outside right, dancing in the sunshine, listening to reggae!!! This is what you could call a restaurant style dish, I served it recently to some friends and it’s that kind of Saturday night dinner party plate. Dishes like this look much more complicated than they actually are, I think that makes for a good restaurant dish. Making our lives easier in the kitchen doesn’t mean the quality and presentation of food has to suffer. The contrary is generally true. 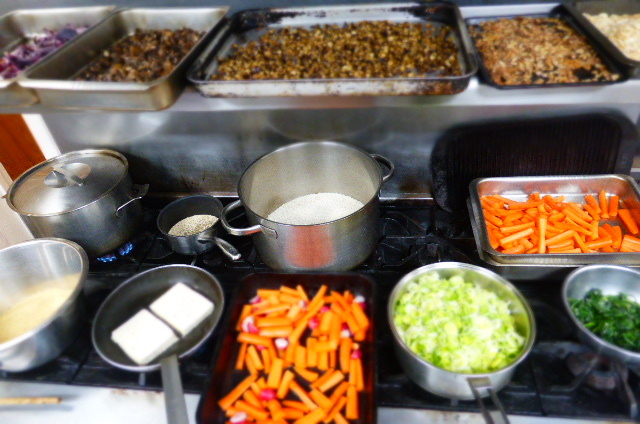 The more chilled and effortless we are in the kitchen, the better the end product. Thats how it works in the BHK anyway! 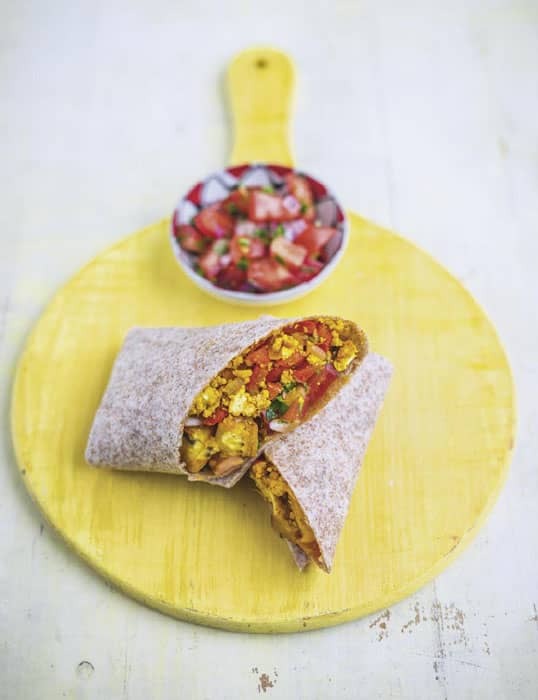 Cauliflower is so versatile and its finely getting some real kudos in the ‘foodie’ world. Long overdue! I actually endured the glorious cauliflowers former incarnation recently, that drab and vacuous, steamed way beyond death thing, that graces serving dishes in function rooms across Britain. It was at a wedding. Any flavour that the poor florets had were mercilessly boiled out. What a shame, I only hope they used the stock. Cauli makes our sauce here super creamy, it actually contains pectin, like apples, which helps to thicken things up nicely. I use cauliflower in soups and stews when looking for a touch of silky creaminess. I’ve even used cauliflower in a chocolate torte which was actually really nice. It was for my Mum’s 60th birthday cake, which was admittedly, a bit of a risk. But no one could have guessed, primarily because I didn’t tell them about the secret ingredient until after they’d eaten at least two slices and showered compliments on the richness of the torte etc. Then I went in, a bit smug. No one was that surprised. They know what I’m like. 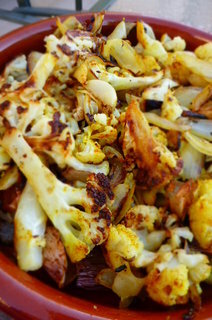 Of course, we’re all crazy for roasted cauliflower at the minute and bar maybe potatoes, few veggies can match cauli when it is nicely caramelised and a bit charred around the edges. Yumah! You’ll probably have a little too much sauce from this recipe. You can thin it down with vegetable stock to make a lovely soup. If your hazelnuts are not toasted, just pop them on a baking tray and into the oven for 10 minutes. Keep your eye on them. You can easily cook the cauliflower on a bbq if you prefer. Cauliflower is perfect for all kinds of bbq style behaviour. Asparagus can be substituted for a number of veggies in this dish. What ever is looking good and seasonal, I’m thinking peas, broad beans, kale, even peppers or squash. 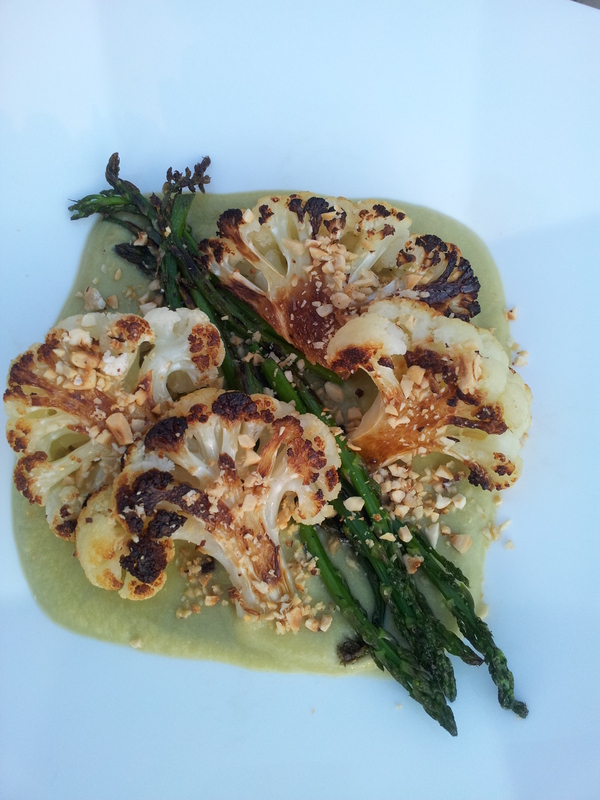 Cauliflower is fairly neutral and takes well to many other veggie flavours. I served this with pan fried mushrooms and spinach with roasted potatoes. Unless you are looking for a light meal, I’d advised some of your favourite, complementarty sides. Preheat an oven to 225oC. Cut off the asparagus tips (first three-five inches), then chop the stems until you get to the woody bit. Try some, if it’s fibrous, you’ve gone too far. Trim the leaves off the cauliflower by slicing off the majority of the base stem. Then cut into 3/4 inch slices straight across, use a long knife. Now cut off the ‘hearts’ of cauliflower, basically nicely shaped florets. The more broken, smaller pieces of cauliflower, add to a saucepan for the sauce. This should be roughly 1/2 the cauliflower. Use any leftover pieces of stem for the sauce. Drizzle some oil onto a large oven tray, add the cauliflower hearts and season with salt and pepper. Toss a little so they are covered with oil and place in the oven for 25-30 minutes. Until they are well caramelised, I’m talking dark brown colours and charred bits here. Add the soya milk and garlic to the cauliflower in the saucepan. Bring to a gentle simmer and cook for 15 minutes, until the cauliflower is just breaking down. Add the asaparagus and season with salt and pepper. Cook for 5 minutes more then leave to cool. You can do this in advance, preferably before the cauliflower is roasting in the oven. Using a stick blender or food processor, blitz the sauce until nice and smooth. Just before serving, grab a frying pan, add a dash of oil and on a high heat, cook the asparagus tips. Fry for 5 minutes, until they caramelise and then season with a touch of salt and pepper. Serve on big warm plates, add a few spoons of sauce to the centre, use a spoon to form a circle/ square (depending on the shape of your plate), form a row of asparagus tips along the centre, with four large cauliflower florets either side. Finish with a good scattering of hazelnuts. Or anyway you fancy. This kind of dish demands a nice glass of chilled white wine (with or without bubbles). 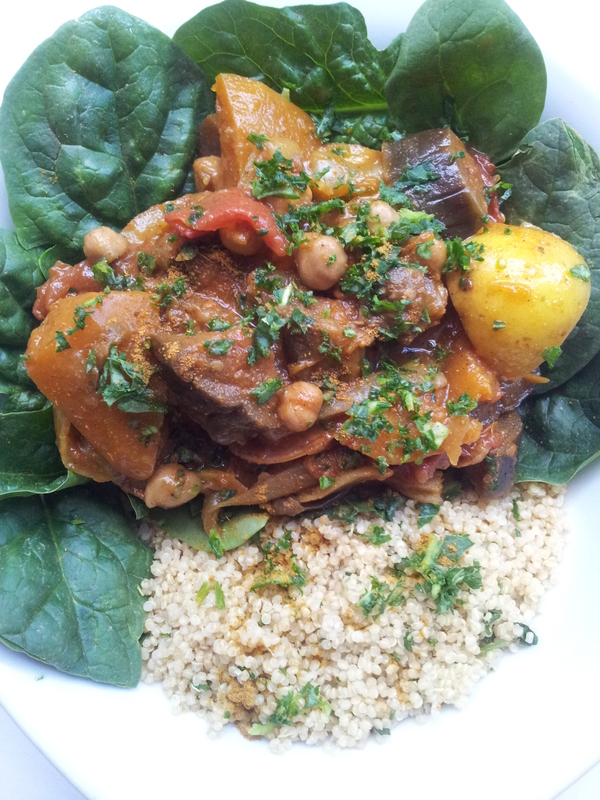 Tagine is a great summer time staple, a light stew with lovely spice and hints of sweetness from the dates. The perfect place for brilliant seasonal vegetables, a straightforward and ideal addition to your mid week special board! In Morocco, tagines are a showcase for the amazing local produce. The stock base is just the cooking juices of the vegetables and a little salt, no added stock needed. You know how good your veggies are, its a good test actually. 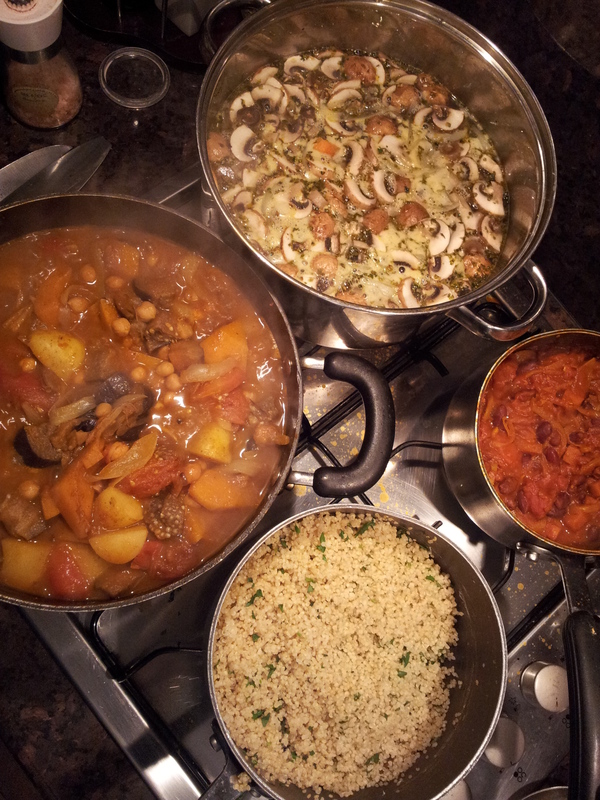 If this tagine is tasteless, its all down to the produce (add a little veg stock). I went to Morocco straight from Mexico and I remember being hungry quite a lot. I was travelling on hope and pennies and there was certainly not the range of cheap street eats that you find everywhere in Mexico. It was a bit of a shock to the system. 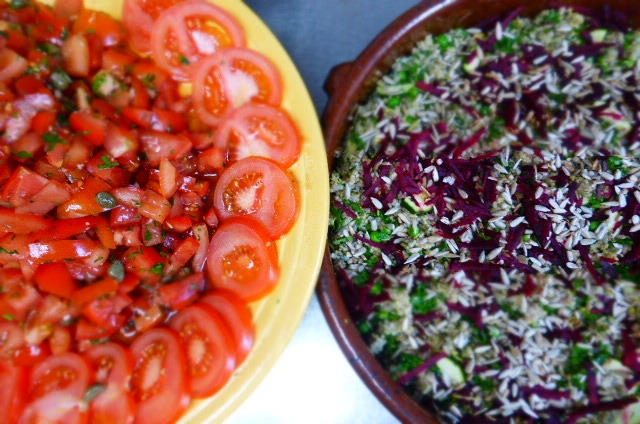 When I found a place that did cook veggie food, normally cous cous or tagine, it was a real find. There was normally then a wait while the cook/ owner went out to but the vegetables and cook the tagine. I travelled in mostly rural areas and this could mean a long wait for dinner/ lunch. Still mint tea always flowed easy and the pace of life in Morocco suits me down to the ground. Life ebbs by nice and easy. Let’s face it, most of us don’t have a proper tagine (the cooking vessel). That’s fine, we can still call it a tagine (just don’t tell your Moroccan mates!) As you’d imagine, we do have a tagine dish. It is normally used as a fruit bowl and I’m always looking for an excuse to use it. 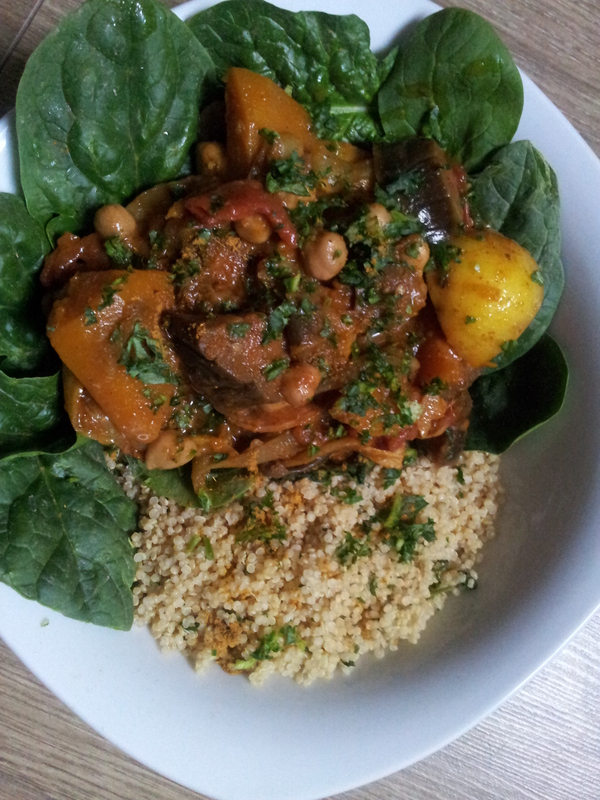 A tagine is actually a brilliant shape and design to cook vegetables and cous cous to perfection. You need very little water as the heavy lid keeps in most of the water, it acts as something like a pressure cooker. I find this especially helpful when cooking cous cous. I like a good mix of veggies in my tagines and potatoes are very important base to other more glamorous (you know what I mean) veg like aubergine, peppers etc. The potatoes have the added benefit of making the tagine sauce thick when they begin to break down. I always bang on about fresh spice, but it makes a huge difference. Many spices have been lurking around our cupboards for a while and may be past their sensational best. 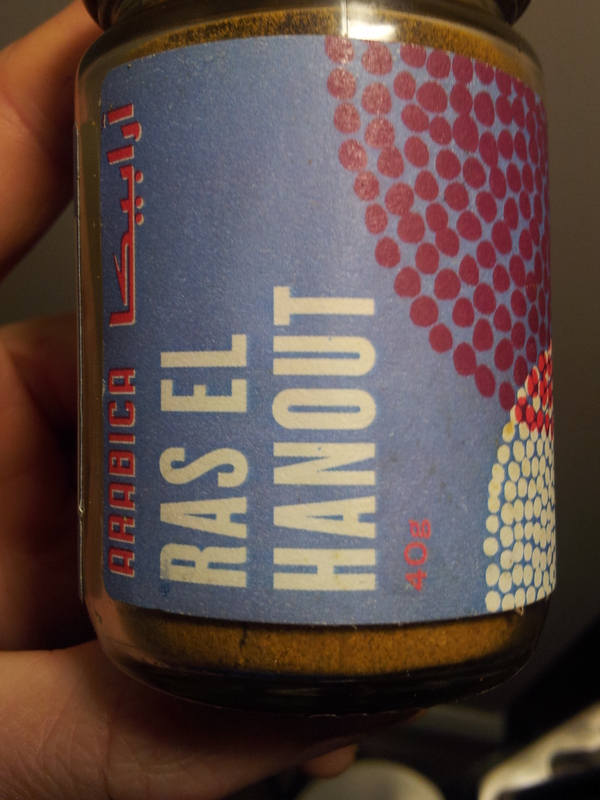 Ras El Hanout is the traditional spice mix used, but you know what, other spice mixes can be added to make a tasty stew. Think garam masala, curry mixes, berbere, jerk style mixes. The basic technique will be the same, just experiment with the spice quantity. I’ve been cooking all over the UK in the past month, it seems like a different kitchen every night! I love it!! I’ve found most people have really good kitchens and its interesting to try out different ovens and cook with a range of pots, pans and utensils. Most people have some amazing kit, much better than the stuff I’ve got!!! This tagine was made in Durham a few days ago, my Dad who you probably know by now was like me, a real, full power, carnivore and is now going through a real shift. He’s making his own twelve veggie stew at home. I knew Dad would dig this and he says he’ll be trying it out again soon. It’s always wicked when your loved ones enjoy what you make. Tagines are normally chunky. Cut all the veggies into roughly 1 1/2 inch chunks. As a variation, you can substitute the dates with dried apricots and use whatever vegetables are good and seasonal, easy to get hold of. 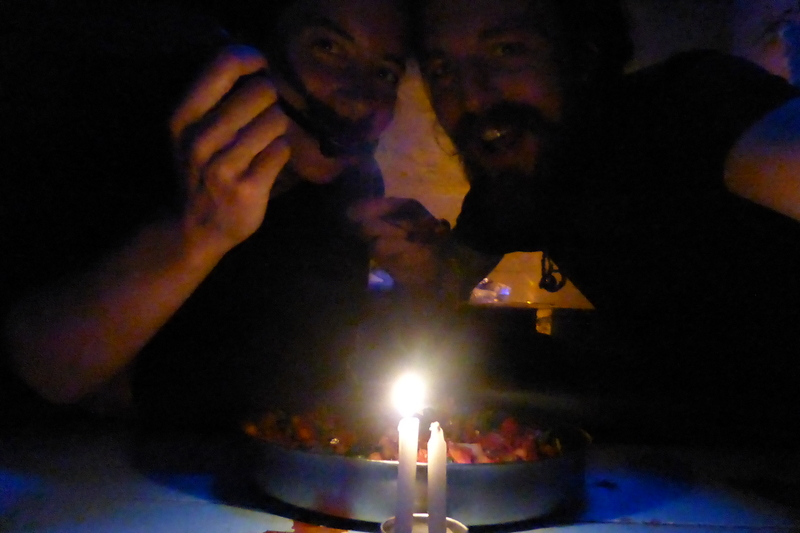 My friend Abdul, who lives in a cave near the Sahara, swears by a nice glug of olive oil when serving a tagine. It adds extra richness and gives the sauce a shimmer. 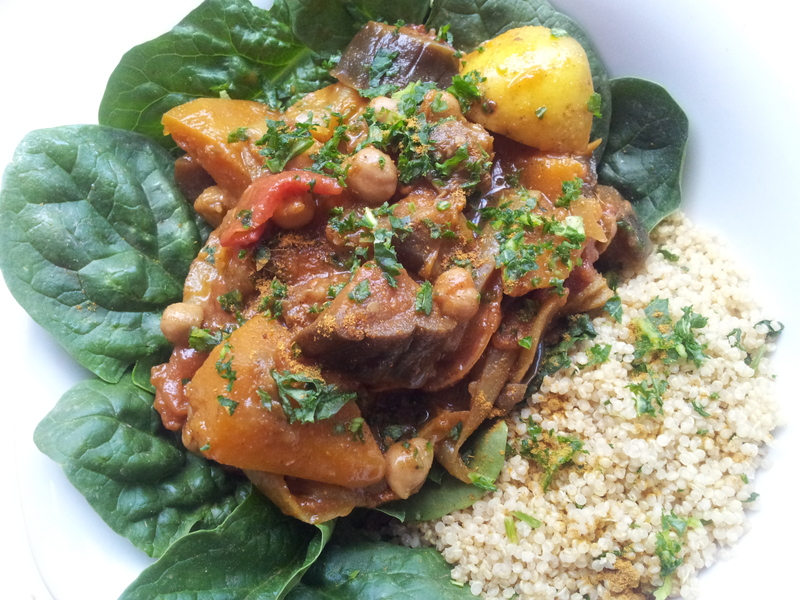 To make things extra special, adding a few handfuls of greens just before you serve the tagine would be nice. Something like spinach, kale or chard. Spring greens are awesome, just add then about five minutes before serving, they take a bit more cooking. Do not use a metal spoon or spatula to stir stews, unless you want the vegetables to break down. A trusty wooden spoon is perfect. We cooked quinoa to serve the tagine with, instead of the traditional cous cous. 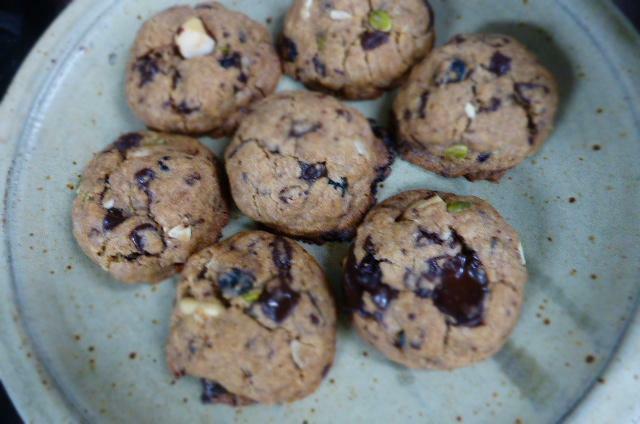 Gluten free and delicious, its also packed with massive amounts of goodness/ nutrition. This is an easy one……. In a large frying pan or saucepan on medium heat, add the oil and fry the onions and ginger for five minutes until soft, then add the other vegetables, cinnamon, spices and some salt. Stir and fry for two minutes then add the tomatoes, dates, tomato puree and water. Stir gently and pop on a loose fitting lid and cook on a steady simmer for 35-40 minutes, until the potatoes are just breaking down. Season with a little more salt to taste. Serve with cous cous, topped with a drizzled of olive oil, fresh coriander and a sprinkle of extra spices. Just such and easy and flavoursome number! The kind of dish you could serve as a main course or starter at a dinner party (aka when you’re trying to look a bit flash in the kitchen) and really not go to any great trouble. One of the main reasons for me popping this recipe on the BHK is the wonderful Vegan Recipe Hour, happening soon over on Twitter. 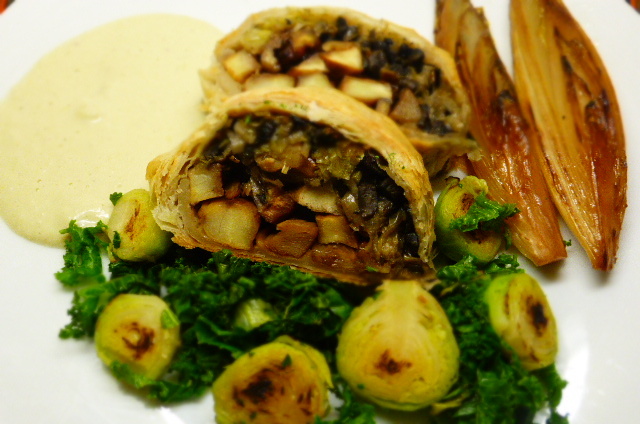 A great place for vegan cooking inspiration and tonight the theme is……well……MUSHROOMS! 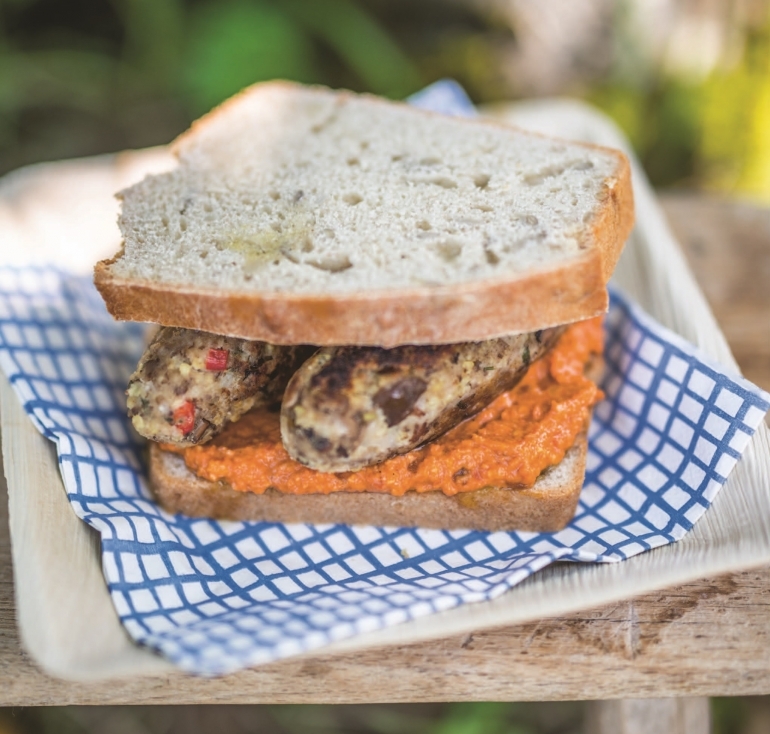 They look lovely and pack some intense flavours; mushrooms, sun-dried tomatoes, roasted nuts, pesto, these are some of the bedrocks of richness and savoury flavours in a vegan cooks locker. Combined……POW! I’d also like to mention that this is most definitely healthy. One of the five basic tastes and a word that sounds like something Vic and Bob would exclaim (with loads of reverb) mid ‘Shooting Stars’. If you are not British, this may take some explaining…..this clip might help. Umami is a savoury taste in things like mushrooms, nuts, fermented foods like miso and tamari, yeast extract, seaweed and sun dried tomatoes, they’re packed with that mysterious and delicious flavour that acts like catnip to our tastebuds. We know we love it! The history of umami can be found here and it is of course the source of MSG. Its natures MSG, which means all the crazy good flavour without the unpleasant side effects. 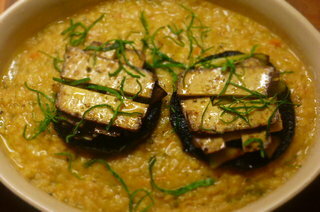 Many rich and flavourful plant based meals use something umami as a base. BEST JOB IN THE WORLD! 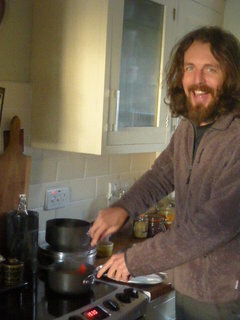 Some of you may know that I cook at a glorious retreat centre in Snowdonia, Trigonos. 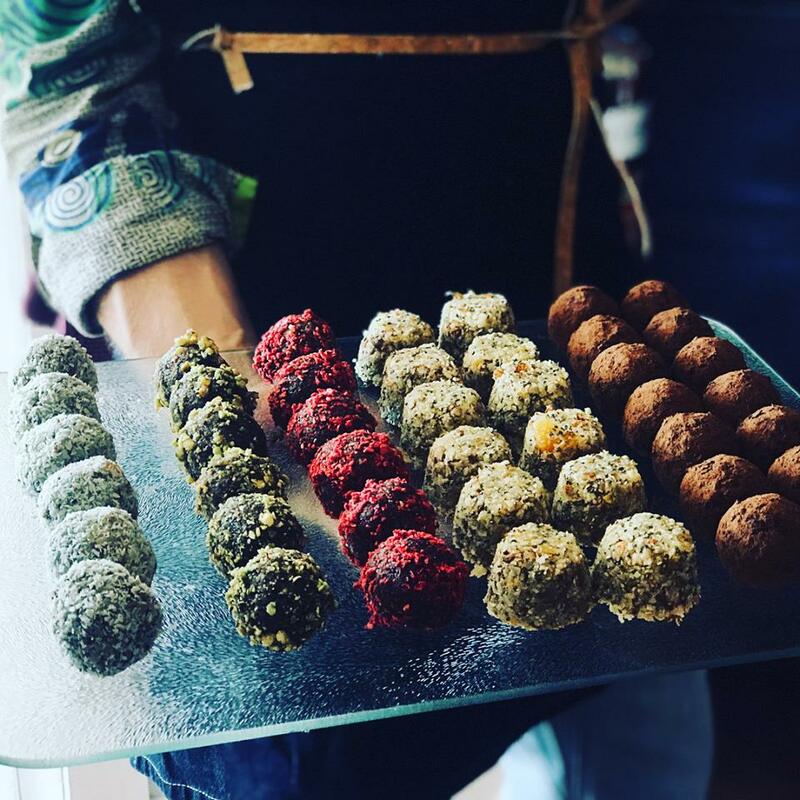 (Queue a quick plug for the retreat and workshop I’m running soon – ‘Discovering Vegan Cooking’). I have started to make these mushrooms for lunch there and they always go down a treat. Greater than the sum of their preparation skills and time. The sign of a winning restaurant dish, especially when you’re working in the kitchen! This is a dish I choose when I’m giving myself a bit of a break. Normally, if you eat at Trigonos, you’ll be joining me on a voyage into vegan cooking. I have a rough idea what I’ll be cooking but I generally see what is good from the land that day (we have our own organic farm) and what’s looking great from out veg supplier. Then I play with food and enjoy myself. One of the most wonderful occupations imaginable. Now. Lets make something delicious. The mushrooms will shrink quite a bit during cooking. Make sure you get big ones, or double up per person. I have found that most folk like a second mushroom after they’ve tasted the first. Portobellos are full of flavour and texture but field mushrooms are also fine (and a little cheaper). I always try to make my own pesto, but at this time of year, fresh leafy herbs are not exactly sprouting from the earth. You could use a good jar of vegan pesto, you’ll find this in most supermarkets and especially health food shops or similar. A typical Trigonos lunch plate, plenty of colours! Peel the mushrooms, lightly oil a baking tray, sprinkle the mushrooms with salt and pepper. Bake the mushrooms for 15-20 minutes. They should be soft but still nice and succulent. 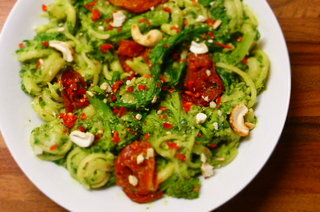 Place all of the pesto ingredients into a food processor (except the olive oil) and pulse until a chunky pesto is formed whilst drizzling in the oil. Or, just mix the tomatoes and lemon zest into your shop bought pesto. Taste and season with salt if needed. Adding more nooch (nutritional yeast flakes) will up the cheesiness. A good thing. Spoon roughly 2-3 tbs of the pesto over each mushroom and sprinkle with walnuts. Pop back into the oven for 10 minutes to warm them through. Thats it! Sprinkle over some herbs and serve soon after. Cookbook Competition Winners & Happy Birthday Beach House Kitchen!!! What a way to celebrate a birthday! So many amazing recipes have hit our blog inbox over the past couple of weeks. Our minds are boggled now by sheer deliciousness…..! Its been so hard to pick winners so we’ve changed the rules a little, we’re giving away two more books!! You are all winners really and we will be cooking as many of your amazing recipes as possible. 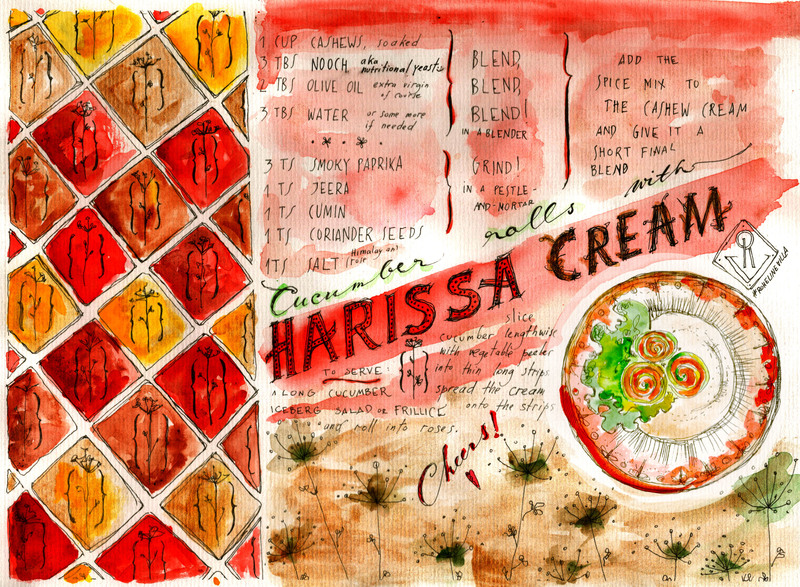 Katharina loves drawing, eating and cooking….sometimes all at the same time!!! 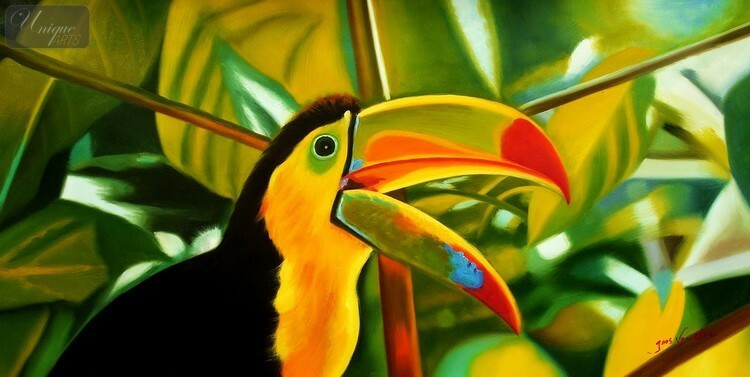 Instead of a taking a photo, Katharina sent in a painting. We thing its wonderful! Anybody this talented with a paintbrush is bound to be a hit in the kitchen! We think these will look incredible, rolled into a beautiful rose and stuffed with a harissa cashew cream. Woah! The kick of the Harissa makes Katarina happy and we are sure this dish is going to make us smile. This cream will also go well on bread, with salads or dip a falafel in. YUM! Blend cashews with water and nutritional yeast and grind the spices in a pestle and mortar. Add the spice mix to the cashew cream and give it a short final blend. Slice cucumber lengthways with vegetable peeler into thin long strips. Spread the cream onto the strips and roll them into roses. 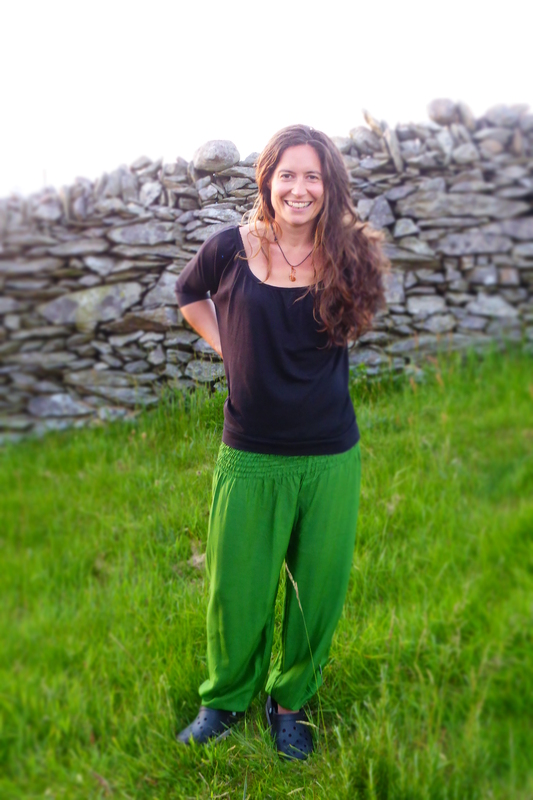 We love the cooking style of the Med so much and Laura is such a talented cook and blogger. 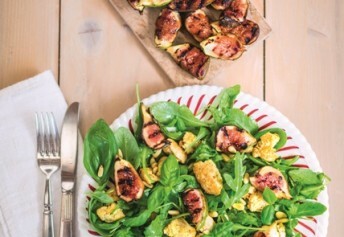 You’ll find more delicious recipes like this on Laura’s blog ‘The Whole Ingredient’. If you haven’t already pre-cooked the butter beans, put them on to boil in a large pan of water. Leave to simmer for 20-30 minutes – about the same time it takes to prepare the sauce. While the beans are cooking, make the sauce. Chop the onion, carrot and celery small, all to a similar size. Heat 1 tsp of olive oil in a large frying pan and add these to the pan. Cook for 5-10 minutes, or until the onion is translucent. Slice the garlic and add this to the pan, giving it all a good stir. Now stir in the chopped tomatoes, tomato purée, lemon juice, 1 tbsp of oregano, cinnamon, salt and pepper. Chop the dill (discarding any thick or tough stalks) and stir this in too. Leave the sauce to simmer for 10 minutes. While this is cooking, wilt the spinach in a separate pan until there is no water remaining from the leaves. You can now assemble the pie. Line the bottom of an oven dish or pie tin with the spinach. Drain the butter beans and stir these into the tomato sauce. Gently pour this over the spinach and level it out. Sprinkle on the rest of the oregano and olive oil. Cook on a middle shelf for 30 minutes. 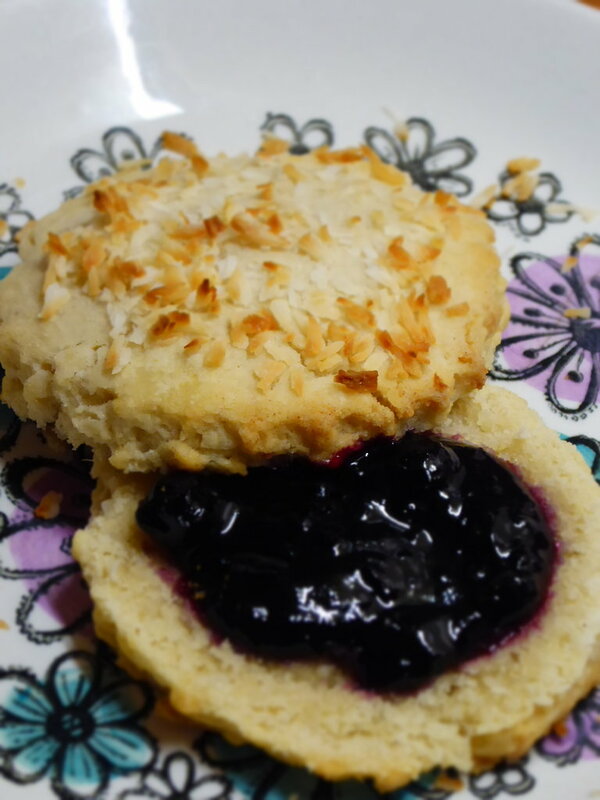 Janice says: “The most delicious scones ever!” These are low in sugar but sweetened with the super healthy coconut. A ingredient Janice and ourselves can’t get enough of. 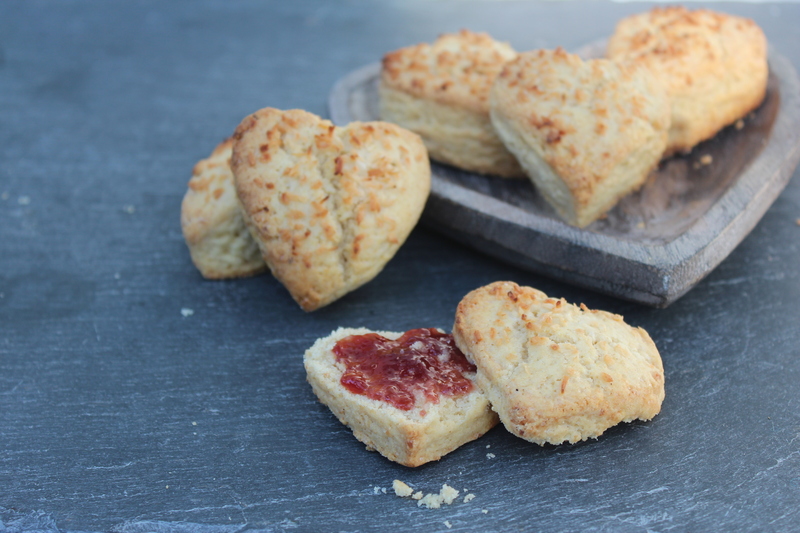 Janice recommends cutting these scones thick, as they should be (otherwise they’re biscuits) and enjoying them straight from the oven with plenty of coconut oil and home chia seed jam! Sounds truly amazeballs!!! 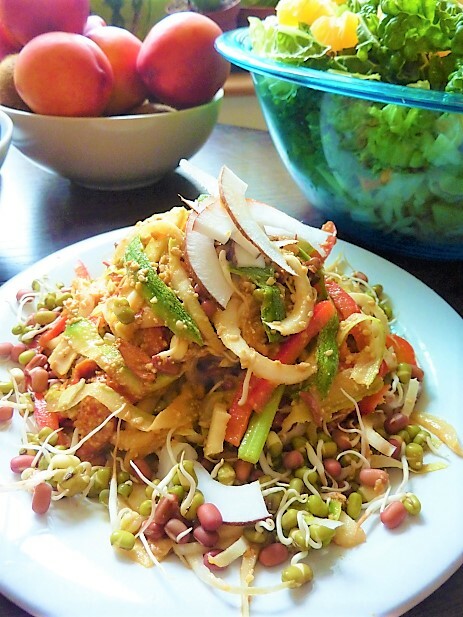 Find plant-based delights and natural health magic over at Janice’s blog ‘Nourished by Nature’. 1. Heat the oven to 220C/425F/ Gas 7 and lightly grease a baking sheet. 3. If you don’t have a food processor then put the flour and baking powder into a large bowl. Using your fingertips rub the spread into the flour until it resembles breadcrumbs. Vegan spreads are really soft so run your hands under a cold tap before you start and work quickly to keep the mixture from clumping. wooden spoon until the mixture comes together. 5. Turn out onto a floured work surface and pat into a round ¾ inch or 2 cm thick. we could all do with more love in our lives! 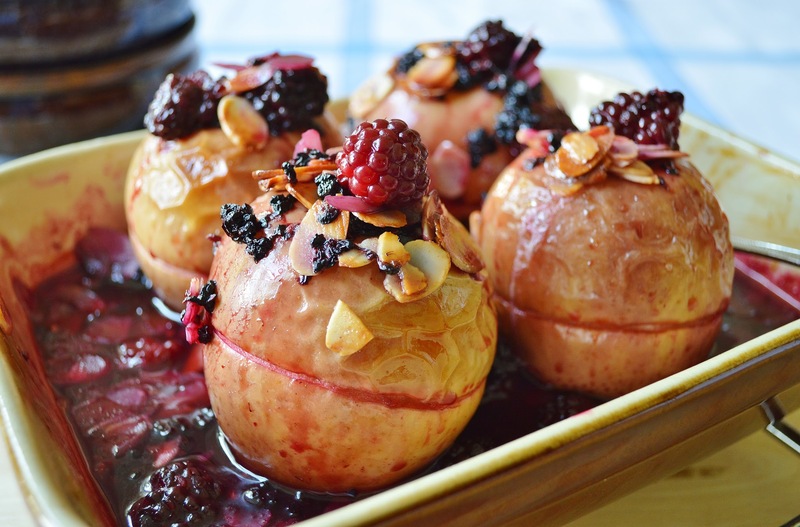 Stuffed Baked Apples with Cashew Vanilla Cream by Victoria. 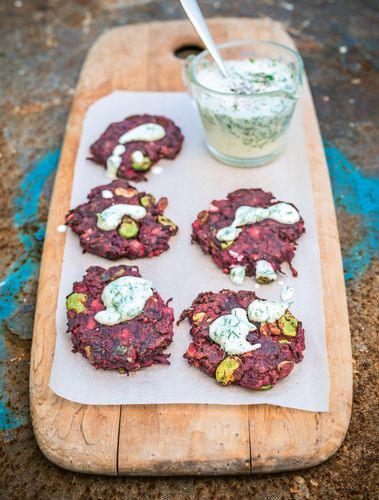 Love the blackberries in this and the cashew cream sounds delicious!!! Amy cooked up a wonderful three course feast! Can’t wait to try the chocolate brownie recipe and curries are always welcome in the BHK. Thank you so much to everyone who has taken part, we loved reading your emails and recipes, the response has really touched us. You’ve made our 4th birthday party extra special. Its been a real celebration of home cooked happiness! 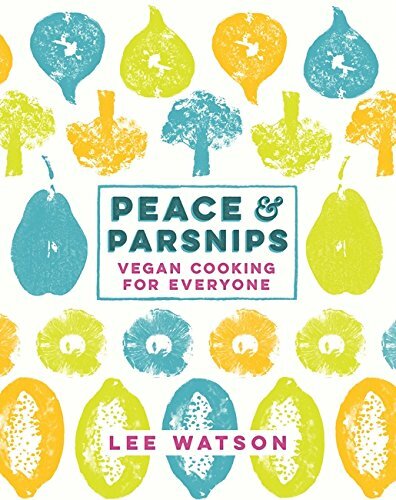 Big thanks to the wonderful folk at Veganuary for featuring recipes from Peace & Parsnips. 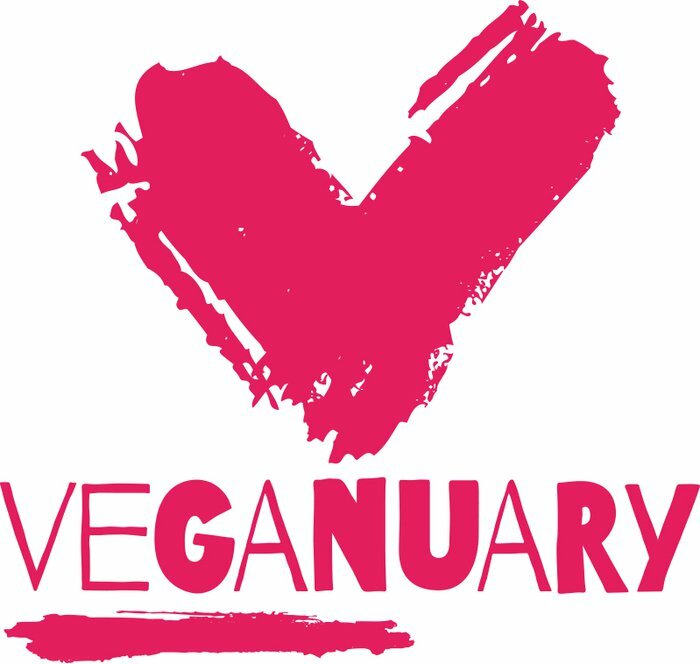 Are you taking part in Veganuary? How’s it all going? I’m sure you’re shining away and if you need a little tasty inspiration, check out the feast below! You’ll find these recipes and many, many more in the ‘recipes’ section of the awesome Veganuary website. I’m busy in the kitchen at the minute and finding little time to blog. Soz about that. I also just completed my taxes for the year which was a very painful experience. Why so many numbers and brackets? I needed some light relief, I needed some bloggin time with you lovely lot!!! Check out our facebook and twitter pages for more BHK shenanigans. 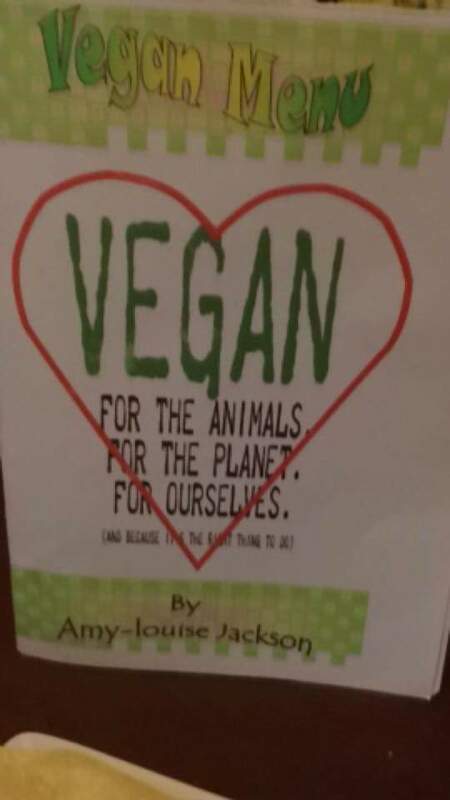 Veganz! Omnivores! Traffic Wardens! Rock Stars! Mamas! Papas! Botanists! Kayakers!……..You’re all going to like this one. January is here and most of us feel quite droopy. Over fed and watered, back to work but filled with good intentions for the new year. Over 15,000 people world wide are trying out a vegan lifestyle in January thanks to the awesome Veganuary (see below). This year we’re all going to be healthy superheroes! Environmental angels! Animal lovers extraordinaire! Just by changing our eating and consuming habits. 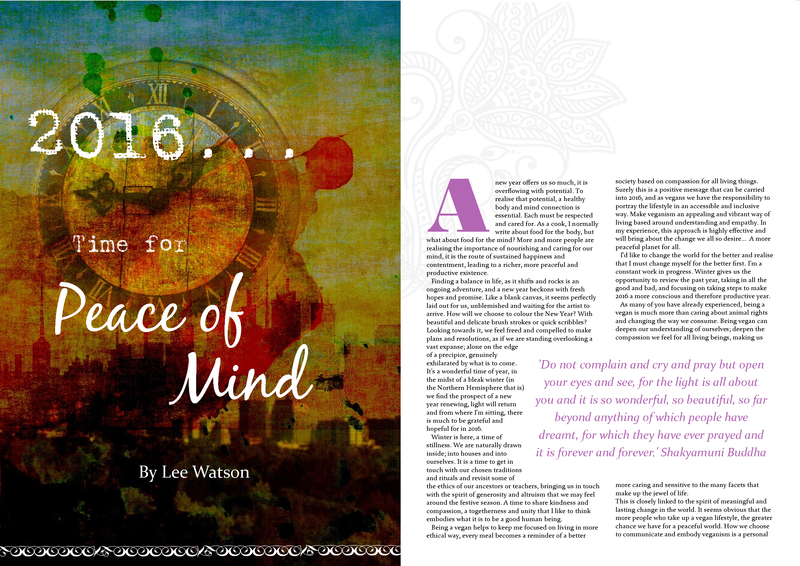 Its such a shining, peaceful, positive way to get 2016 off to a flying start. Here’s a healthy recipe straight out of Peace & Parsnips. Loads of people have been in touch and said that this has been one of their favourites. A colourful twist on your traditional gnocchi. This is a light dish packed with texture, a rich pesto, bucket loads of nutrition and plenty of big flavours. Colourful food always gets us happy and hungry and this is a proper rainbow plate; orange, red, green, red……YUM! It’s an ideal dish for a special dinner, a Saturday night feast or mid-week indulgence. 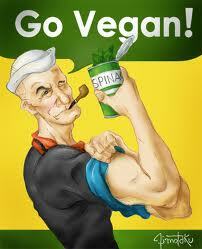 If you are cooking for people who think vegan/ healthy/ vegetables/(fill in the blank….) is boring and bland, here’s something to dispel such misguided waffle. I’m sure this recipe will help all those going fully vegan for this Veganuary. It’s not all veggie burger, tofu and falafels after all. One friend said to me recently, a little apprehensively; “But is being vegan any fun?”, I replied “How much fun is Halloumi???! ?” (We were talking about giving up Halloumi at the time). How much fun is cheese? There is no connection between happiness and dairy products. Trust me. Veganuary is a global campaign that gets people into a vegan lifestyle in January. 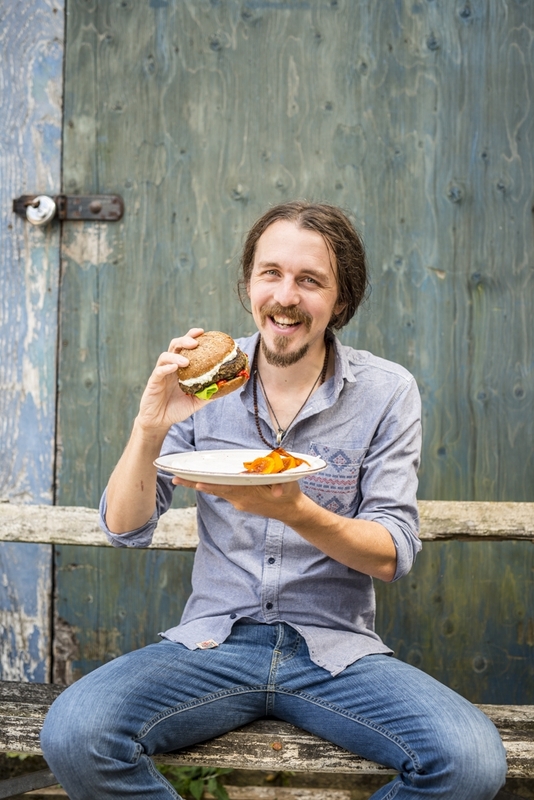 Being a vegan is big news in 2016 and there has been plenty of interest in the press. There are thousands of people giving veganism a try; my Mum and sister are giving it a go and Jane is giving up her Kefir and occasional Cappuccino for the month. I also have a load of friends who are getting into the plant-based party. Its amazing! Jack Monroe is posting vegan recipes over on ‘Cooking on a Bootstrap’ and other celebrities like Vivienne Westwood, Sarah Pascoe and Romesh Ranganathan are taking part. In 2015, 49% of the folk who tried out Veganuary stayed vegan full-time. 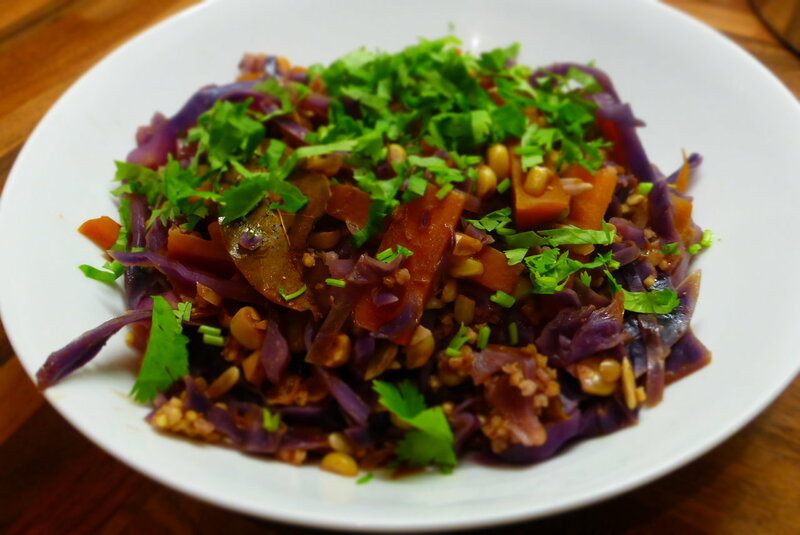 The Veganuary site is packed with information, advice, recipes and inspiration. In fact, you’ll find a load of recipes from Peace & Parsnips over there. Of course, you could also have a wee look at our back catalogue for a massive slice of vegan treats. Being vegan is becoming ever more accessible, there are an infinite number of ways to eat simply delicious, plant-based food. 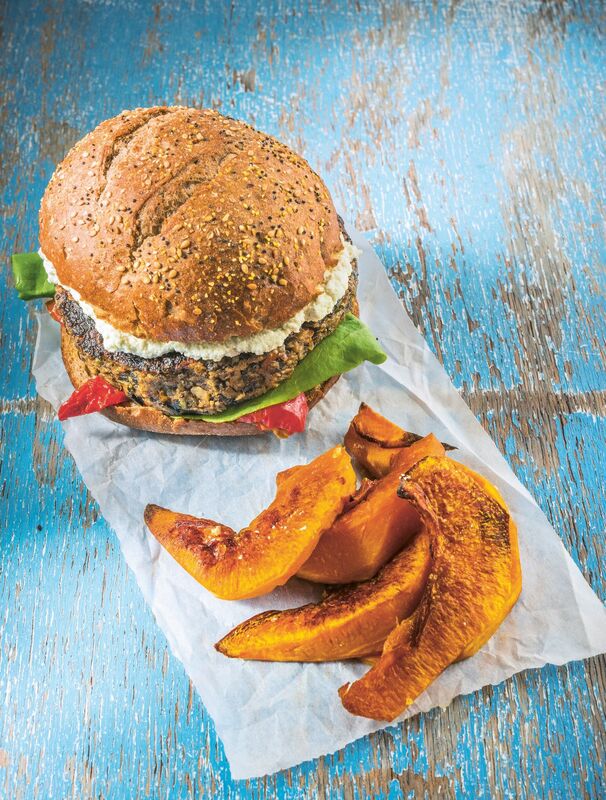 Many more restaurants, supermarkets and suppliers are realising that being vegan is far from a fad. 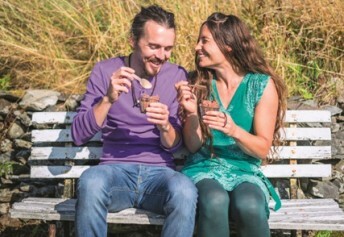 Interest in veganism has grown hugely worldwide in 2015 and will continue to do so in 2016. Making gnocchi with coloured vegetables makes brilliant sense. Any quite starchy root works well: parsnip, sweet potato, purple potatoes, cassava, pumpkin . . . 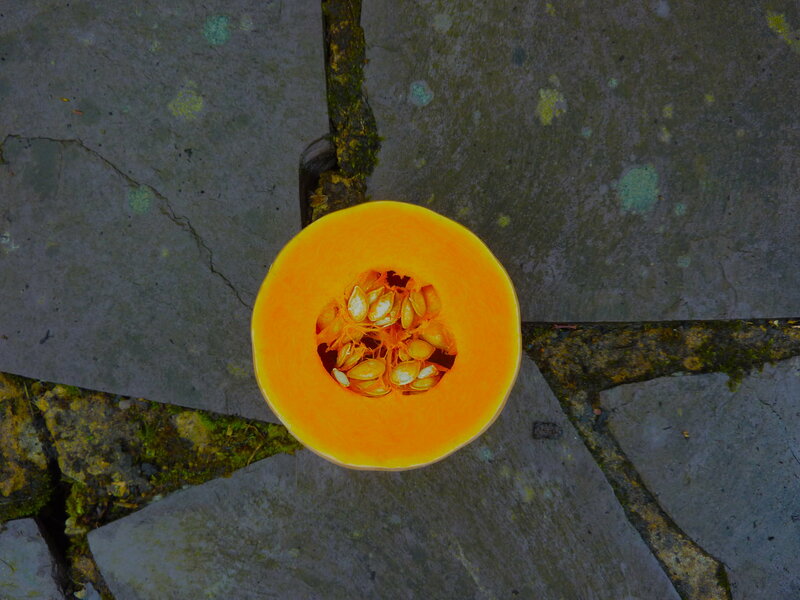 But the vivid orange of squash really electrifies the plate (and the palate). 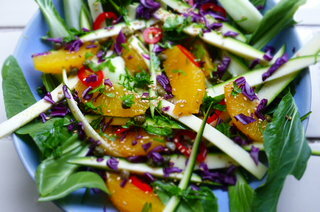 With its vibrant oranges, reds and greens, this dish is a feast for the eyes as well as the belly! First make the spinach pistou (even better if you can make it the day before). 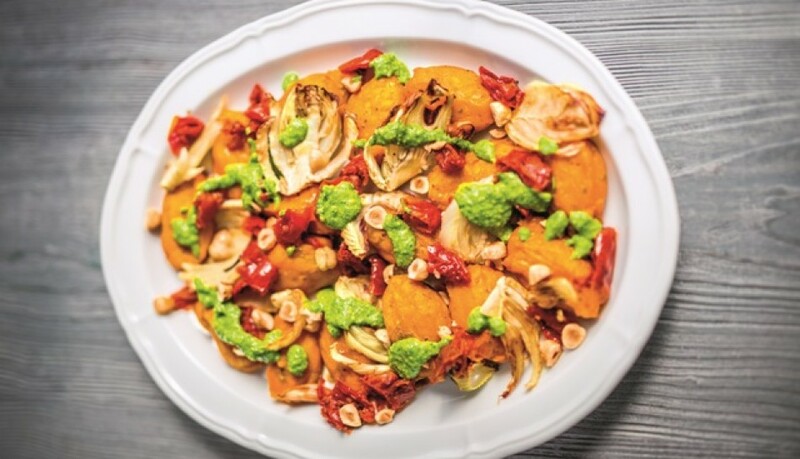 Pistou is a Provencal version of Pesto – much lighter, without the cheese and pine nuts. Place the squash on an oiled baking tray. Rub a little oil and salt over it and bake for 30 minutes, turning the pieces gently over once. You’re not looking for loads of colour here, just lovely soft, golden squash. Toss the fennel in olive oil, place on a separate baking tray and scatter with a pinch of sea salt. Bake for 30 minutes, turning once, until it’s nicely golden and sweet. 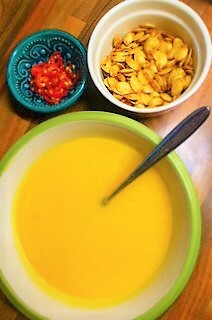 When the squash is ready, put it into a processor with the tofu and blend until smooth. 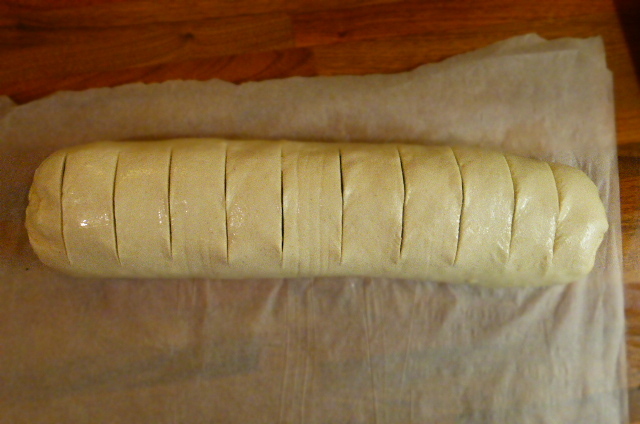 Now, place in a large bowl and stir in the flour, salt, pepper and sage until a soft dough forms. Leave to cool down and firm up – it will be a lot easier to handle. Using two teaspoons, make gnocchi shapes (lovely little flat oval dumplings) with the mixture and place on an oiled baking sheet, leaving about 5cm of space for each gnocchi to grow. Brush the gnocchi with a little more oil and bake for 20–25 minutes, until crisp and slightly golden. For the Spinach Pistou – Place the hazelnuts in a small skillet and warm on medium heat. Keep them moving for 5-7 minutes – they will become roasted and smell so very sweet! Put them into a food processor and blitz for 30 seconds. 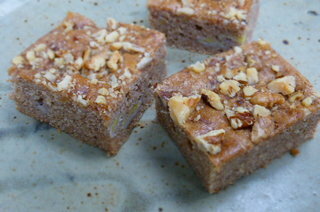 The nuts should begin to break down into lumps and chunks, which is what we want. Add the rest of the pistou ingredients (except the oil) and blitz, drizzling the oil in gradually until you get a nice runny texture, like a think sauce. You will need to scrape down the sides of the food processor a few times. Add more oil if the pistou needs thinning. Check your seasoning and set aside. Warm, on nice big plates, drizzled liberally with the pistou. Scatter the crispy fennel and sun-dried tomatoes on top with a little more pistou, and finish with some chopped roasted hazelnuts. Winter squashes like pumpkin and butternut squash are directly related to summer squashes like courgette and even watermelon (they’re known as the gourd family). You can use most winter squashes in this recipe, as long as they are not too watery; acorn or hokkaido will be delicious. Butternut squash is almost 30% protein and contains outrageous levels of vitamin A which makes our skin shine. They’re also high in vitamin C and boast a good range of minerals like iron and calcium. All of the parts of a squash plant are edible; fruit, flowers, leaves and seeds. 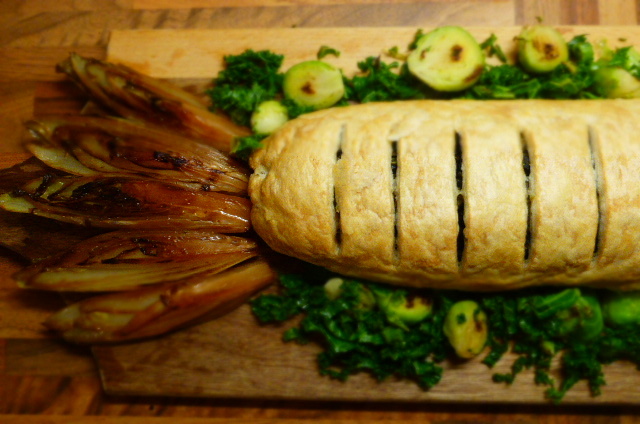 A simple, vegan feast to satisfy all this Christmas! Here is a old school dish that I came up with last night, ideal for a Christmas day centre piece and only using two pans and a baking tray! 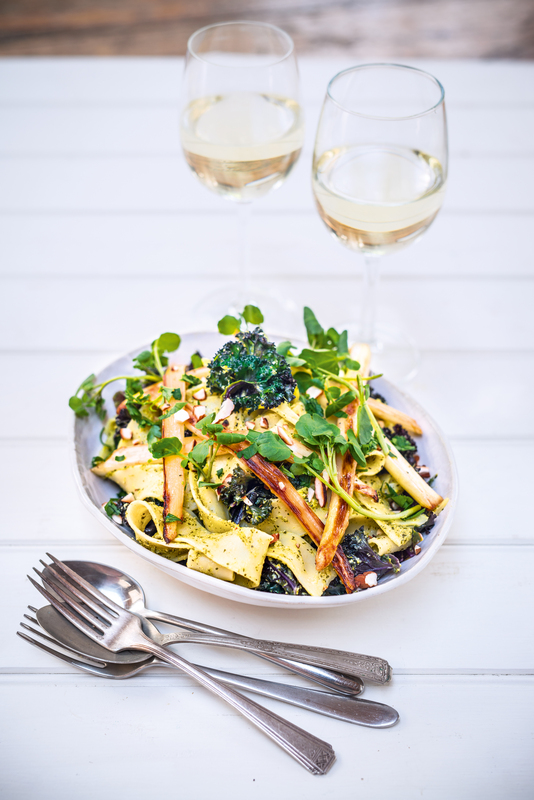 I’ve also included quick recipes for the cooking veggie accompaniments – Chicory braised in sloe gin and pan fried Brussels Sprouts with Curly Kale and the creamy sauce is something everyone will enjoy. You are sorted for Xmas 2015! I’ve had quite a few requests for a Christmas recipe that is both straightforward and seasonal. Being the BHK, we don’t plan things, we just let them leap out of the veg basket and we had to go parsnip this year. It has been ‘the year of the parsnip’ for us in many ways! All of these ingredients most of us have around the kitchen at this time of year. I love the way that we can create feasts from simple plant-based ingredients, packed with bold flavours and interesting textures. We are spending Christmas this year with Jane’s parents and I think they’ll love this dish, a taste of more traditional British fare. A vegan Christmas is a delight! I find that I cook lighter and more nourishing dishes than previous Christmas times. Xmas can be so packed with heavy, rich food and I can’t help feeling lucky to be stuffing myself with food that is delicious and won’t leave me in a food coma, snoring by the fire place. If I could tone down the red wine glugging, Christmas would be a highly healthy time of year! Jane and I will be making a whole host of vegan dishes on the big day and all across the festive season, the perfect time of year to let plants shine and inspire. I like this recipe because it is fun for all the family, no matter what the tastes. The pastry is something everyone can get down with, crispy, flaky and then the filling is packed with flavour finished with a very creamy, slightly cheesy plant-based sauce that will be a surprise to some. Cashews are superheroes for plant-based creaminess. This recipe suits is you are catering for a vegan/s over Christmas. It can be made in advance and warmed up in the oven on the day or you can prepare the filling ingredients and roll the roulade in the morning. I have to say that freshly baked it is tastier and the pastry has a better texture. This roulade will be lovely with any veggies, but we’ve paired it with a few of our extra special favourites; chicory, kale and Brussels Sprouts. A few roast potatoes are never a bad idea! 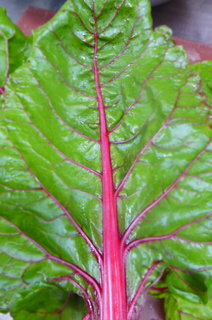 We also love red cabbage however it arises. If you don’t have any nutritional yeast flakes the sauce will not be cheesy. Now may be a good time to invest in a pot of these wonderful, savoury flakes. Especially if you are planning on cooking vegan food regularly. Otherwise stir in some Dijon mustard or herbs. It will be delicious. Cashew butter can easily be substituted by blending up cashew nuts, seasoning with salt. Soak two handfuls of cashews for 2 hours in plenty of water and then blend. They will form a smooth paste, perfect for adding to sauces and stews. If you don’t have access to fresh herbs, that’s cool, lets go for roughly 3/4 teas dried rosemary and 1 1/2 teas dried thyme. You can always taste the leeks after cooking and add more herbs if you like. This is the easiest method of rolling a roulade, you can go for a more traditional roulade roll if you are happy with that. This method is failsafe. Many brands of puff pastry are vegan, have a quick check of the ingredients. Chicory is generally quite bitter but when cooked with a sweet liqueur or even a fruit vinegar, will have delicious sweet and sour flavour. Christmas is not complete without delicious Brussels Sprouts. Simply pan fried in a little oil, with sea salt is my favourite way to enjoy them. Happy cooking and Merry Christmas!!!!!!!! Preheat an oven to 200oc (180oc fan oven). Place the parsnips and head of garlic on a baking tray, toss with a 2 tbs of oil and a large pinch of salt. Roast for 15 mins then gently turn over the parsnips, scatter the walnuts around the tray and drizzle all with maple syrup. Roast for 7 minutes, turn and check that they are not burning. Roast for 3 minutes more until the parsnips are totally. beautifully golden. 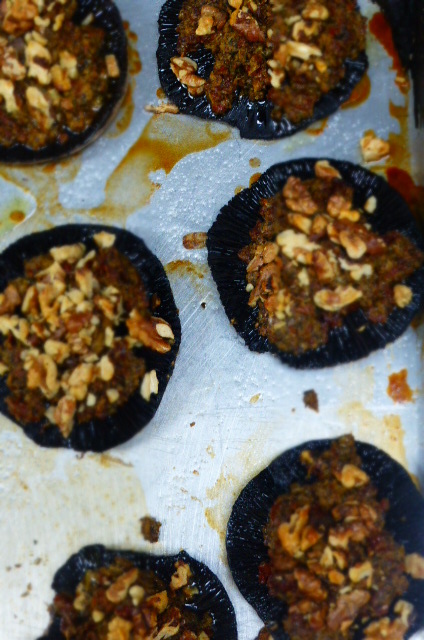 The walnuts will also be nicely caramelised. Little explosions of flavour for the roulade! Scatter over the lemon zest and set aside. 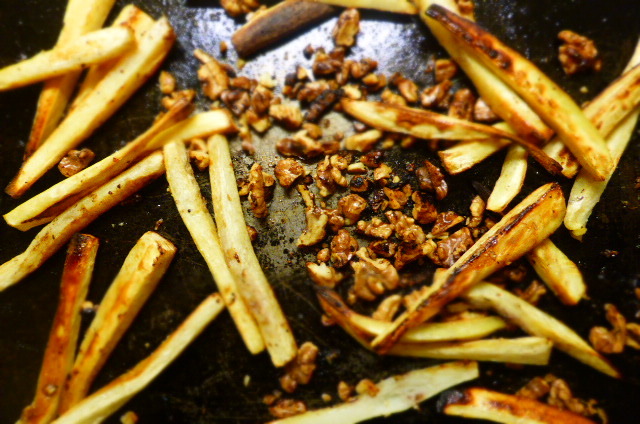 While the parsnips are roasting, grab a large frying pan. Add 1 tbs oil and fry your leeks for 5- 7 minutes. When they are soft, stir in the herbs. Set aside. Rinse out the pan. Now add another 1 tbs of oil to the pan and fry your mushrooms for 8 minutes on a medium heat until most of their moisture has been released. Mix with your leeks, season with salt and pepper, set aside. 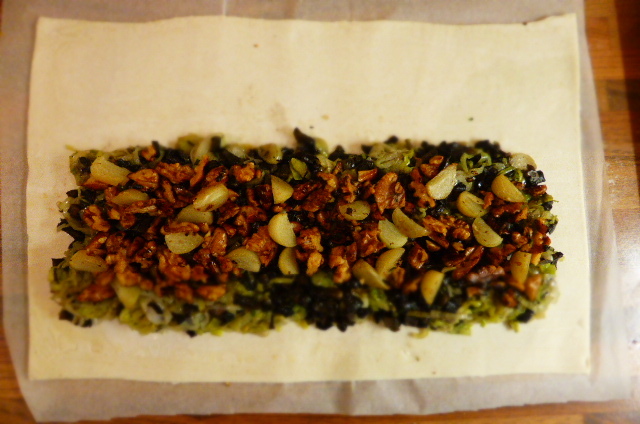 Cut a piece of baking parchment/ greaseproof paper out that will snugly fit in a baking tray. 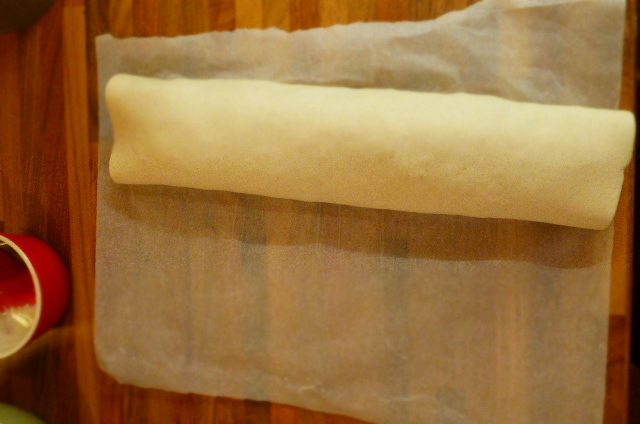 Place on a cool work surface and lightly dust with flour, using a rolling pin, begin to roll out your pastry. Dusting regularly as you roll, it will help to turn the pastry over a few times while you are rolling. You’re looking for a rectangular shape around 14″ by 10″, nice and even. When your happy with the size, trim the edges of with a sharp knife. 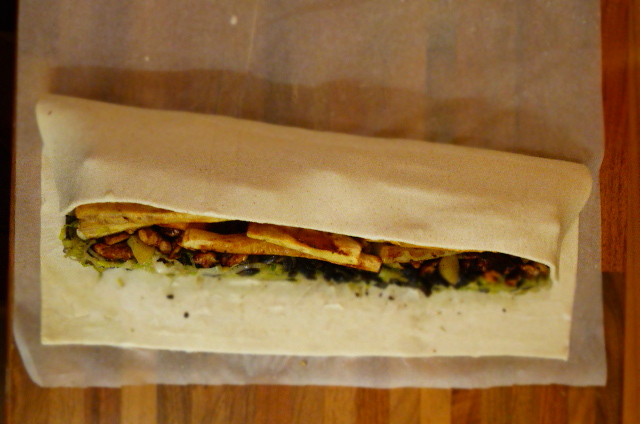 Using the baking paper, roll one edge over…..
Cut slices into the top of the roulade and brush with soya milk. Place in the oven for 40-45 minutes, turning once to get a nice even bake. Sauce time. Simple. Add all of the ingredients to a small saucepan and warm until a low simmer, stirring regularly. Pop a lid on, turn the heat down and leave to slowly cook through for 10 -12 minutes. Once the leeks are soft, stir in the yeast flakes and blend with a stick blender, adding salt as needed. This sauce does not like to be boiled for a long time, a low simmer is ideal, keep your eye on it. In your trusty frying pan, add 1 tbs oil and warm on a high heat. 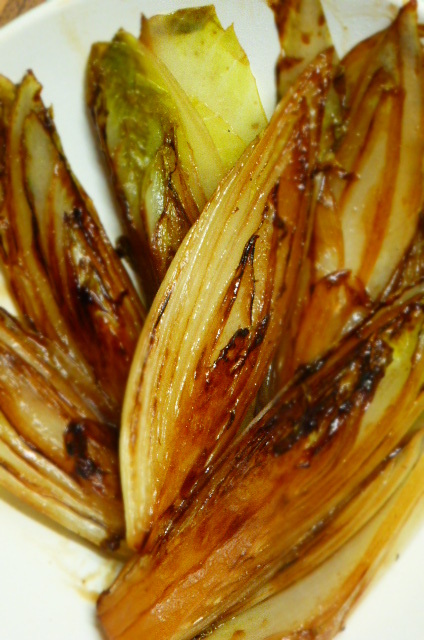 Lay in your chicory pieces, season with salt and pepper, fry for a couple of minutes until well caramelised and then turn over. Fry for another 2 minutes, drizzle over the sloe gin. Lower the heat, pop a lid on and leave to cook for 5-7 minutes, adding a splash of water if needed. The chicory will bes soft, set aside and keep warm. Rinse out the pan. Adding 1 tbs oil, warm of medium high heat and add the sprouts. 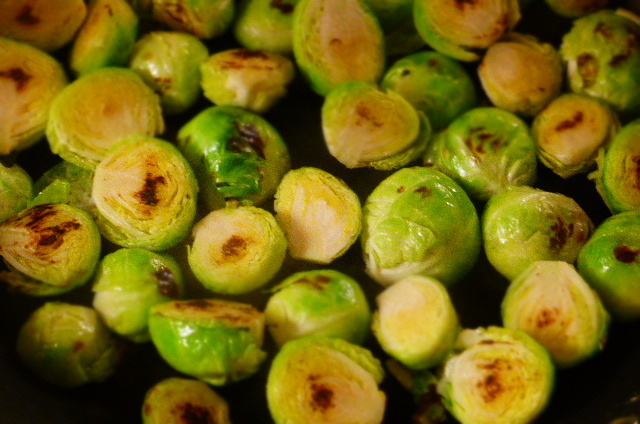 Toss gently and fry for roughly 6 minutes, until the sprouts are nicely coloured (the way you like ’em). Now add your kale and a splash of water. Lower the heat and leave to cook for 6 minutes. Try one (yum!). Season with salt. You’re now looking good to serve your festive feast! 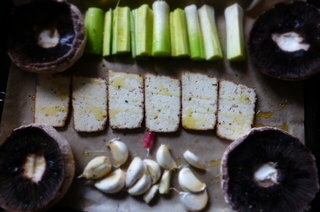 Place the golden roulade onto a nice serving platter (big plate) or chopping board and surround with glorious veggies. Using bowls to serve the leftover vegetables. Pour the sauce into a warm bowl/ sauce boat and enjoy the feast! 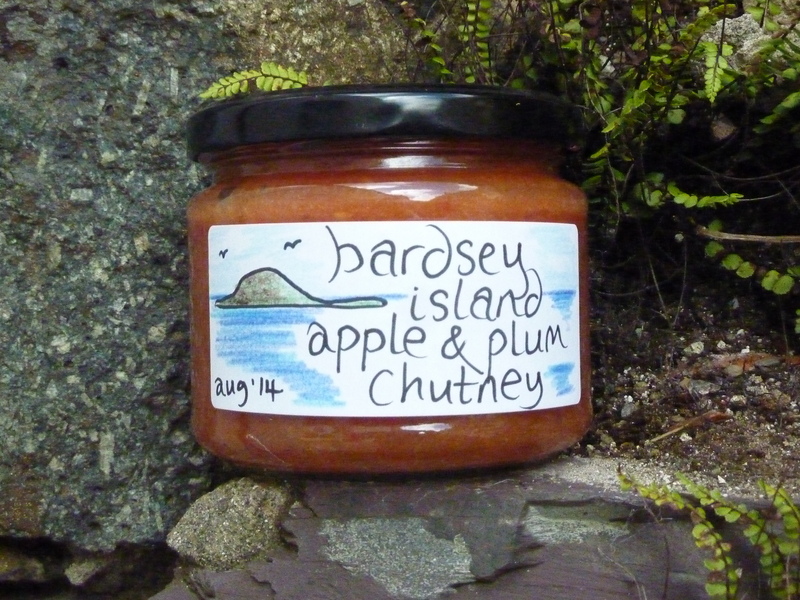 This dish goes brilliantly with a spoonful of our Pear and Cranberry Chutney. There are zillion and one Xmas stylee recipes floating around at the minute, but I would like to take things is a slightly different direction here. All the way to Lebanon!!! Here’s a little festive taste of the Southern Mediterranean, with plenty of warming spices and a really rich and luxurious dip. This Muhammara recipe is one of my all time favourite dips/ purees and it features in our cookbook. It is an ideal alternative to hummus at this time of year. I love hummus, but a change is always good! Everyone is roasting cauliflower at the minute and I’m all for it. 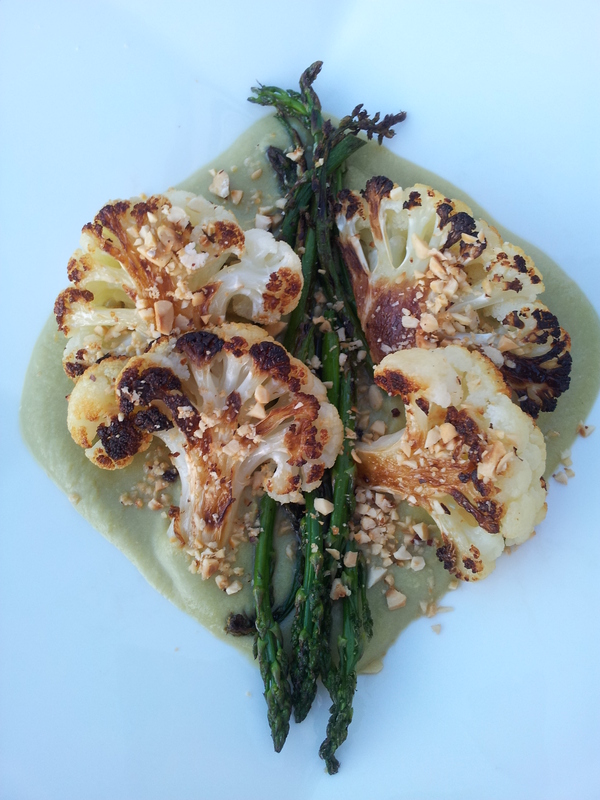 Roasting brings out the sweetness of the cauliflower and transforms it into something spectacular. Cauliflower is worthy of taking centre stage and in this recipe, with a few adornments, it shines. The spices and pomegranate molasses here really takes it up a few notches. I would eat this as light lunch around the festive season, when you have maybe gone overboard the day before, and it is nice and easy to get together yet bursting with vibrant flavours. 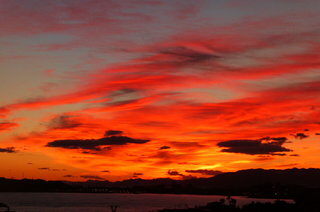 Jane and I are not long back from Spain, where we had a magnificent time by the beaches and mountains of Murcia. 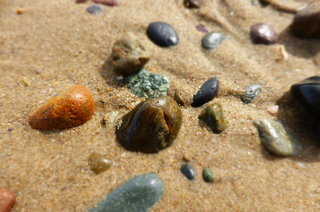 Regular Beach House readers will know that its one of our favourite spots in the world and we return their regularly. You will also notice, by the beaming sunshine, that this dish was cooked in sunny Espana. My parents own a little house out there and I’ve lived and worked over there so its just like going home really. Our Spanish lingo is improving and we seem to do a load more socialising over there than we do in Wales, something to do with the free-flowing tapas and wine no doubt. WHAT TO DO WITH POMEGRANATE MOLASSES? I know that Pomegranate Molasses may not be top of your Christmas/shopping list this week, but it is a brilliant addition to your cupboards. It can be used to jazz up roasted roots and veggies, as it does in this recipe. It has a lovely sweet and sour flavour (think cranberries) and is high in sugar, meaning it adds to the caramelised effect we all know and love in roasted roots et al. 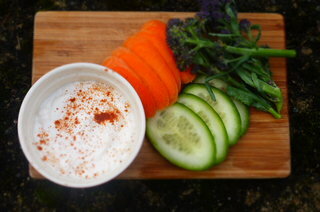 It can also be a wonderful sub for citrus in dressings and adds richness and depth to stews, dips (see below) and soups. Have a play with it! 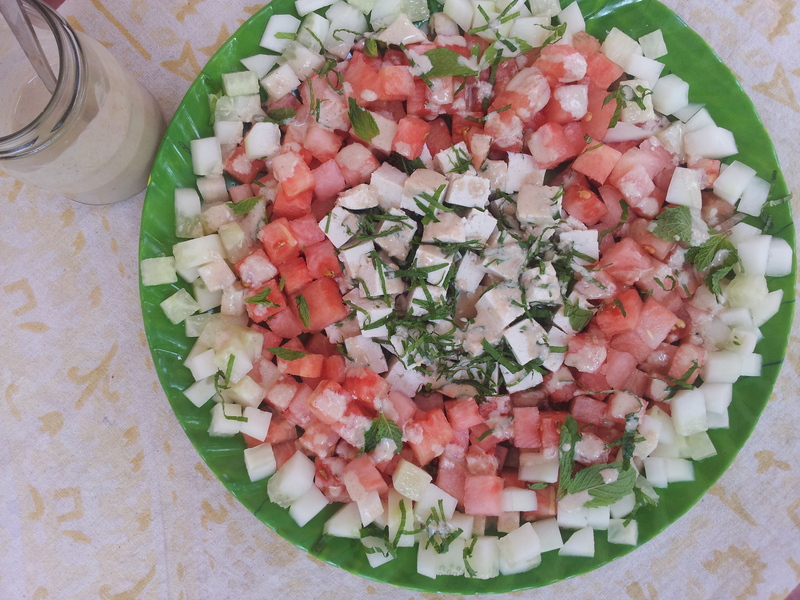 We also like it drizzled on bread or mixed with tahini to make a delicious spread for toast or even stir it into hot or fizzy water for a refreshing drink. Pomegranate Molasses is something that is used so frequently in countries like Lebanon and Turkey, where Pomegranate trees are as frequent as oak trees are in Wales. It is an ideal way of preserving gluts of Pomegranates and turning them into something gorgeously versatile. It is basically pomegrantes juice cooked down, way down, until a sticky syrup is formed. You can buy it in Turkey in plastic water bottles by the side of the road. PM is tangy and not overly sweet, unless sugar has been added, check the bottle. I will be looking at posting a few more festive fav recipes on the blog before the big day. I’ve just roasted a load of chestnuts and they need a home. Any ideas? There are loads of our holiday snaps over on our Facebook page and I am always sharing tasty things on Twitter. When cutting the cauliflower, don’t worry too much about small pieces that break off. These can be kept and used to thicken/ flavour soups, gravies and stews. They can also be sprinkled into salads. Baharat is a spice mix from the Middle East. You may also like to use garam masala, ras el hanout etc. Spice mixes which include warming spices like cinnamon, cloves, nutmeg etc are perfect. If you do not have pomegranate molasses, use a squeeze of lemon juice and sweetener of your choice; brown rice syrup, maple syrup etc. This adds that gorgeous sweet and sour finish to the roasted cauliflower. Fennel seeds are a great addition to many dishes and worth buying. They add a little explosion of that unmistakeable aniseed/ fennel flavour. I understand that they are not a regular ingredient and can be omitted, add a few more cumin seeds if you are fennel-less. I know Christmas is a super busy time of year, you can buy pre-roasted red peppers in most shops. They are normally jarred and stored in oil. This will save a little time with the Muhammara. Preheat an oven on high, 240oC. Start by roasting the peppers for the Muhammara. Rub oil over the peppers and place on a baking tray. Roast for 15-20 minutes, turning them once, until they are slightly blackened and soft. Place in a bowl and cover. Once cooled, cut in half and remove the seeds, peeling off the skin. It should slip off nice and easy. 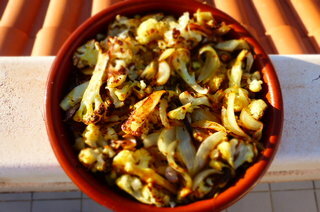 In a bowl, gently toss the cauliflower, onion and garlic in the oil, cumin seeds, fennel seeds and salt. Scatter over a baking tray and place in the hot oven. Roast for 12 minutes. Turn all veggies over using a flat spatula (including the head of garlic), there should be some nice caramelised edges forming on the cauli and onions, this is definitely what we want. Even nice, dark charred edges are great for this recipe. Now sprinkle over the baharat spice and drizzle over the pomegranate molasses, give the tray a little shake and pop back into the hot oven for 10 more minutes roasting, until dark golden and crispy. While all the roasting is going on, you can make your Muhammara. Place the peppers and all other ingredients in a food processor and blitz until creamy. Check the seasoning and scoop into your most attractive bowl. Warm a nice big shallow bowl or serving platter and scoop over your cauliflower. The garlic will be nice and soft, just pop the cloves out of their skins and scatter over the dish. The aroma of this dish is a delight. Spicy! Sprinkle a little more Bharat over the cauliflower and finished the Muhammara with a drizzle of delicious olive oil, a sprinkle of paprika and a little freshly chopped parsley. 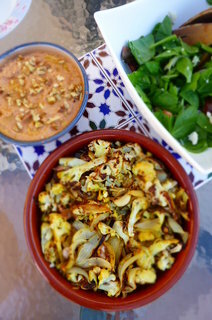 The Roasted Cauliflower and Muhammara will be delicious with a crisp, green salad and a bowl of olives. In Peace & Parsnips I recommend warm black olives and toasted pitta bread. Pickles of any variety will be a great addition. Now this is really starting to sound like a feast fit for the festive season! Pomegranate certainly brightens up this time of year and I much prefer the flavour to cranberries, our festive staple for tanginess and that lovely festive touch of bright red. Pomegranate is packed with vitamins C and K and is also high in calcium and potassium. Pomegranate is also a good source of fibre and will help to keep our heart, digestive and immune system healthy. Perfect food to get us through the dark, winter days. 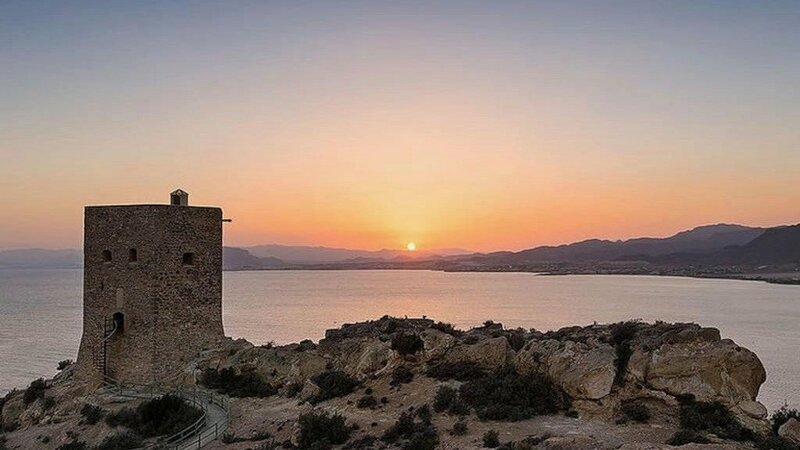 Mazarron sunsets demand a G+T – Murcia, Spain. We are really giving it to you here! A restaurant-ified dish made at home with very little mess and fuss. Our kind of food! It also happens to be outrageously good for you. This is utter, guilt-free indulgence. These stacks sound quite complex, but are actually anything but. In fact, it would be a good restaurant dish for the same reasons. It’s simplicity. A few ingredients speaking nicely together all wrapped up in a creamy lentil sauce. If you meet a vegan/ vegetarian who says they don’t like Portobello mushrooms, look them right in the eye and repeat the question very slowly and slightly suspiciously. “Are you sure??? ?” They may be an undercover carnivore. 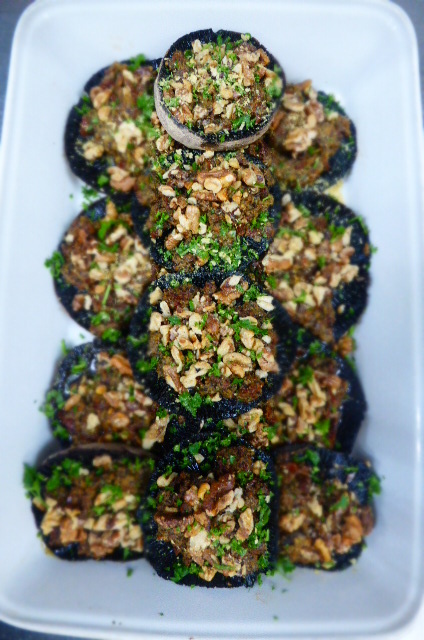 All veggies like Portobello mushroom, they are so flavoursome and have a magnificent texture. They can be used in all sorts of ways to sate even the most ferocious of carnivores. Some whack them in a burger, other use them as a base for stacking fun and games (that’s me). Hazelnut tofu is not that easily sourced, but you can always use firm tofu instead. I’d recommend marinating it in a fridge for a while. Press the tofu to get rid of most of the excess moisture and then glug a little tamari (or good soya sauce) over the top. Toss the tofu in the tamari and leave for a couple of hours before use. Hazelnut tofu can be bought in health food shops and the like, it can also be ordered online and is one of Jane and I’s favourite treat bites. You would like the lentils quite thin, it is a sauce by name after all. Add a little more water to make it the consistency of a thick gravy. Leeks, how we have missed them. Most of our recent dishes have revolved around the mighty leek. Wales does many things well; sunsets, leeks and hail stones and you can only eat one of them. Leeks, how we adore thee. Wash your lentils well, cover them with fresh water and drain. Keep doing this until the water is clear. Grab a medium sized saucepan and add 1 tbs oil, warm on a medium heat and then add the sliced garlic, stir and fry for a minute, then add the chopped tomatoes, stir well. Pop a lid on and allow to bubble on a fast simmer for 5 minutes. Now add the lentils and water, turn up the heat and bring to a boil. Drop a lid on and lower the heat to a steady simmer. Cook for 15 minutes. Stir in the leek greens and the thyme, place the lid back in and cook for a further 20 minutes. Adding more water to make thick, gravy like consistency. Season to taste with salt and pepper. Keep warm. Preheat and oven to 180oC. Line a baking tray with baking parchment, drizzle over a little oil and rub over the tray with your hand. Then lay out all of your veggies onto the tray, including the tofu. Sprinkle with salt and pepper. Pop in the oven and bake for 20 minutes, remove the mushrooms and tofu, turn over the leeks and garlic, place them back into the oven for 10 minutes (if they need them, they should be nice and soft with the occasional caramelised hue). Assembly job – in a warm serving dish (or you can serve each stack individually on warm plates). Cut your tofu in half lengthways, pop the garlic out of their skins (they should not need much encouragement). Now place two pieces of leek and two cloves of garlic onto a mushroom and top those with four nice slices of tofu (criss-crossed looks cool). You can put these back in the oven on a low heat to keep warm until serving. 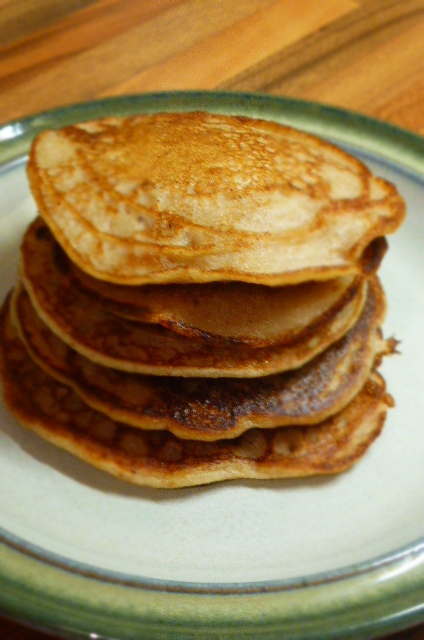 Pour a thick layer of lentil sauce over your serving dish/ plate and gently place one of your towering stacks on top. Sprinkle with something green, a little more seasoning with salt and pepper and a slight drizzle of good olive oil. Leeks can be a little overlooked from a nutritional point of view, their more popular cousins the onion and garlic get all the attention. This means there isn’t as much nutritional info out there about them. 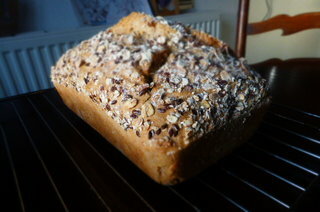 However, we know that leeks are champions of Vitamin K (see our last article, No-Knead Everyday Loaf, for more on ‘K’). We also know that they are high in Manganese (good for bones and skin) and Folates (Vitamin B’s that keep our cardiovascular system in order). Probably the most interesting thing about Leeks are their history. They originate from Central Asia (not Wales) and were highly revered by the Romans, in fact Emperor Nero used to eat alot of leeks to help give him a strong voice. Leeks were in fact introduced to the UK by the Romans and are probably most famous for being worn in the helmets the Welsh army, who defeated the Saxons in 1620. Read more excellent nutritional info here. Follow all the Beach House Kitchen shenanigans and updates on whats going on with the new book Peace and Parsnips on Twitter. Millet is birdseed right?! No,nononononononono. We see it more as future of food and it certainly makes a tidy casserole. Millet can be creamy and fluffy, sweet and savoury, roasted or steamed like cous cous (although gluten free). It is a hugely versatile grain and one that we peck at regularly. We reckon Millet also has a bad rap due to the sub-standard outdoor equipment shop (named ‘Millets’) that has tried to steal some this wonder grains glory. This is one of those substantial veggie dishes which makes me think of old fashioned vegetarian fare from the Cranks days (one of the first veggie restaurant chains in the UK, sadly now closed, but there is one left in Totnes I believe, fighting the good fight). We have a load of Cranks recipe books from the ’70’s and ’80’s in the kitchen where I work and I love to leaf through their worn pages and pick out some proper golden oldies. Most are simple and hearty, I love their simplicity, it feels like honest food. 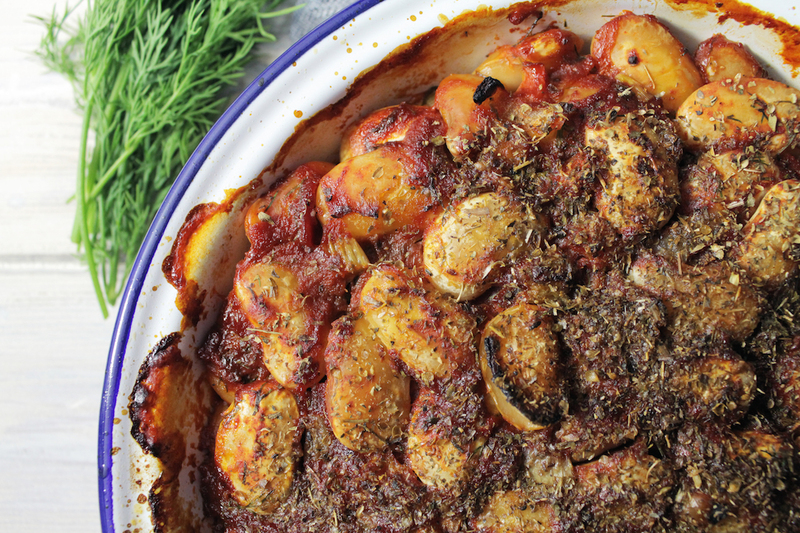 This casserole is a perfect, quick, one pot wonder for a chilly autumn eve. If I was a mother of many children (and lived in a shoe!) 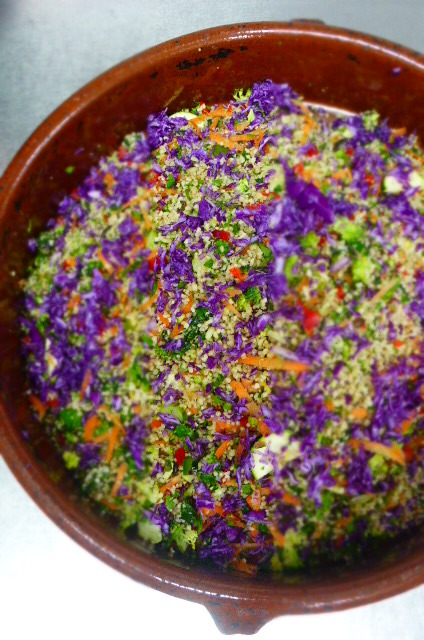 this is the type of dish I’d make every Tuesday or Wednesday……Its even a little bit pretty, with striking colours. Not something you associate with the word ‘casserole’. 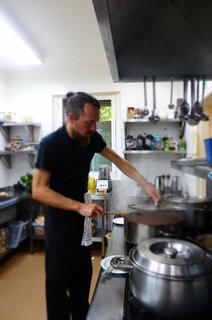 I’d had a busy day cooking for quite particular meditators at the retreat centre (it’s a lovely place called Trigonos) and was not exactly in the mood for more pot and pan bashing. 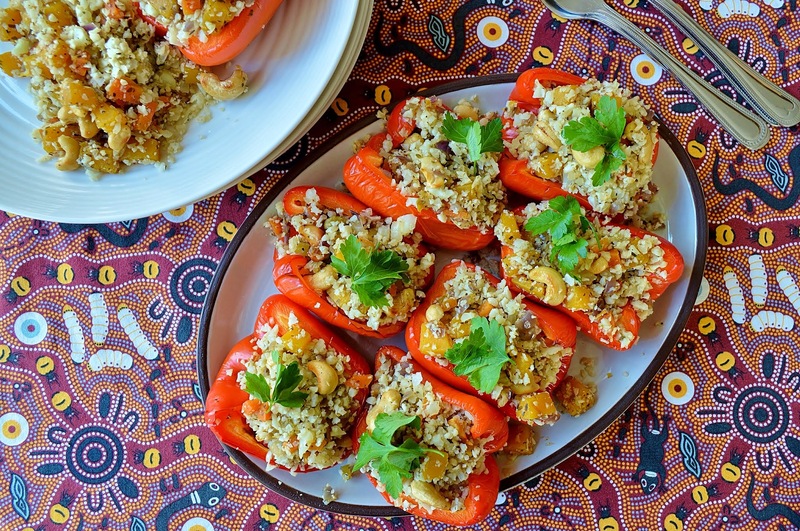 Jane stepped in and whipped up this little beauty in a flash and it was a very comforting, wholesome dish, filled with the joys of early autumn and millet. Millet is a superstar, see the ‘Foodie Fact’ below for the many reasons why. There are three main ways to treat millet. Always rinse it first and leave to soak for a couple of minutes, picking out any weird looking things that float to the top. 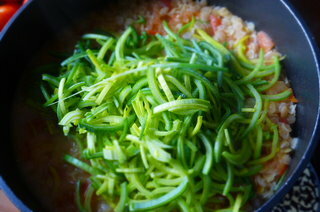 Fluffy – mix one part millet to two and a half parts water in a pan and bring to a boil, cover and simmer for 25 minutes. This will result in light fluffy grains, something like a rice with bells on. Mashed – follow the steps above, but stir regularly adding water as you go. Keep stirring and adding little splashed of water until you have your desired ‘mash’ consistency. Toasty – In a dry saucepan on medium heat, toast the millet gently for around 7 minutes, stirring regularly until the turn a darker shade of gold. Then add the water, cover and cook for 25 minutes. Millet swells up nicely, roughly the same volume as rice. 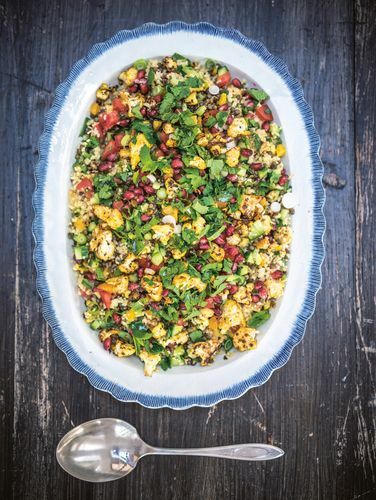 If you have leftovers, it makes for a great alternative in Britain’s new favourite dish, Tabouleh or any cous cous/ quinoa style awesome salad. You can also mix leftover millet with milk, warm and serve for breakfast as a porridge sub (adding your favourite adornments). I also like to make millet Halwa, using it instead of the traditional semolina. I find millet more flavoursome. 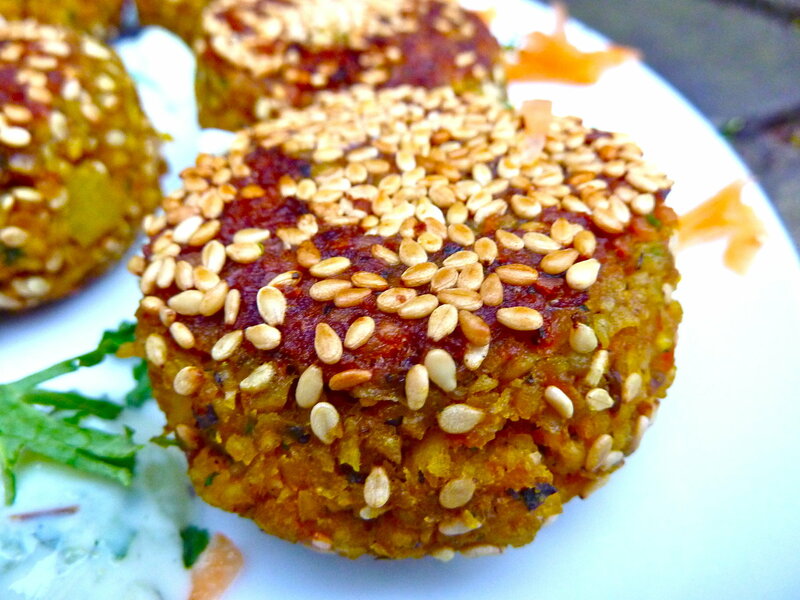 Millet will aslo make the best burgers/ falafels, it has a slight stickiness to it, espcially if you cook it like mash. There is also the option of grinding your millet into flour (use a coffee grinder or a decent food processor) and add it to bread/cake/muffin recipes, it makes for a mean gluten free flatbread. Jane is enjoying her new cookbook, The Mystic Cookfire by Veronika Sophia Robinson, a mighty tome overflowing with pot bubblin’ recipes and a huge amount of wonderful guidance regarding a holistic, vibrant approach in the kitchen and in life generally. I bought it for Janes birthday and since then we’ve tried a few of the lip-smacking recipes and love ’em. If we were dishing out marks out of 5, we’d give it a 4.9999999999999999999999999. I believe this recipe resembles the ‘Carrot and Courgette Casserole’ in T.M.C. We have been revelling in the weather of late and Beach House has been bathed in sun for three days now. 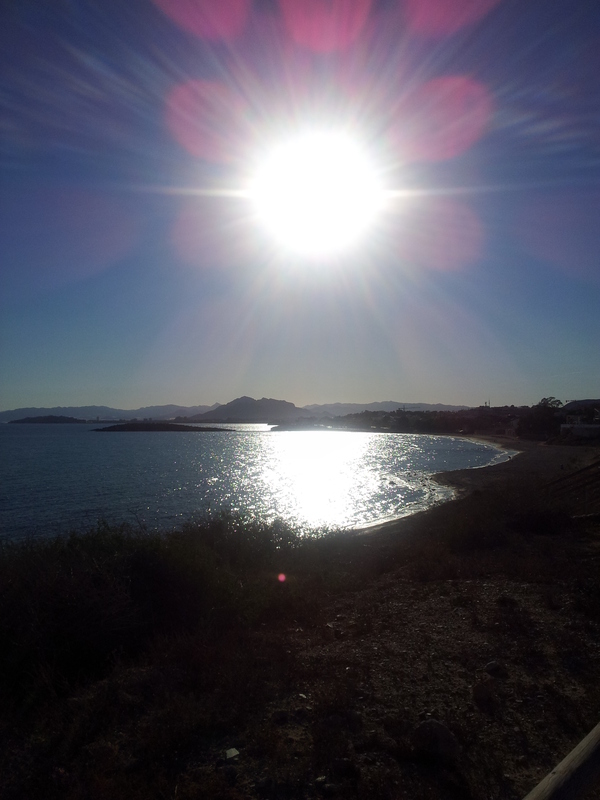 THREE DAYS OF SUN. So much, we don’t know what to do with it all. If only we could bottle it for January time! Dad’s here and revels in a good feed, we’ve been picnicking in the garden, what we call a ‘Fridge Clearing Tapas Adventure’. 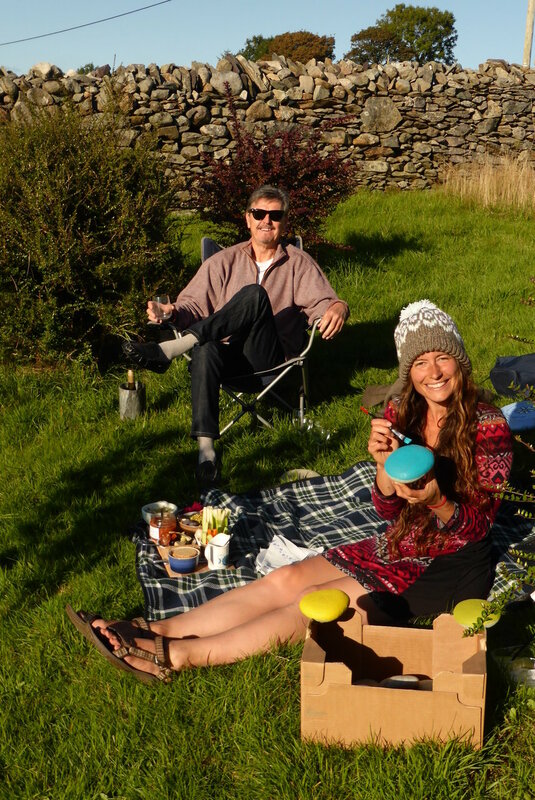 Random jars, packets and potions appear on a chopping board and then we go and sit in the long grass and if you’re Jane, paint rocks, if you’re Dad, drink wine and if you’re me, do both. All of these ingredients came in our veg box this weeks from Pippa and John in Bethel (few valleys to the East-ish). Its fully organic and this situation always brings smiles to our bellies and faces, we even topped it with parsley from the garden for that extra homegrown vibe. You could use any variation of vegetables with this recipe, just make sure that they will cook evenly (harder vegetables will need cutting thinner than softer ones). Soggy veg is simply unacceptable behavior!!!! Millet absorbs alot of liquid, you may prefer this dish served with a little soya yoghurt on the side, mix freshly chopped herbs and a little lemon juice into the yoghurt an even better version appears. Sweetcorn is one of my favourite autumn treats. They are probably best roasted or steamed whole and gnawed at like a content doormouse, but sometimes the cob just gets in the way and you want to spread those kernels for extra YUM! The technique goes like this; stand the cob on the stem end, holding it firmly between thumb, index and middle finger, bring a sharp knife, in sawing motions down the cob, cutting evenly at the base of the kernels. They should come off in a lovely corn sheath, you then simply twist the cob around slightly and continue your merry sawing until all kernels are liberated. This takes a little practice and please watch those lovely digits. There is no comparison here with sweetcorn from tins, they are two very different shades of delicious-ness. P.S. – Dear Brits, you know how we generally use cups. Soz. Its just so much easier than weighing things out in grams. Is this a pain for you to convert? Warm the olive oil in a large, heavy bottomed saucepan or a casserole dish (hob friendly). Add the onion and fry for 5 minutes, then add the carrots, corn and cabbage. Fry and stir for 3 minutes, then add the millet, seeds, sultanas, salt and spices, pouring over the vegetable stock. Warm an oven to 180oC, pour into a casserole dish, pop a lid on and bake for 20-25 minutes, until the carrots are softened and the millet is cooked and fluffy. Try some, if its slightly ‘chalky’ when bitten, give it another 5 minutes. Alternatively, if the oven is not on, opt for the pan-casserole, a Beach House approved phenomenon which saves energy. Basically, follow the above method, but simply pop a lid on the saucepan and leave to simmer for 15-20 minutes. If the millet has absorbed all of your gorgeous stock and you feel its a bit dry, simply pour in a splash warm water (from the kettle is best), stirring as you go. Until you reach your ideal texture. Sprinkle over some fresh leafy herbs and a drizzle of olive oil. We have also stirred light tahini into this dish, which is amazing! We served ours with a light green salad. Millet has been around since we dropped down from the trees and started wandering around. It is very popular in African and in India they make roti out of ground millet. It is much more widely consumed outside of Western countries and in India especially, is making a real comeback. It seems that we turned our back on millet, opting for what seemed like more appealing grain varieties, specifically rice and wheat. Most countries in the West ate millet before we discovered corn and potatoes in Latin America. Millet is not so common, but you’ll always find it in your friendly local health/ wholefood store in the grain section (although it is actually a seed). It is worth the extra effort and we admit to being millet hoarders, we can never buy just one bag of the stuff. Millet is high in magnesium which makes it good for the heart, like oats, and can also help to fend off migraines and asthma. 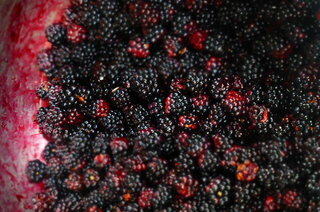 It is high in fibre and also contains phyto nutrients (like antioxidants), especially lignans (very good guys). Add to all of this the fact that Millet is completely gluten free and grows very well in the U.K. we surely have a contender for the future of allergy friendly, nutritious grain of the future. Finally, we post something!!!! We have loads of half finished bits typed hurriedly in internet cafes, but have yet had the time and drive to actually finish one off! We’ve been in Indian now for three months and things have been thick with experience and too many foodie experiences to recollect. 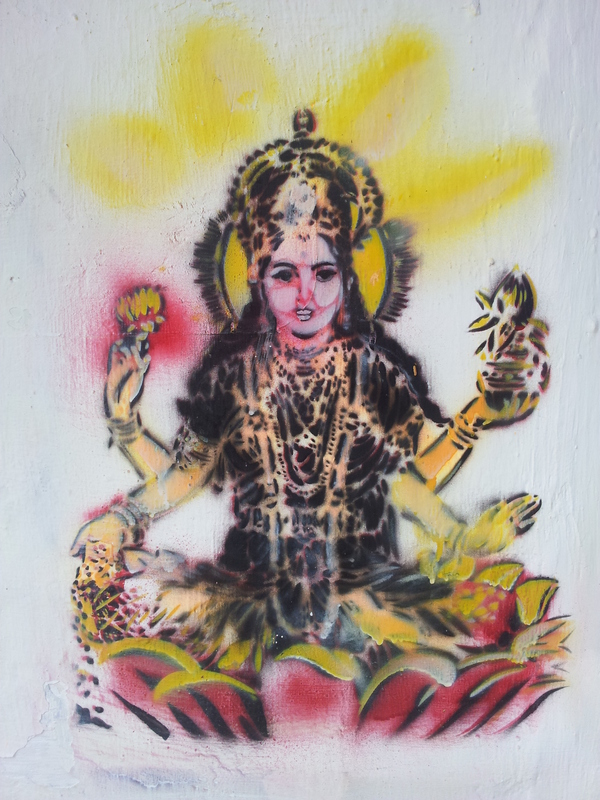 Expect many Indian themed post soon, packed full of delicious and authentic recipes……. Kodai is a little ex-British Hill Station (somewhere where the Raj used to go and cool off during the summer months). 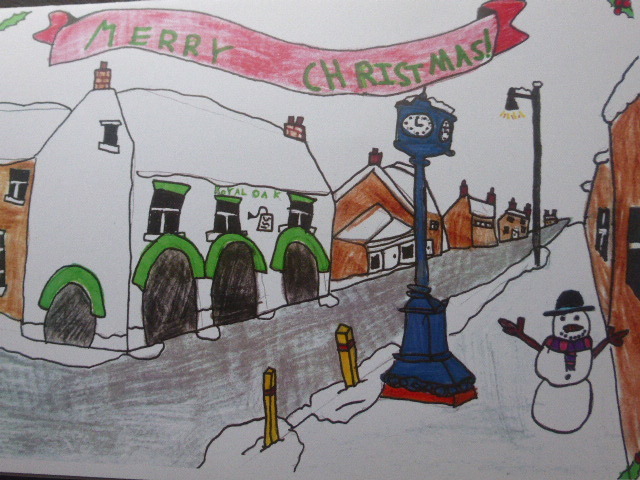 Lots of little Anglo Indian stone cottages with lawns and chimneys, tea rooms and a beautiful lake. We are staying on a farm, on a steep slope, with spectacular views over the plains towards Madurai. It thick jungle, full nature and absolutely beautiful and best of all, we have a small kitchen to play in!!!!! A random little post here, but we are half way up a hill in the middle of nowhere (Southern India). 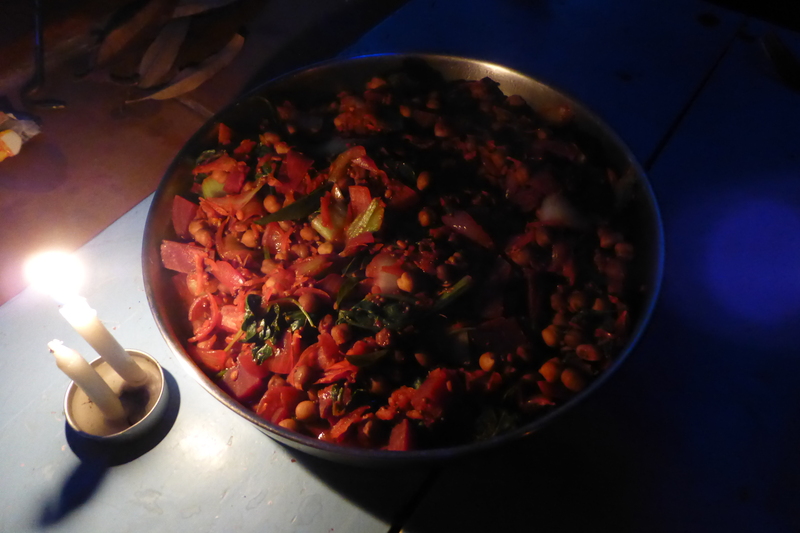 This recipe came together on our first night in Karuna Farm, in the green and verdant Western Ghats of Tamil Nadu. We have been sweating and meditating, sweating and yoga-ing, sweating and chanting our way through the early part of March in the Sivananda Ashram, outside Madurai. 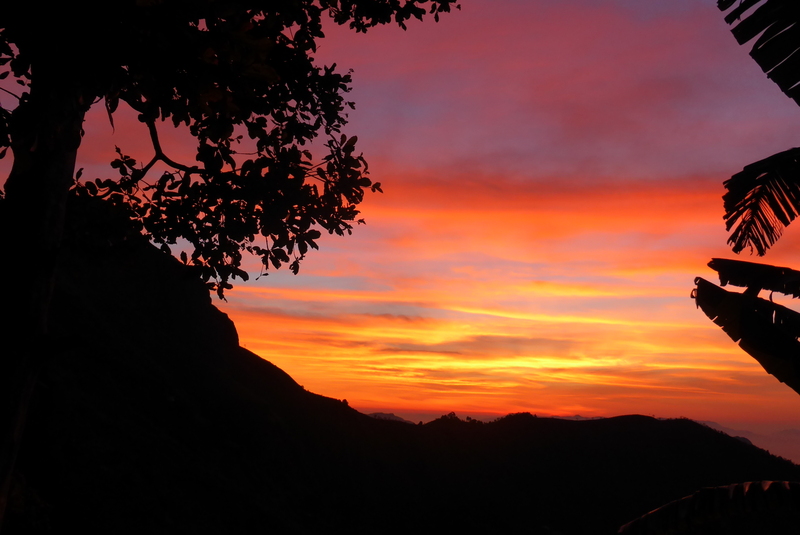 The temperatures soared, so it is magical to be up here in the mountains where the night air is crisp and the sunrises come on like an intergalactic firework show. This is a spectacular little farm and we are witnessing many positive projects in motion. 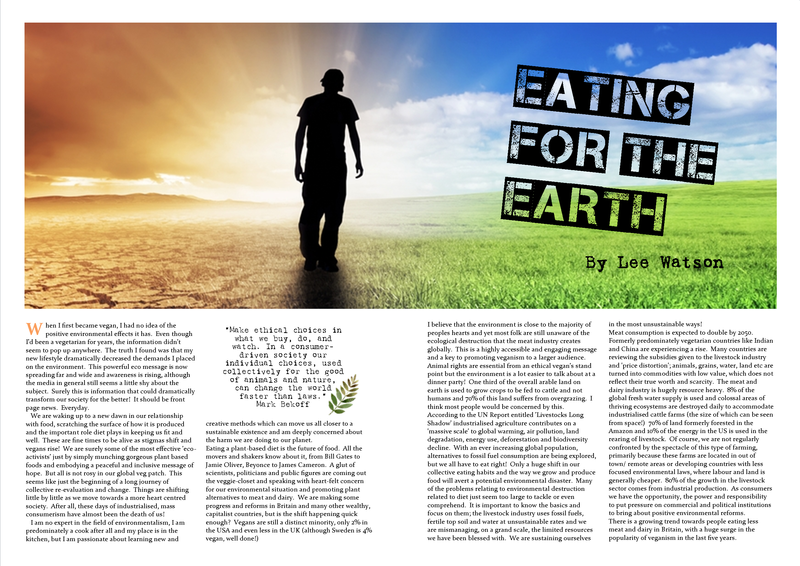 They are building earth ships, from recyclable car tyres and starting a permaculture project to supply the on-farm restaurant with some proper local produce. 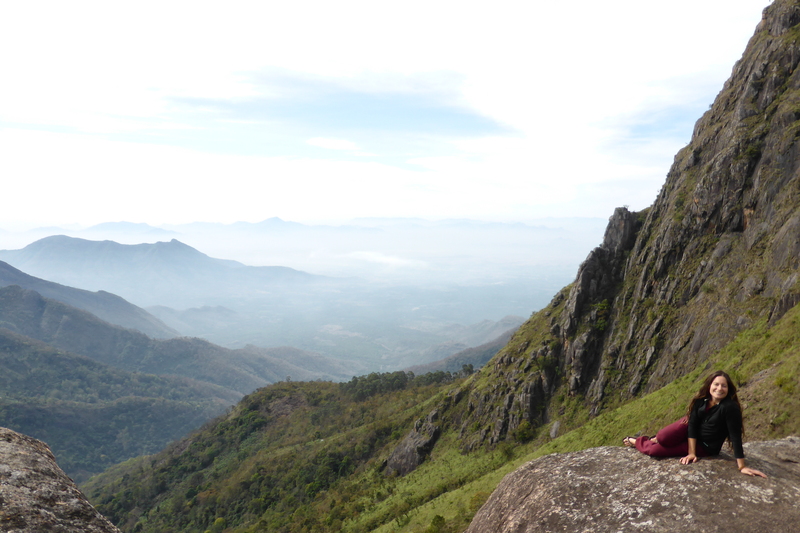 On Sunday, Jane and I ventured up to Kodai Kanala (the main town). 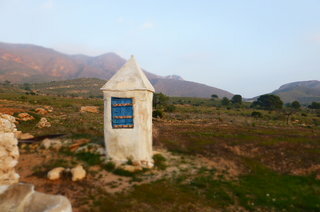 We walked through little villages, with many smiles greeting us, for 2 hours and then managed to catch a little rickety van the rest of the way to town (we’re quite remote here!). Kodai is an old British hill station, with many rock built chalets and a large dollop of Christianity. It is now a popular retreat for Indian honeymooners and surprisingly few gringos on the streets. 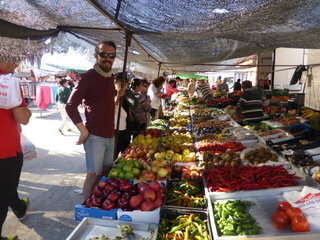 Sunday is market day and we spent most of it wandering around and ogling the local produce. Non of it organic, but all of it vibrant and full of potential. Our accommodation, a nice little cottage in a banana plantation, actually has a kitchen! 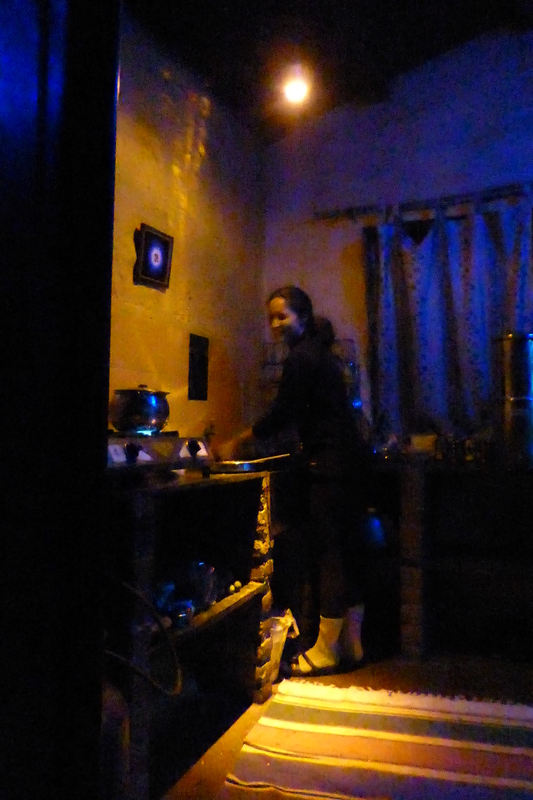 The first time we’ve been able to cook, apart from random cooking classes and making spicy tea with the chai wallas. I was so chuffed to be having a bash at the pots and pans again. 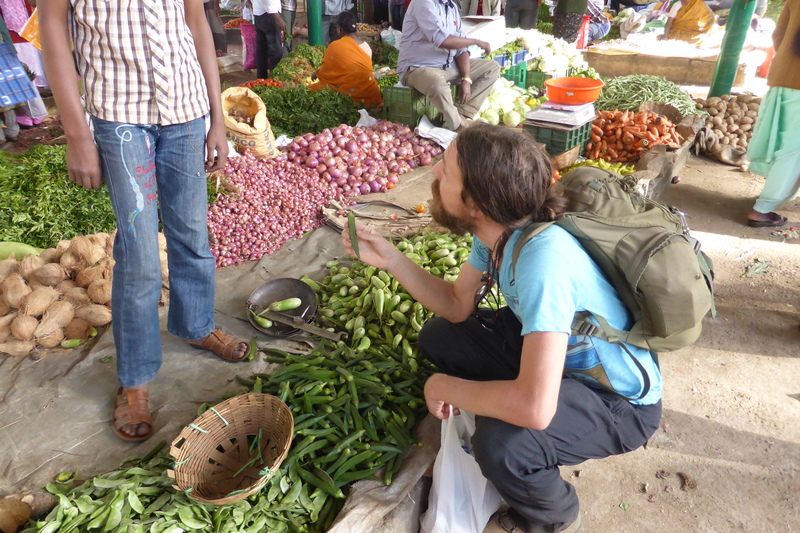 We filled our backpacks with veggies and fruits and have not looked back since. Internet in India is tough and I must apologise for the lack of BHK activity in recent times. 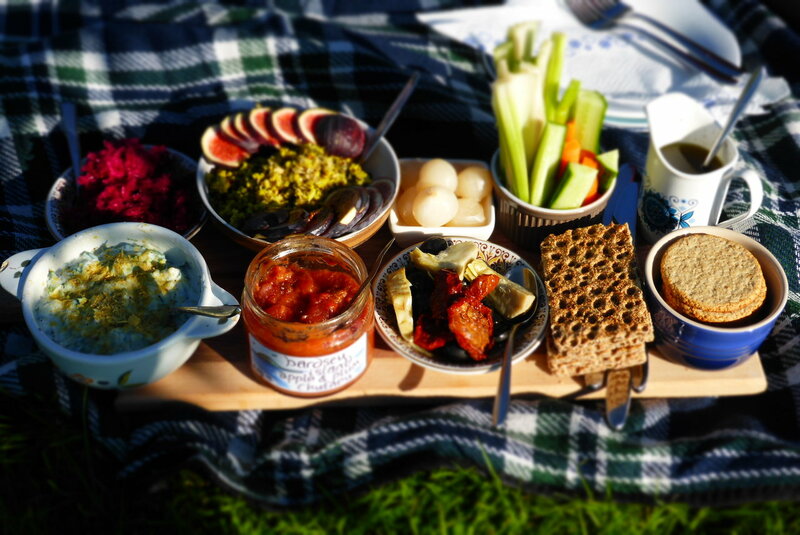 We have heads full of recipes and new ways of conjuring up tasty nibbles. We can’t wait to share them with you all from HQ (North Wales, which seems like a million and one miles away). Kala Chana (also Desi Chana or Bengal Gram) are brown chickpeas, unprocessed and packed with fibre. ‘Kala’ actually means black in Hindi and Urdu. They have more of a robust texture than your average chicker. This type of chana has been enjoyed all over the world for millenia, from ancient Rome, Persia and Greece, to Africa and Latin America. It has been used in British cooking since the middle ages. Chana is so versatile to a veggie cook, we can boil them, sprout them, roast them in the oven, make them into magic puree’s (like hummus) or even make desserts with them. We love this rough chana, especially in a dish with full flavoured veggies like cabbage and beetroot. A lovely old lady was selling these bok chois, we couldn’t resist them. I have never seen them cooked in India, but you wouldn’t expect us to be traditional now would you??!! This is a highly spiced dish, similar to chana masala in many ways. The spices are warming including cinnamon and cloves, making it very much north Indian fare. In the South we have been eating mainly coconuts and white rice, the staple down here. Generally lightly spiced bu heavy on the dried chilli. This dish, served with a massive salad, made a wonderful change and we actually cooked it ourselves! 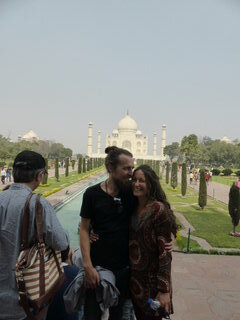 I have to say our bellies have not felt this good in the 2 month India adventure. Grating the veggies for the sauce (called a masala over here) gives the overall dish a smoother texture and helps to thicken things up. Of course, grating things unlocks the flavours of the veggies and means you don’t need to cook them for so long to get maximum flavour. I will be volunteering on an organic farm and cooking in a vegan kitchen soon, settling down a little. I imagine they will have internet and should catch up a little with the backlog of recipes and posts that have accumulated on my little computer gadget. There are some crackers! Drain your chickpeas and rinse. Place in a small saucepan and cover with 3 inches of water, bring to a boil and simmer with a lid on for 1 hour (or until nicely tender). Whilst they’re cooking, get your masala ready. In a frying pan, warm 1 tbs of oil, add the cumin seeds, cloves and cinnamon stick fry for a 30 seconds then add the onions. Fry all on a med high heat for 5 minutes, until golden. Add the garlic, ginger and beetroot, fry for 3 minutes, then add the carrots and cabbage. Stir well and warm through. Cook for 5 minutes and add the garam masala, chilli powder and tomato. Bring to a boil and cover. After 10 minutes cooking on a steady simmer, add 100ml water and stir, then recover. Cooking for another 10 minutes. The sauce should be nice and thick. Now add the masala to the chickpea pan, there should be some liquid left in the pan. Stir in and thin out the sauce with more water if needed. Check seasoning, adding salt and pepper. Be heavy on the pepper, chana masala loves pepper! In a small frying pan, warm 1 tbs oil and add the mustard seeds and curry leaves on medium heat. Let the splutter for 30 seconds and remove pan from the heat. Once the chickpeas are warm through, stir in the seasoned oil and serve. No lights in our cabin, but candles are better anyway. Kala Chana is very high in dietary fibre, one big bowlful of this curry with give women almost half of their daily intake of fibre (men a little less than that). These brown garbanzos are also high in protein and rich in minerals like iron, copper and manganese. Kala Chana is one of the earliest cultivated legumes, remains have been discovered dating back 7500 years! India is by far the biggest producer of chana in the world, Australia is the second, which I find surprising.